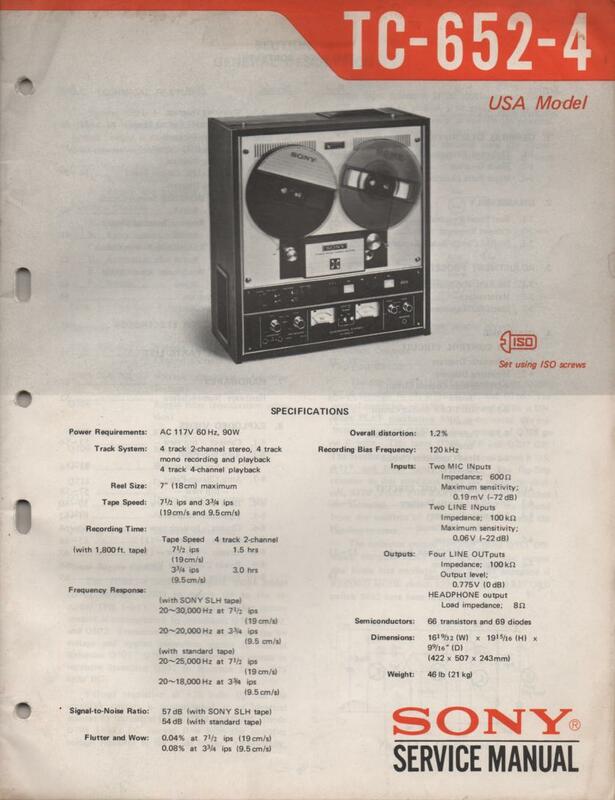 Manual AKAIGX-365D Reel to Reel Operators Manual PHOTO COPY! 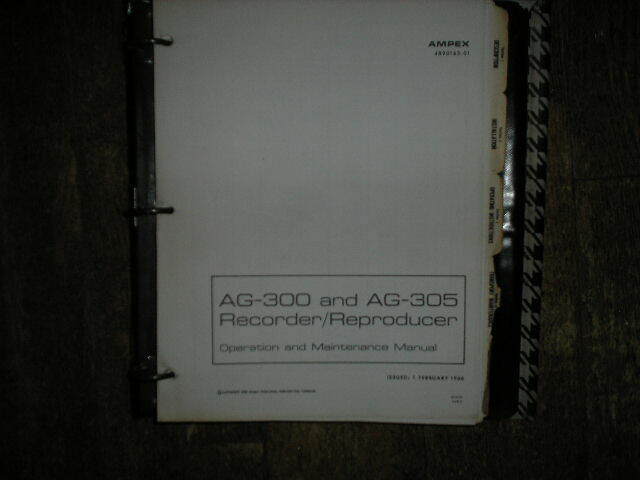 Manual AMPEXAG-300 AG-305 Recorder Reproducer Service Manual PHOTO COPY! Manual AMPEXAG-350 AG-355 Recorder Reproducer Service Manual PHOTO COPY! 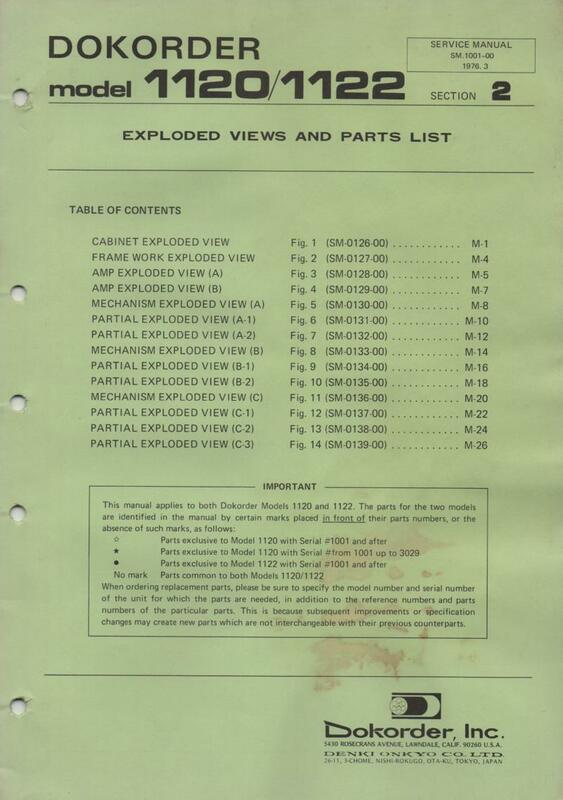 Manual AMPEXAG-440B AG-445B Recorder Operating and Service Instruction Manual.. Very large manual PHOTO COPY! Manual AMPEX900 Reel to Reel Service Manual PHOTO COPY! Manual AMPEX902 Reel to Reel Service Manual PHOTO COPY! Manual AMPEX904 Reel to Reel Service Manual PHOTO COPY! Manual AMPEX910 Reel to Reel Service Manual PHOTO COPY! Manual AMPEX920 Reel to Reel Service Manual PHOTO COPY! Manual AMPEX934 Reel to Reel Service Manual PHOTO COPY! Manual AMPEX936 Reel to Reel Service Manual PHOTO COPY! Manual AMPEX950 Reel to Reel Service Manual PHOTO COPY! Manual AMPEX952 Reel to Reel Service Manual PHOTO COPY! Manual AMPEX954 Reel to Reel Service Manual PHOTO COPY! Manual AMPEX960 Reel to Reel Service Manual PHOTO COPY! Manual AMPEX970 Reel to Reel Service Manual PHOTO COPY! Manual AMPEX985 Reel to Reel Service Manual PHOTO COPY! Manual AMPEXA-111 Reel to Reel Service Manual PHOTO COPY! Manual AMPEXA-112 Reel to Reel Service Manual PHOTO COPY! 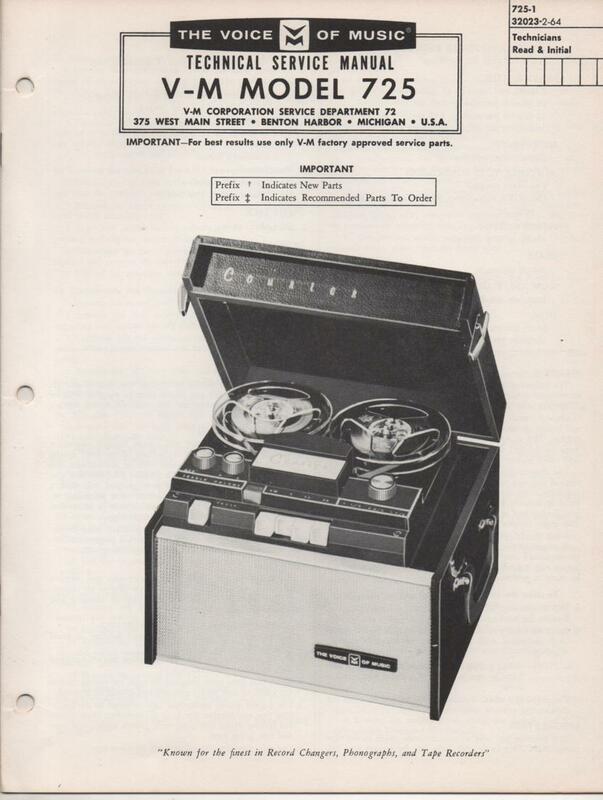 Manual AMPEXA-114 Reel to Reel Service Manual PHOTO COPY! Manual AMPEXA-121B Reel to Reel Service Manual PHOTO COPY! Manual AMPEXA-121T Reel to Reel Service Manual PHOTO COPY! 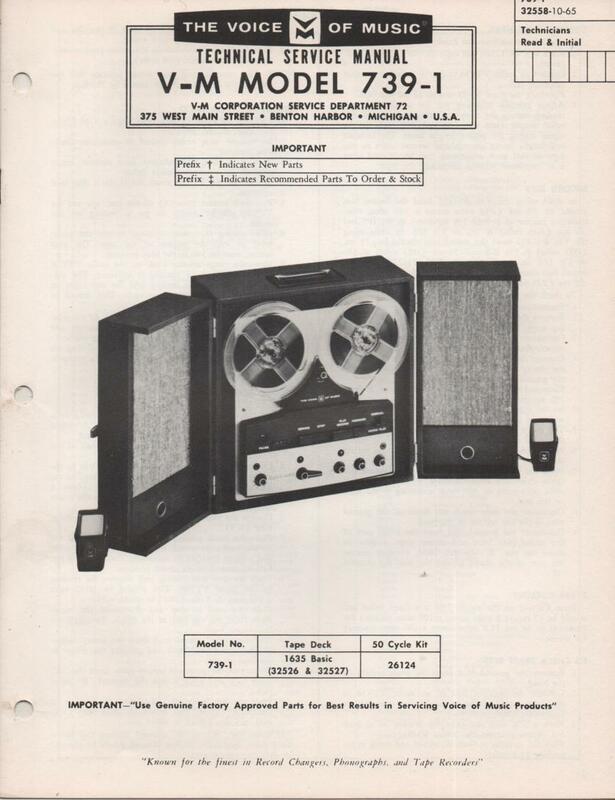 Manual AMPEXA-121W Reel to Reel Service Manual PHOTO COPY! Manual AMPEXA-122 Reel to Reel Service Manual PHOTO COPY! Manual AMPEXA-124 Reel to Reel Service Manual PHOTO COPY! Manual AMPEX1250 Reel to Reel Service Manual PHOTO COPY! Manual AMPEX1260 Reel to Reel Service Manual PHOTO COPY! Manual AMPEX1270 Reel to Reel Service Manual PHOTO COPY! 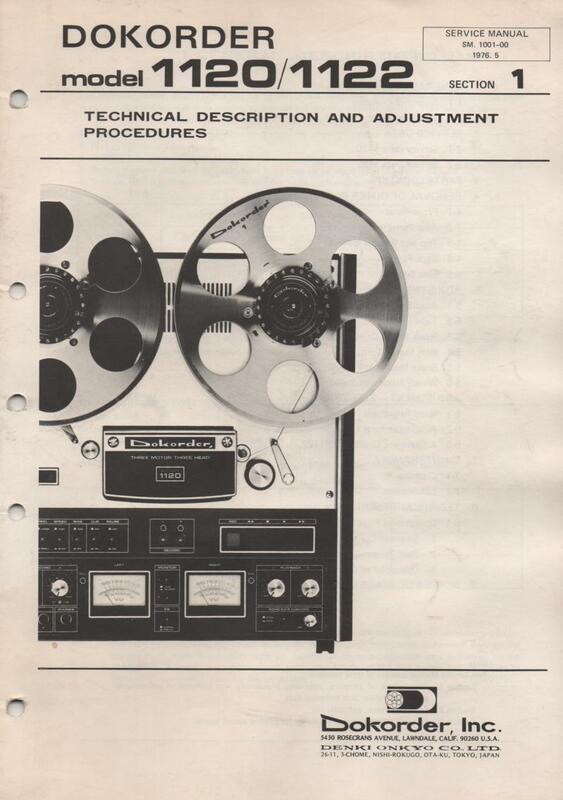 Manual AMPEX300 Series Recorder Operating and Service Instruction Manual.. Very large manual PHOTO COPY! 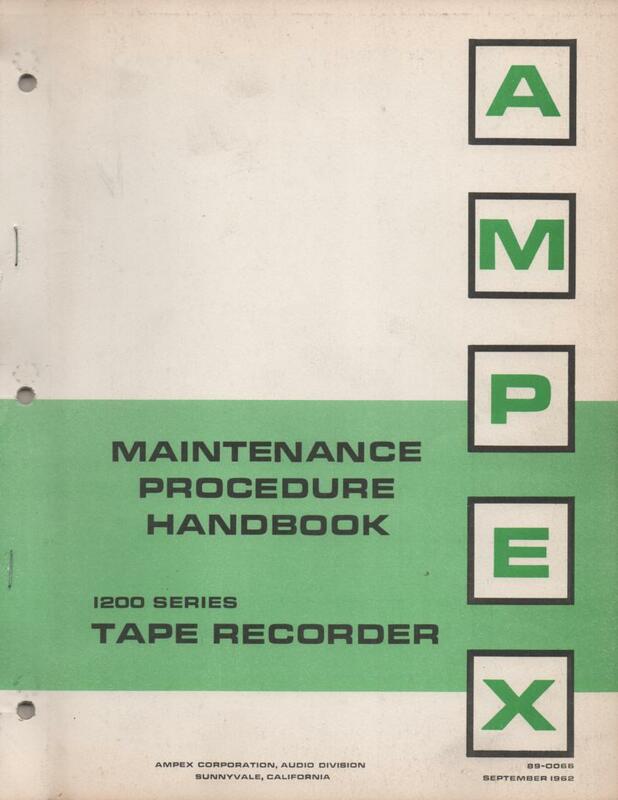 Manual AMPEX354 Recorder Operating and Service Instruction Manual.. Very large manual PHOTO COPY! Manual AMPEX400A Recorder Operating and Service Instruction Manual.. PHOTO COPY! 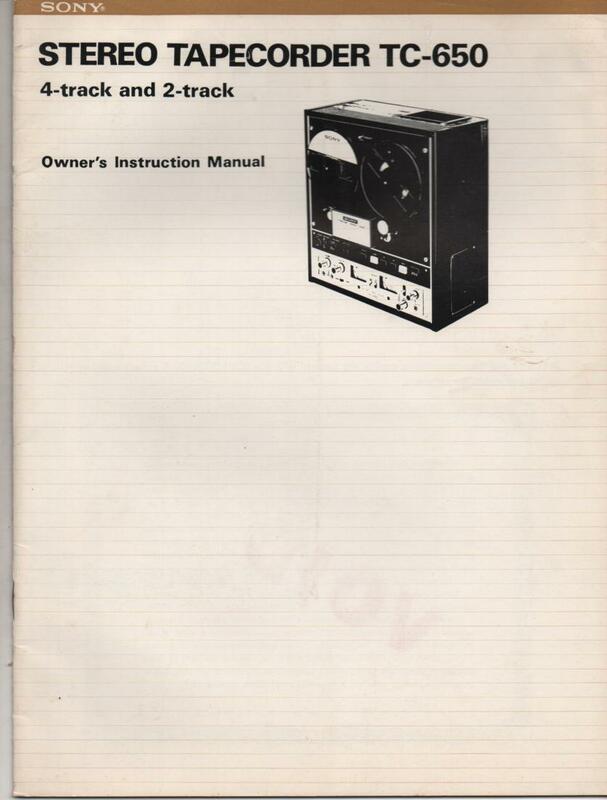 Manual AMPEX400A 401A Recorder Operating and Service Instruction Manual.. PHOTO COPY! 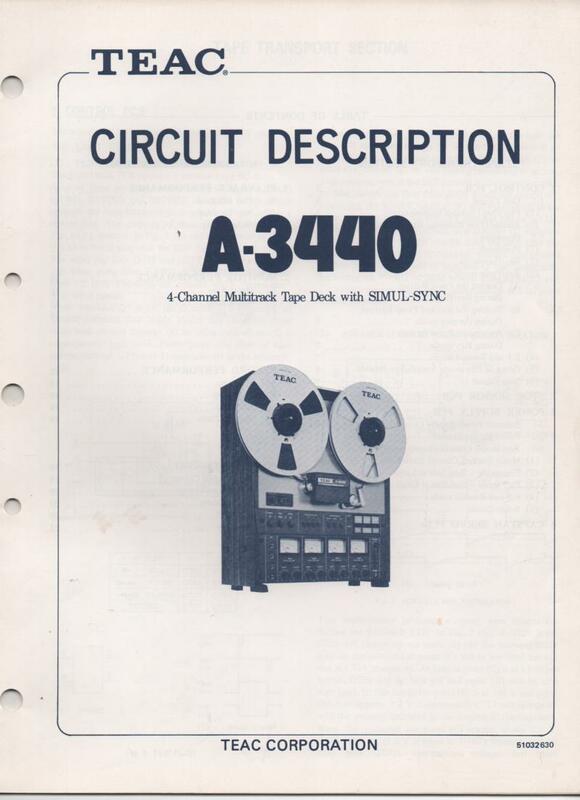 Manual AMPEX400A 401A 402 Recorder Operating and Service Instruction Manual.. PHOTO COPY! 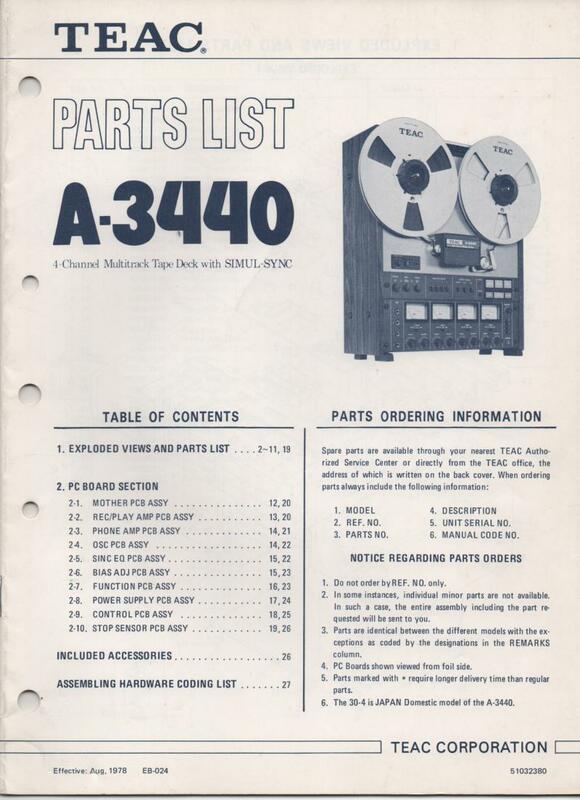 Manual AMPEX400A 401A 402 403 Recorder Operating and Service Instruction Manual.. PHOTO COPY! Manual AMPEX600 Recorder Operating and Service Instruction Manual..Blue PHOTO COPY! Manual AMPEX600 Recorder Operating and Service Instruction Manual.. Grey PHOTO COPY! Manual AMPEX850 Recorder Operating and Service Instruction Manual.. PHOTO COPY! Manual AMPEX850 860 Recorder Operating and Service Instruction Manual.. PHOTO COPY! Manual AMPEX850 860 865 Recorder Operating and Service Instruction Manual.. PHOTO COPY! 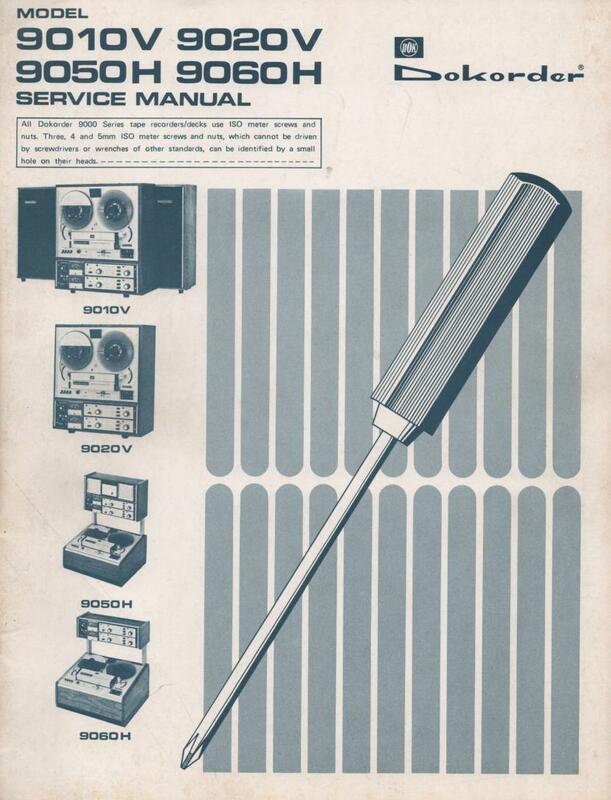 Manual AMPEXAV770 Recorder Service Manual.. contains schematic and parts list only PHOTO COPY! 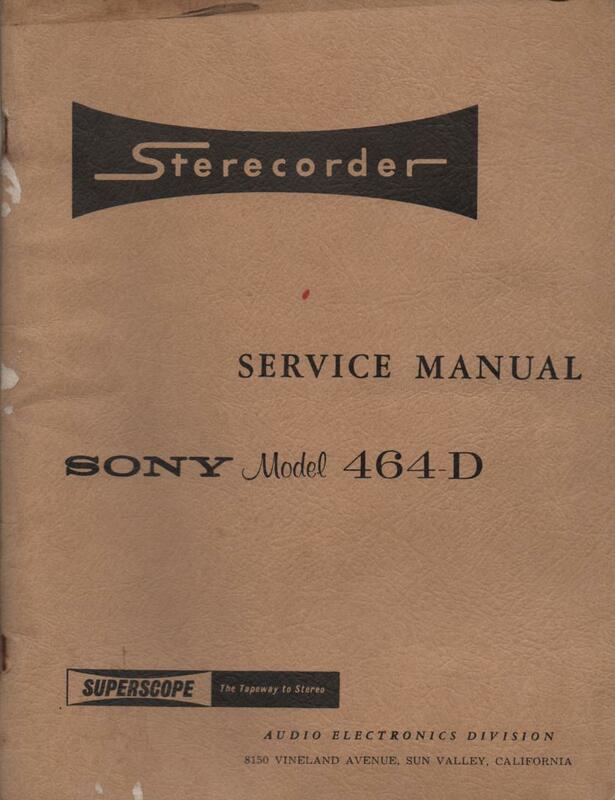 Manual AMPEXF-44 Recorder Service Manual.. PHOTO COPY! Manual AMPEXSA-10 Recorder Service Manual.. PHOTO COPY! 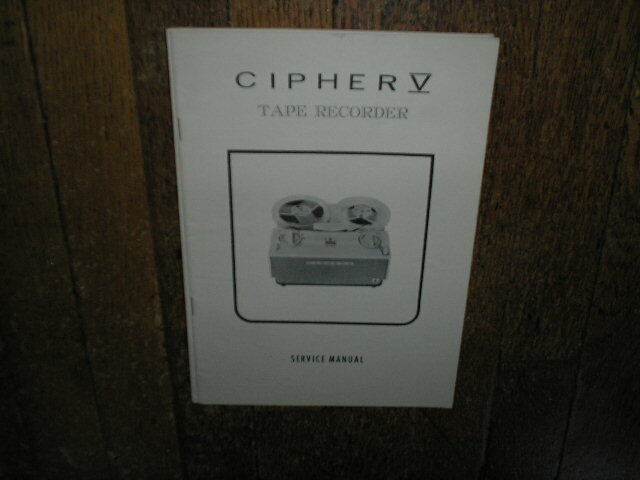 Manual CIPHERCipher 5 V Reel to Reel Tape Recorder Service Manual PHOTO COPY! 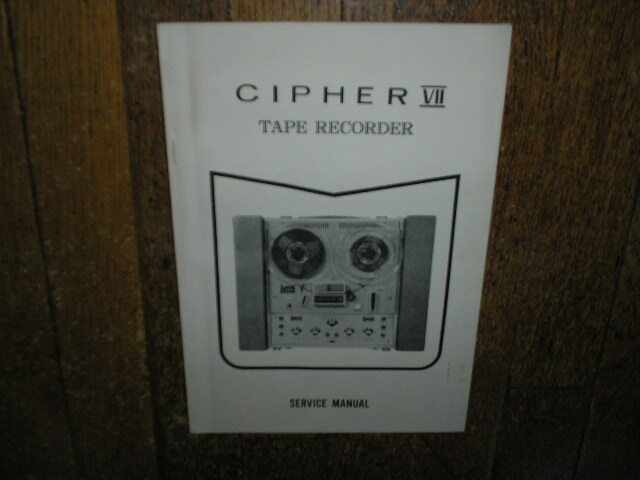 Manual CIPHERCipher 7 VII Reel to Reel Tape Recorder Service Manual PHOTO COPY! Manual Crown700 Reel to Reel Transport Operating Service Manual PHOTO COPY! 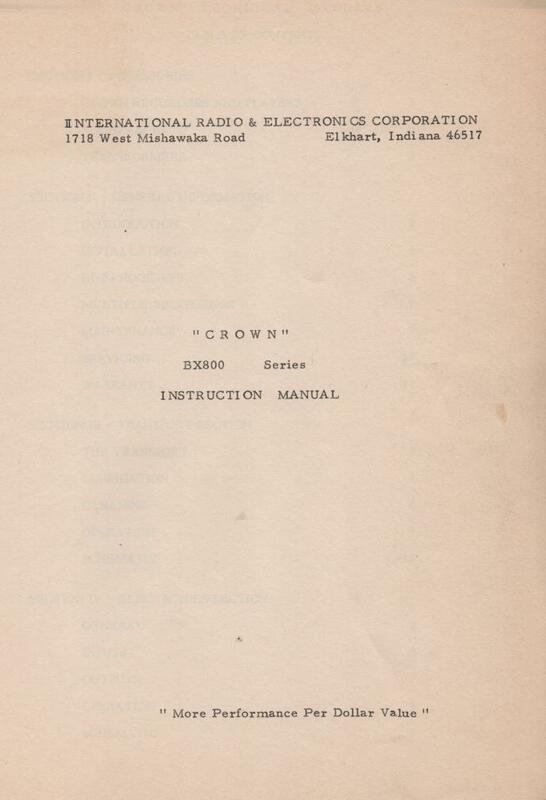 Manual Crown800 800C Owners Operating Instruction Service Manual PHOTO COPY! 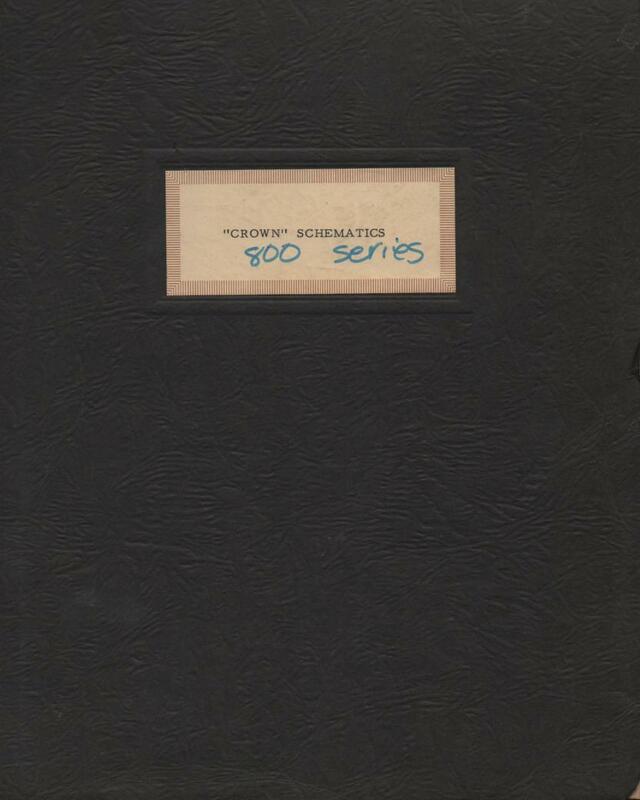 Manual Crown800 800C Series Schematics Service Manual PHOTO COPY! 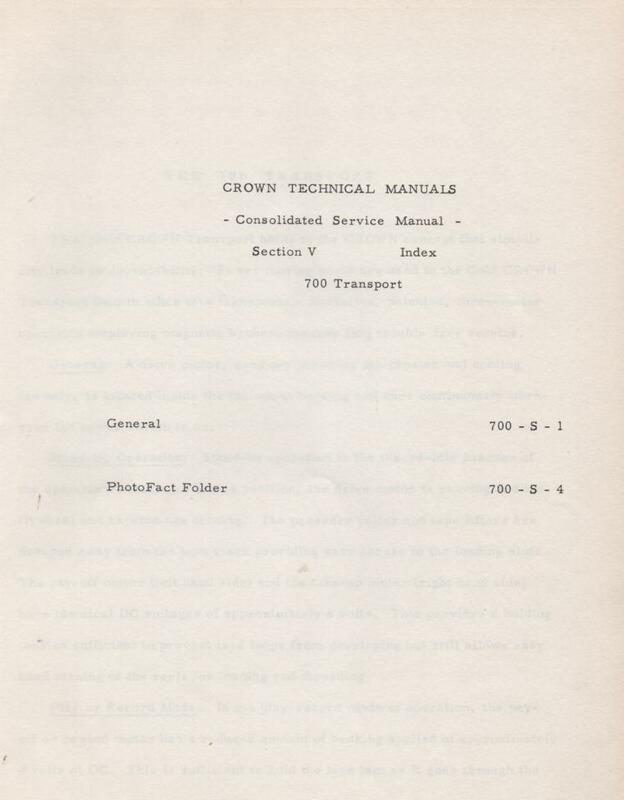 Manual Crown800B Transport Operation Manual PHOTO COPY! 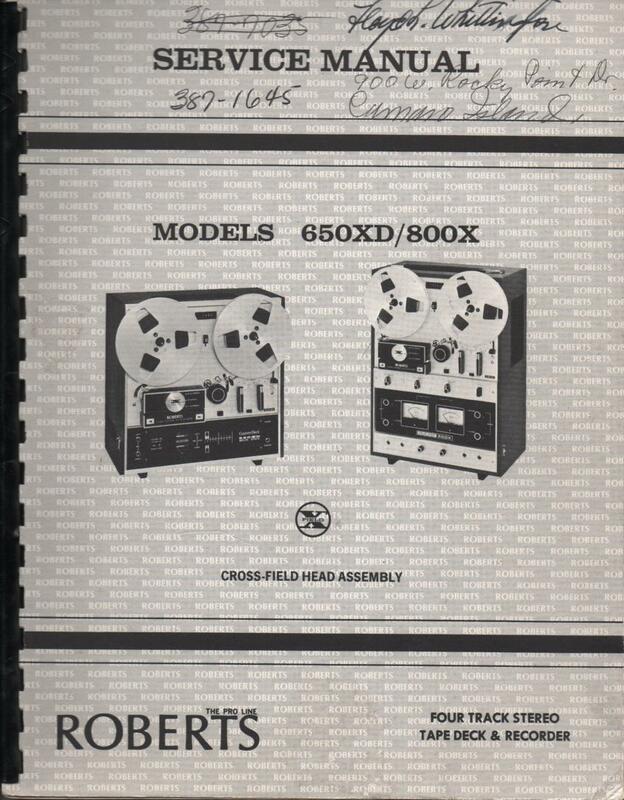 Manual CrownBX800 Reel to Reel Owners Service Manual PHOTO COPY! 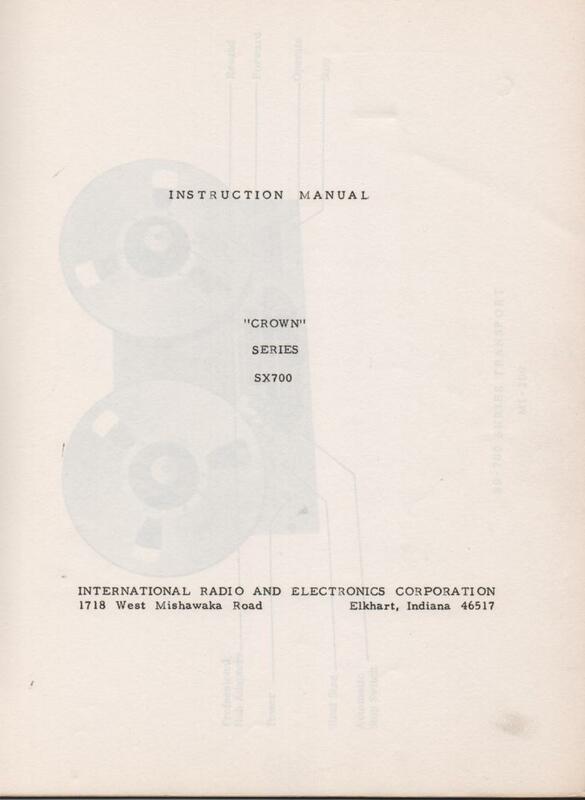 Manual CrownCrown O Matic Reel to Reel Transport Operating Manual PHOTO COPY! 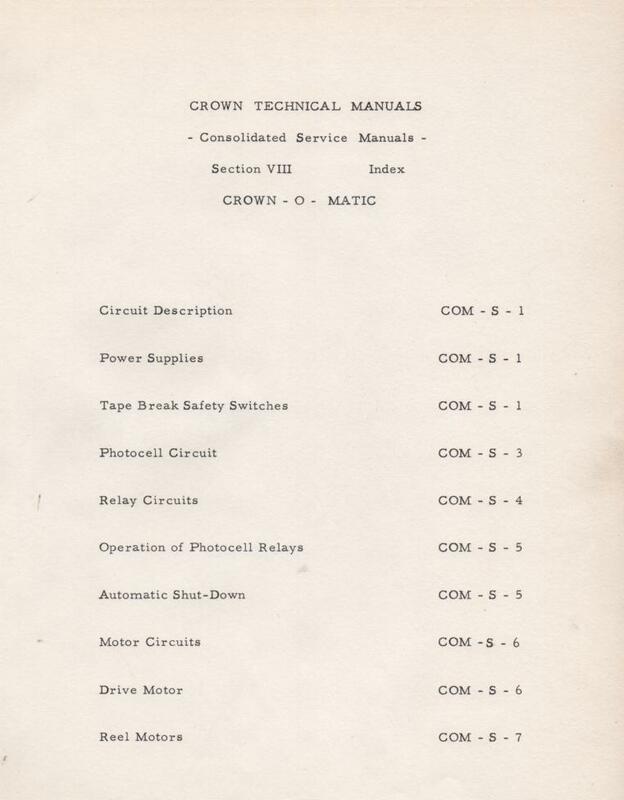 Manual CrownMus O Matic Transport Operating Manual PHOTO COPY! 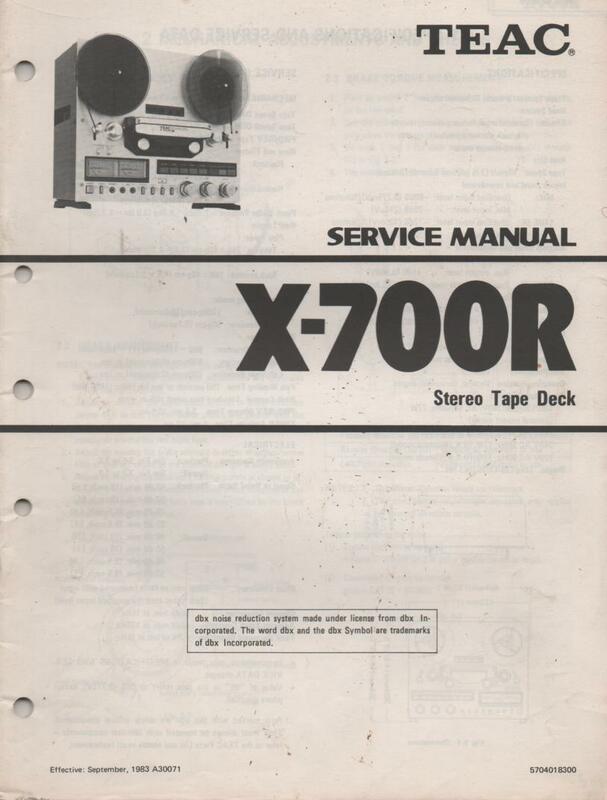 Manual CrownSX-700 Reel to Reel Owners Service Manual PHOTO COPY! 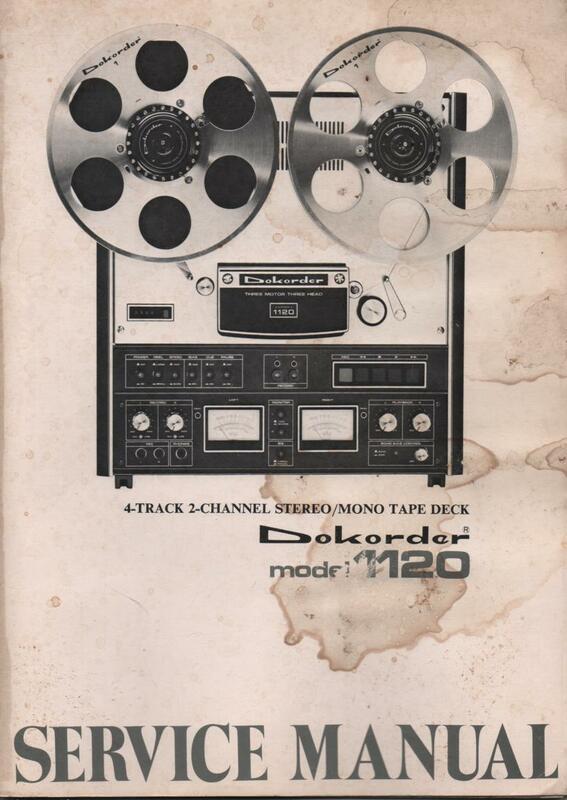 Manual Dokorder1120 Reel to Reel Service Manual PHOTO COPY! Manual Dokorder1120 1122 Reel to Reel Parts Diagram Service Manual PHOTO COPY! 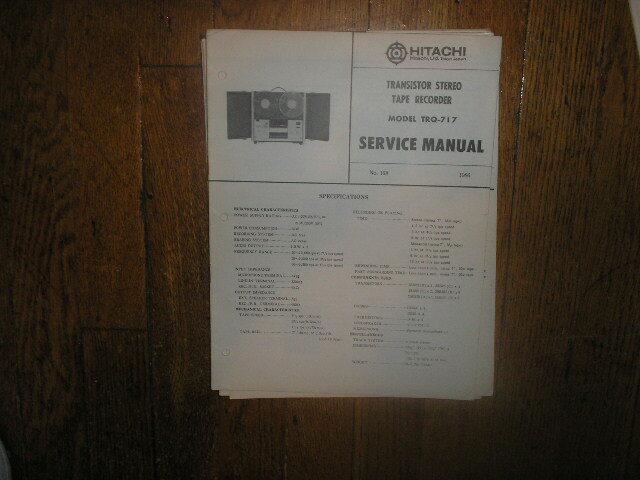 Manual Dokorder1120 1122 Reel to Reel Technical Adjustment Service Manual PHOTO COPY! 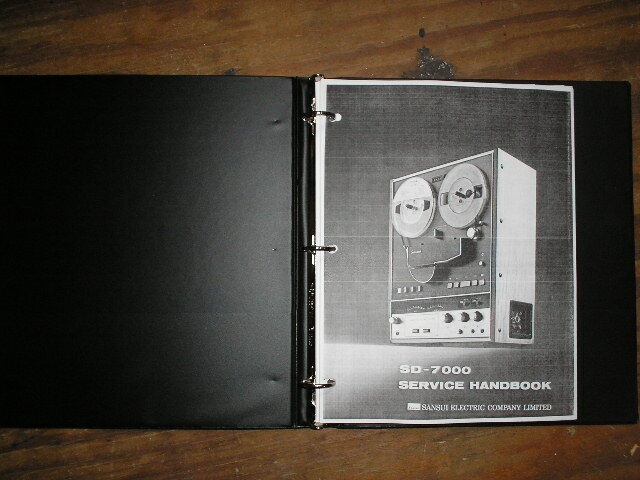 Manual Dokorder7100 Reel to Reel Service Manual PHOTO COPY! 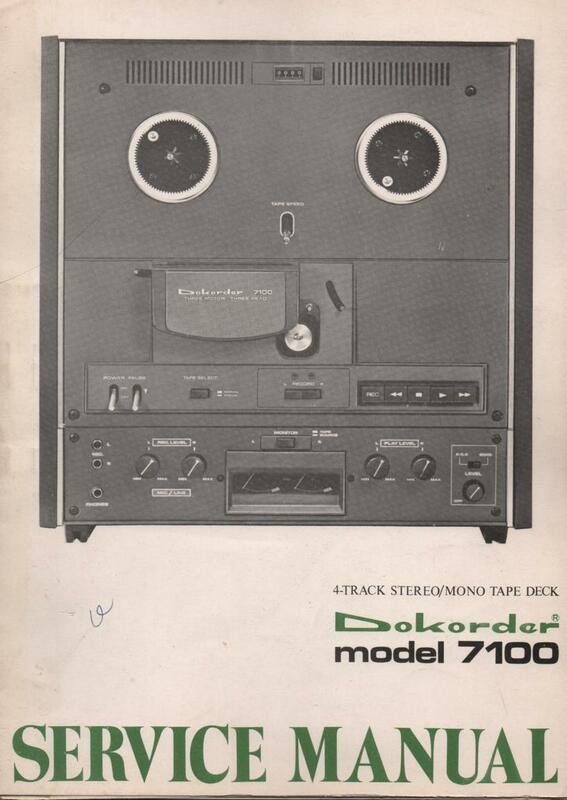 Manual Dokorder7700 Reel to Reel Service Exploded Views and Parts Manual 2 PHOTO COPY! Manual Dokorder8010 8020 Reel to Reel Service Manual PHOTO COPY! 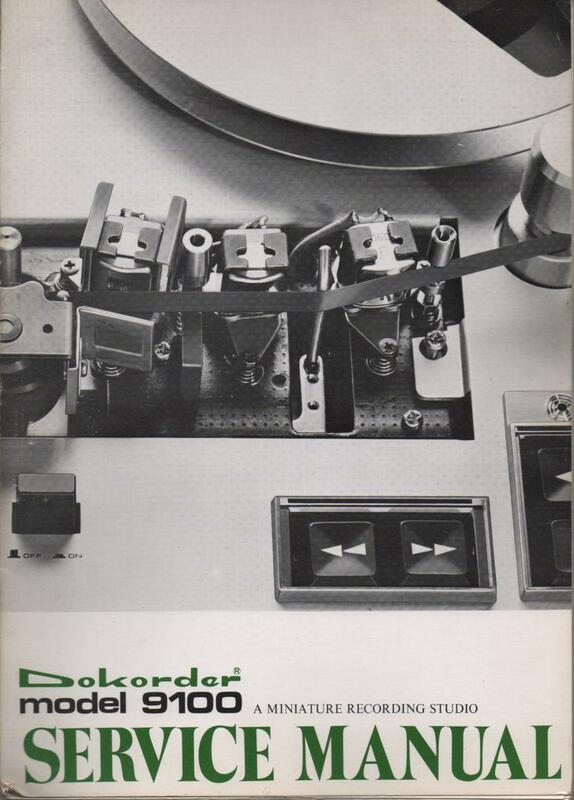 Manual Dokorder9100 Reel to Reel Service Manual PHOTO COPY! 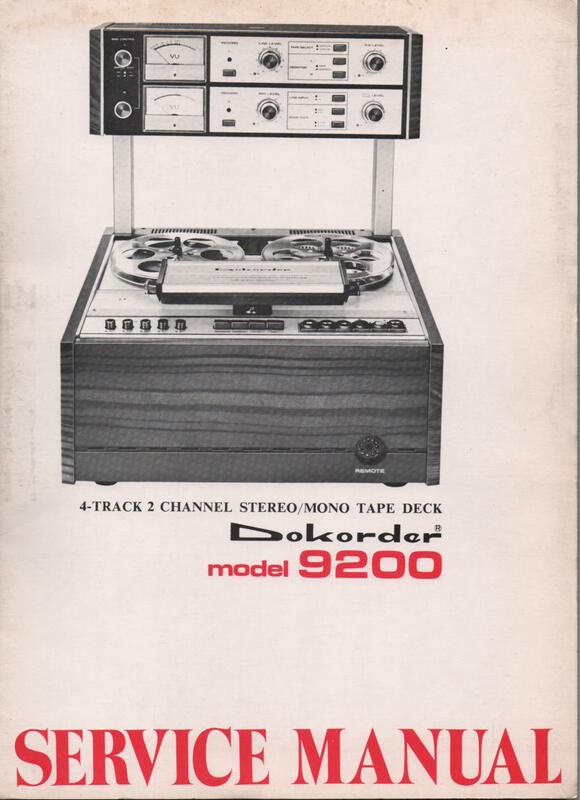 Manual Dokorder9200 Reel to Reel Service Manual PHOTO COPY! 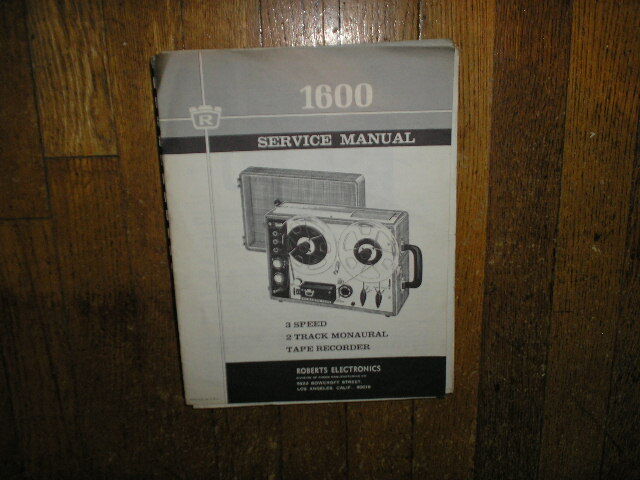 Manual Dokorder6010 6020 Reel to Reel Service Manual PHOTO COPY! 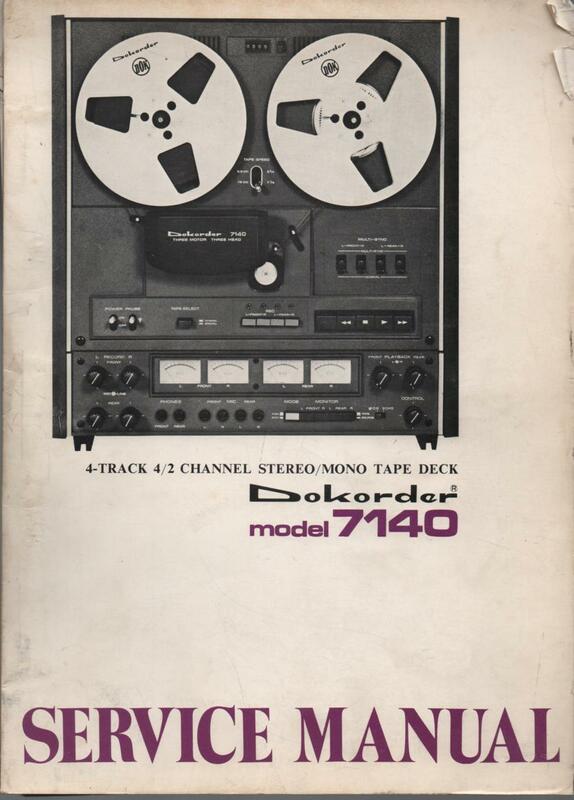 Manual Dokorder7140 Reel to Reel Service Manual PHOTO COPY! 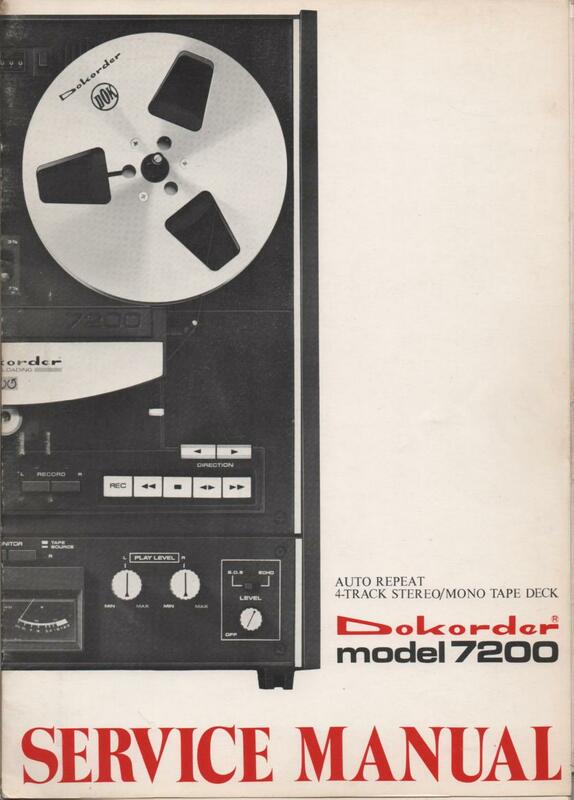 Manual Dokorder7200 Reel to Reel Service Manual PHOTO COPY! 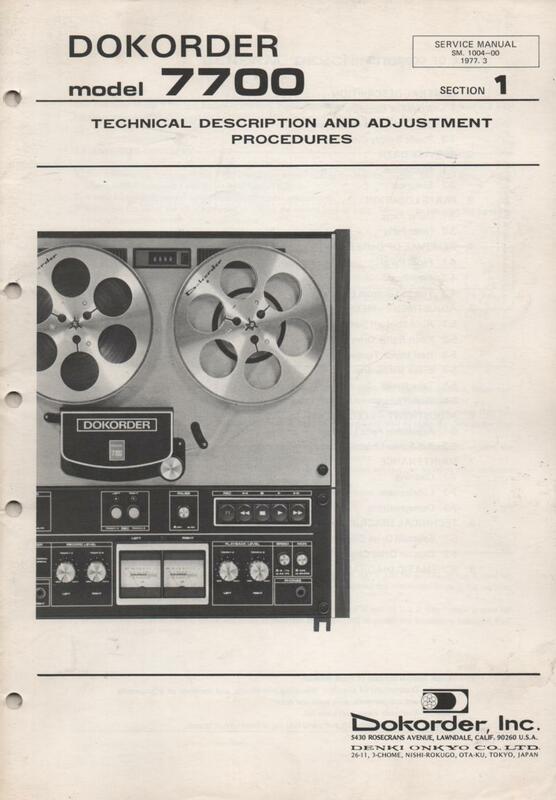 Manual Dokorder7700 Reel to Reel Technical Alignment Service Manual 1 PHOTO COPY! 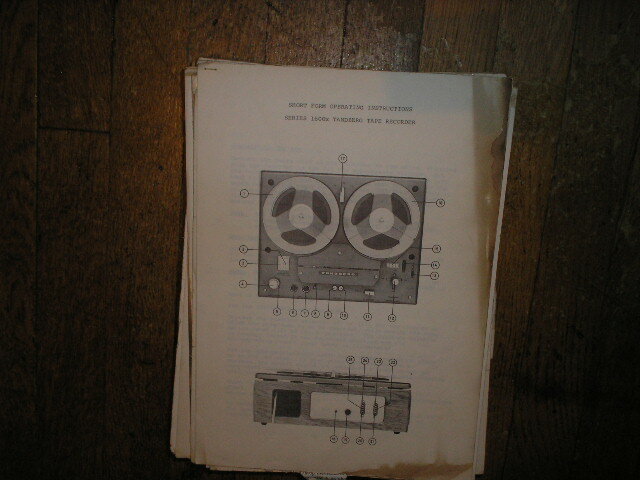 Manual Dokorder7700 Reel to Reel Schematic and Board Service Manual 3 PHOTO COPY! 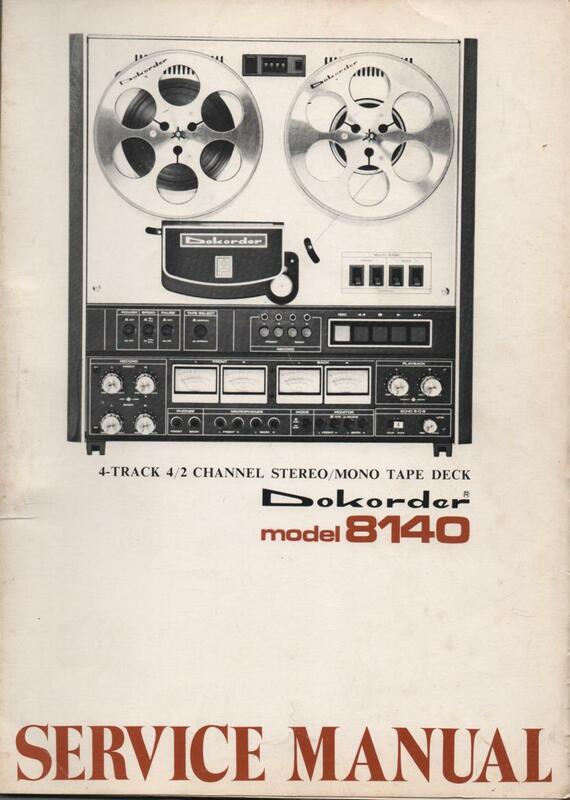 Manual Dokorder8140 Reel to Reel Service Manual PHOTO COPY! 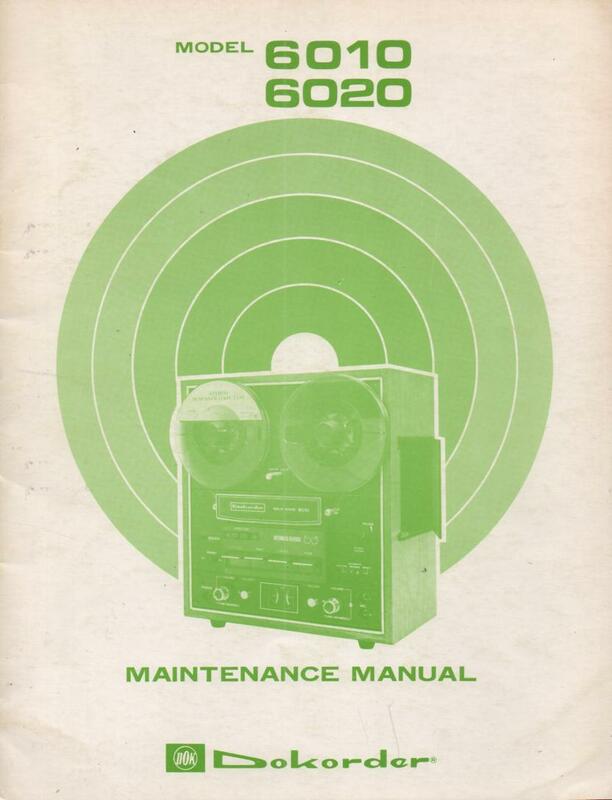 Manual Dokorder9010V 9020V 9050H 9060H Reel to Reel System Service Manual PHOTO COPY! 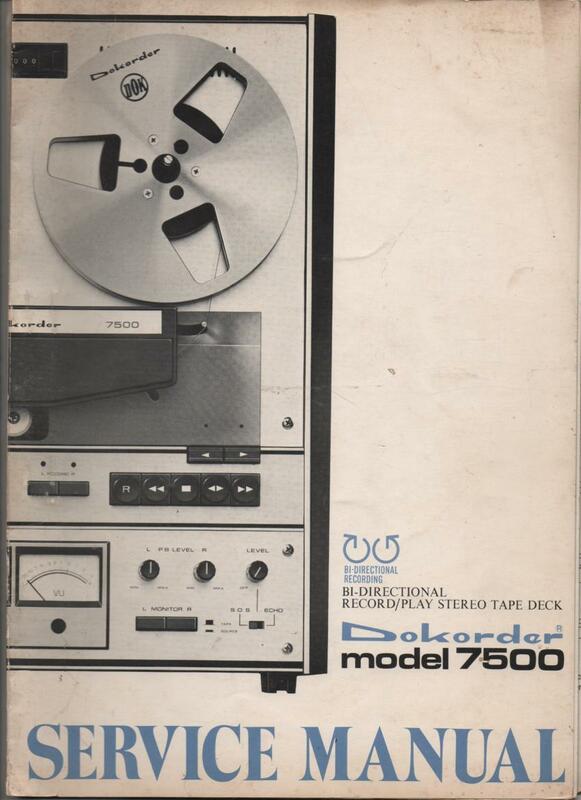 Manual Dokorder7500 Bi-Directional Reel to Reel Service Manual PHOTO COPY! 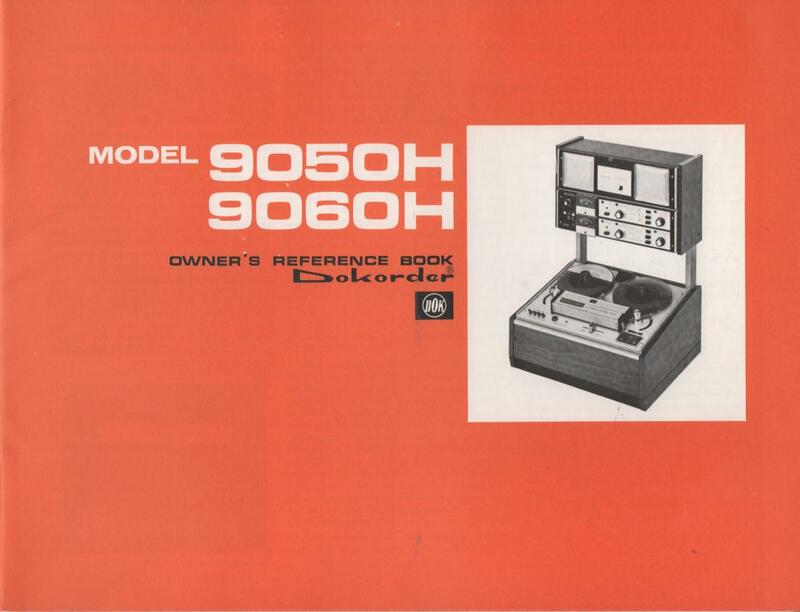 Manual Dokorder9050H 9060H 4 Track Recorder Owners Operating Instruction Manual PHOTO COPY! 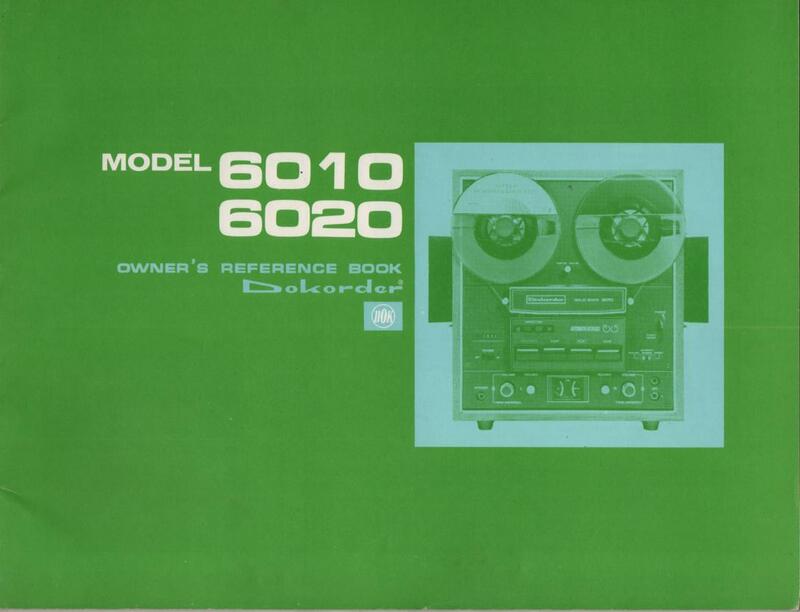 Manual Dokorder6010 6020 Reel to Reel Owners Manual PHOTO COPY! 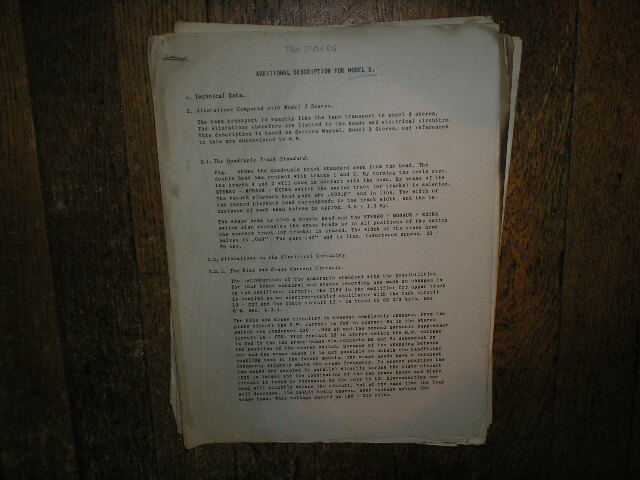 Manual DualTG 27 Reel to Reel Service Manual. PHOTO COPY! 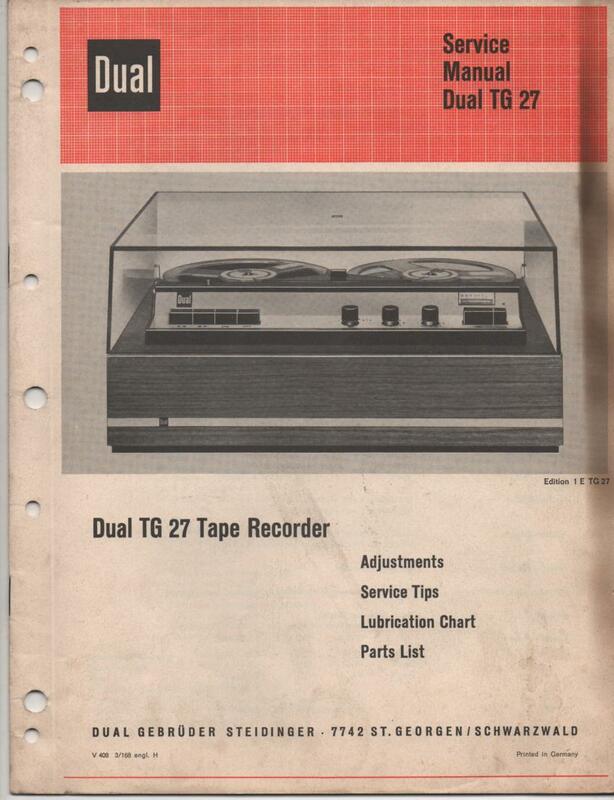 Manual DualTG-28 Reel to Reel Service Manual PHOTO COPY! 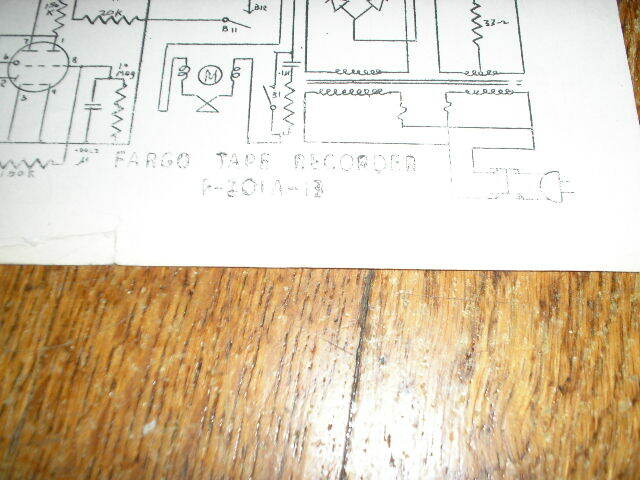 Manual FARGOF-301A-13 Tape Recorder Schematic PHOTO COPY! 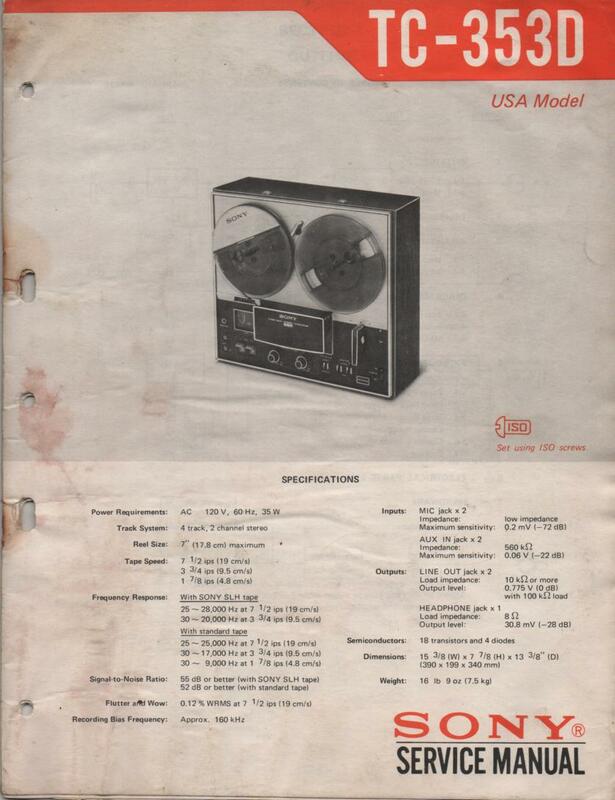 Manual FerrographSeries Seven Reel to Reel Operator and Service Manual with parts list and large foldout schematic PHOTO COPY! 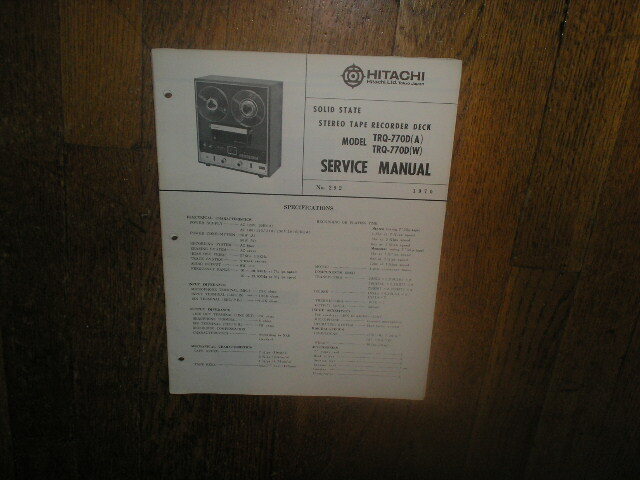 Manual HitachiTRQ-380 Reel to Reel Tape Recorder Service Manual PHOTO COPY! 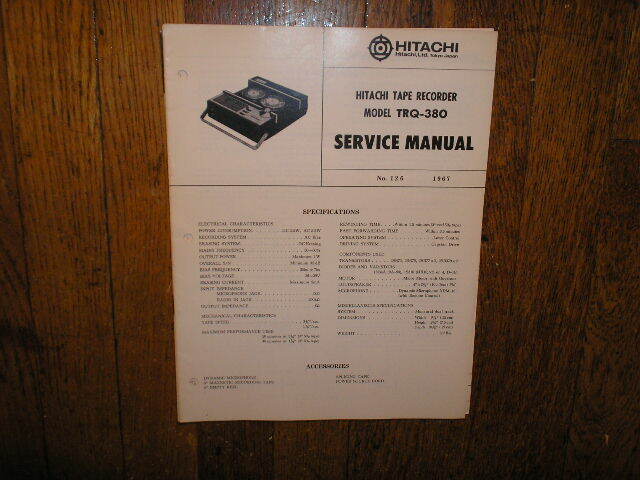 Manual HitachiTRQ-700 Reel to Reel Tape Recorder Service Manual PHOTO COPY! 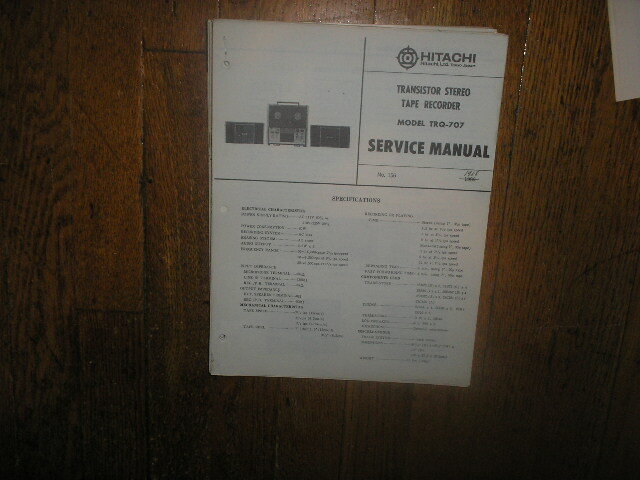 Manual HitachiTRQ-707 Reel to Reel Tape Recorder Service Manual PHOTO COPY! 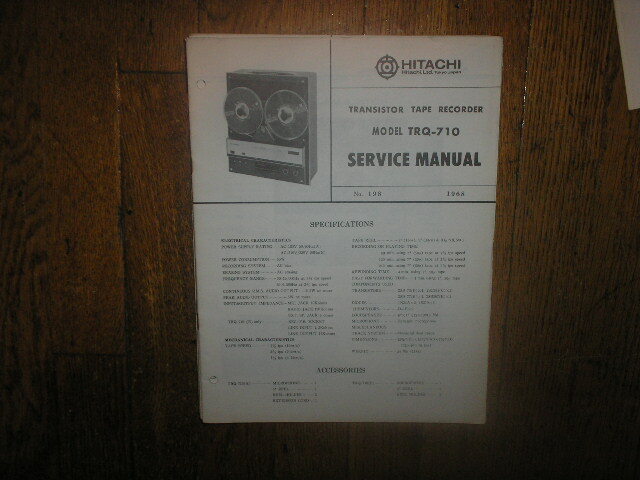 Manual HitachiTRQ-710 Reel to Reel Tape Recorder Service Manual PHOTO COPY! 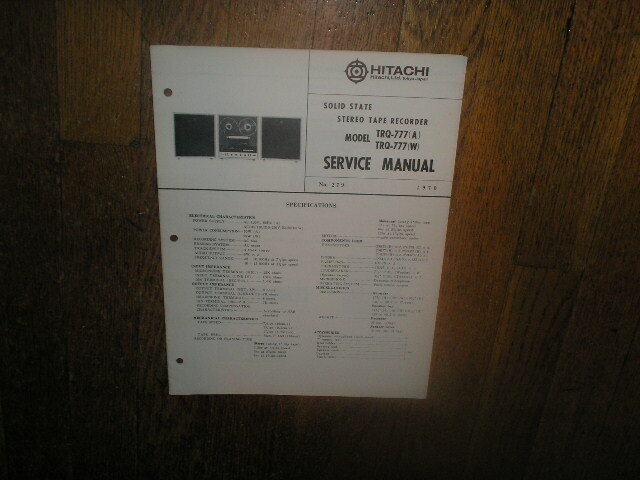 Manual HitachiTRQ-717 Reel to Reel Tape Recorder Service Manual PHOTO COPY! 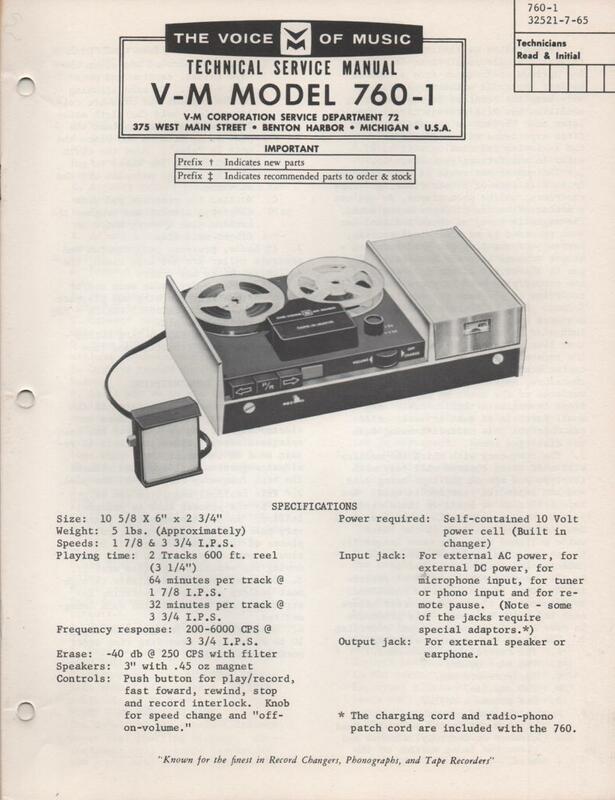 Manual HitachiTRQ-770D A W Reel to Reel Tape Recorder Service Manual PHOTO COPY! 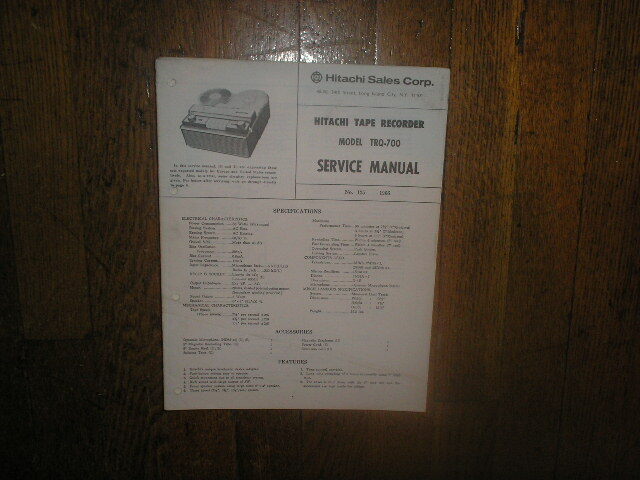 Manual HitachiTRQ-777D A W Reel to Reel Tape Recorder Service Manual PHOTO COPY! 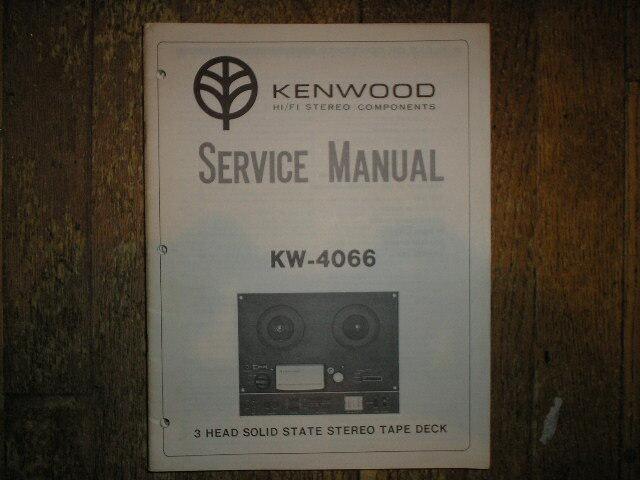 Manual KenwoodKW-4066 Reel to Reel Service Manual PHOTO COPY! 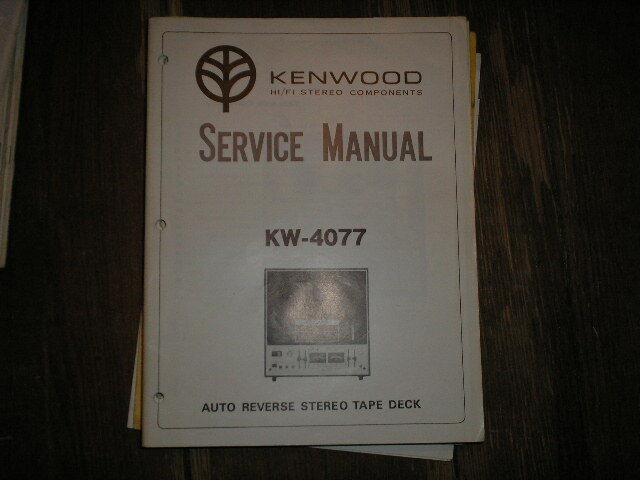 Manual KenwoodKW-4077 Reel to Reel Service Manual PHOTO COPY! 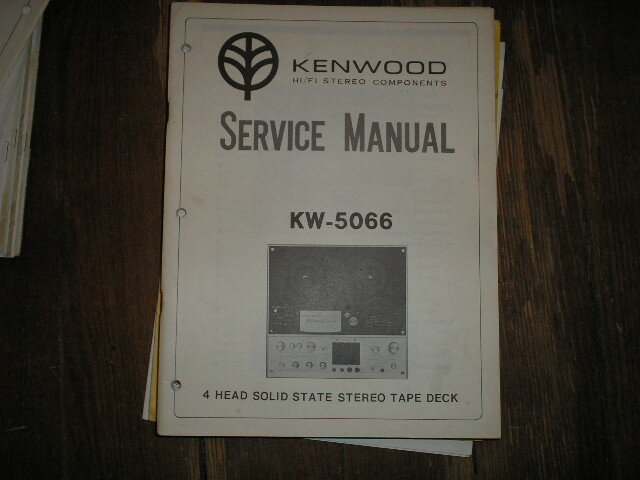 Manual KenwoodKW-5066 Reel to Reel Service Manual PHOTO COPY! 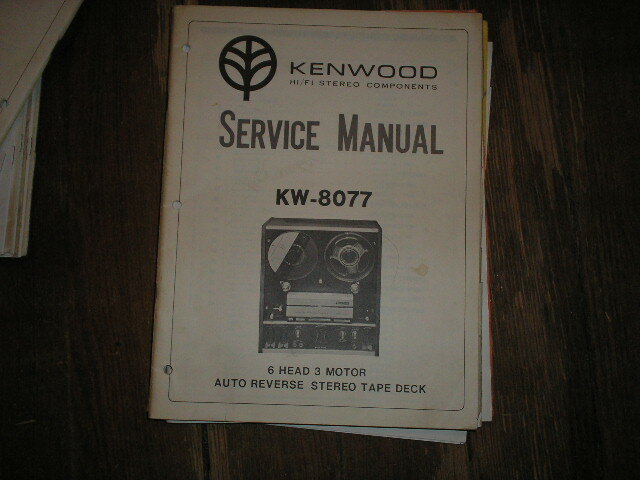 Manual KenwoodKW-8077 Reel to Reel Service Manual PHOTO COPY! 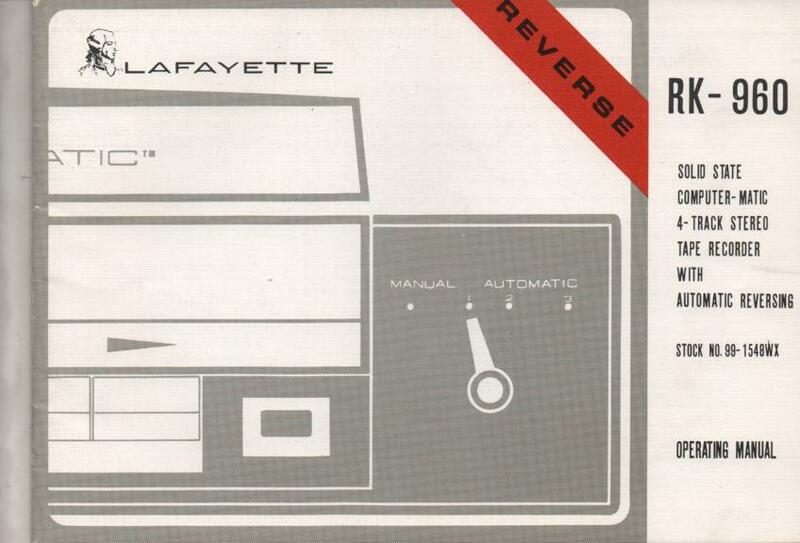 Manual LAFAYETTERK-33 Tape Recorder Owners Service Manual. Owners Mnul with schematic. Stock No. 99-1561L . PHOTO COPY! 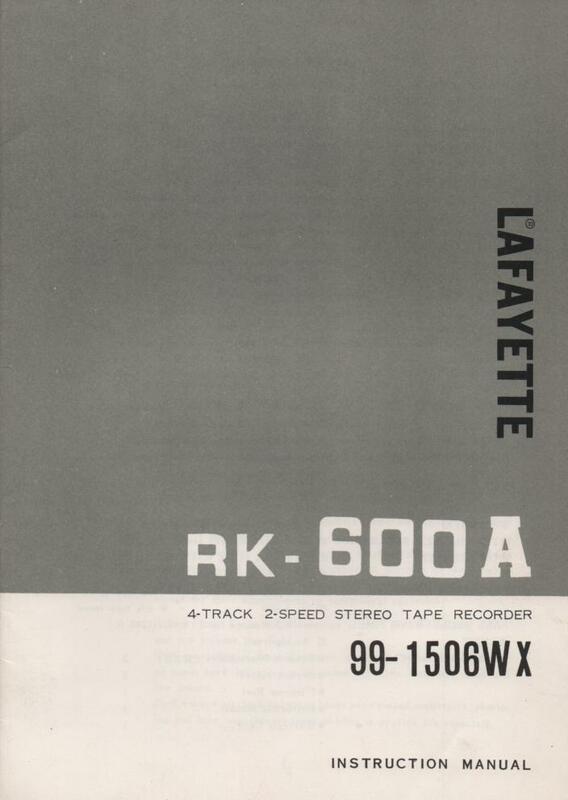 Manual LAFAYETTERK 600A Reel to Reel Owners Service Manual. Owners manual with schematic. Stock No. 99-1506WX . PHOTO COPY! 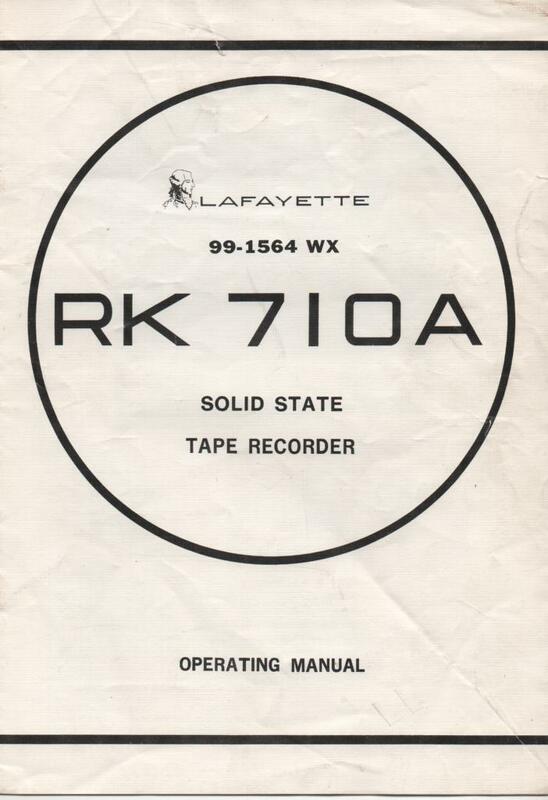 Manual LAFAYETTERK-710A Reel to Reel Service Manual PHOTO COPY! 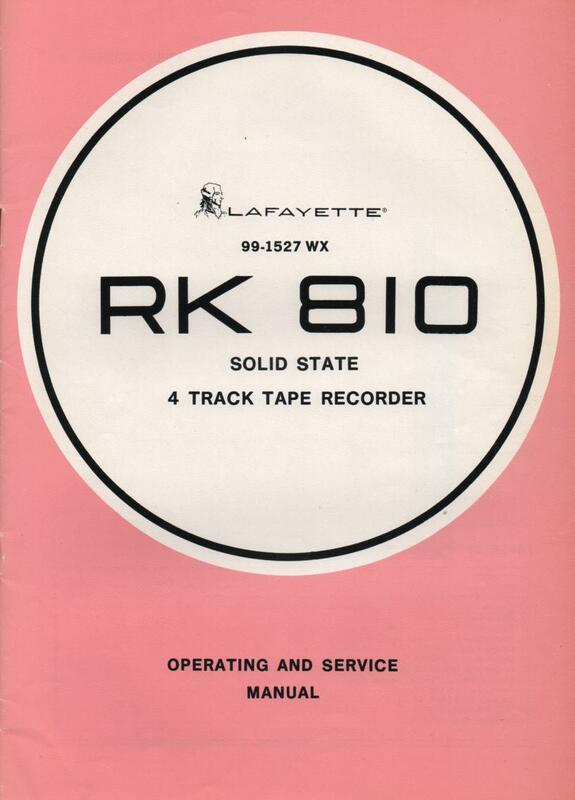 Manual LAFAYETTERK-710A Reel to Reel Owners Manual. With schematic and parts list. PHOTO COPY! Manual LAFAYETTERK-810 Reel to Reel Owners Service Manual with schematic. PHOTO COPY! 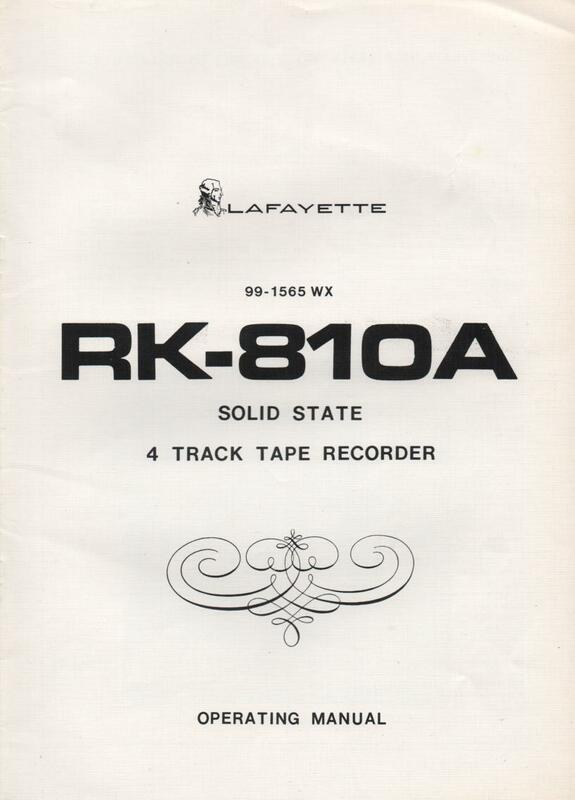 Manual LAFAYETTERK-810A Reel to Reel Owners Manual with schematic.. Stock No. 99-1565WX . PHOTO COPY! 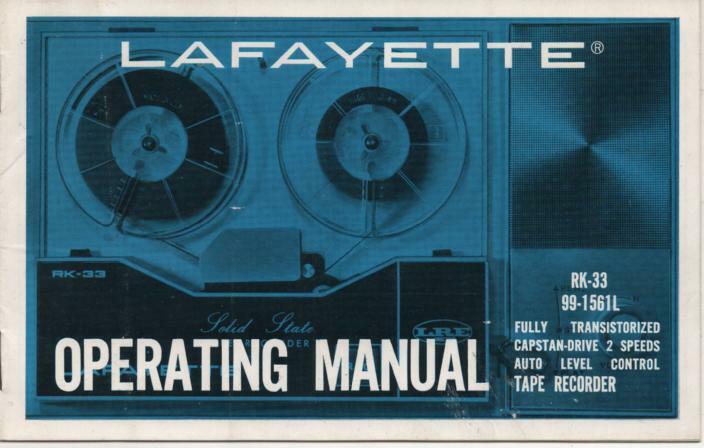 Manual LAFAYETTERK-810A Reel to Reel Service Manual with schematic.. Stock No. 99-15653WX . PHOTO COPY! 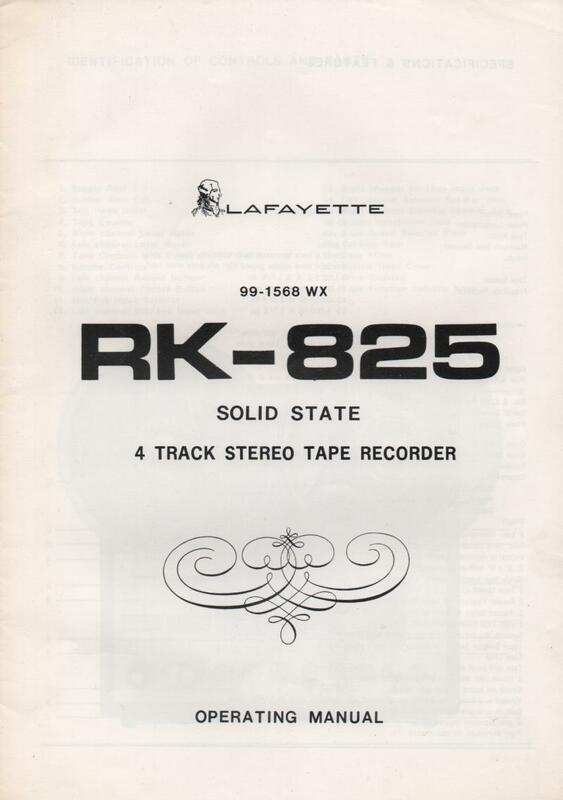 Manual LAFAYETTERK-825 Reel to Reel Owners Manual. 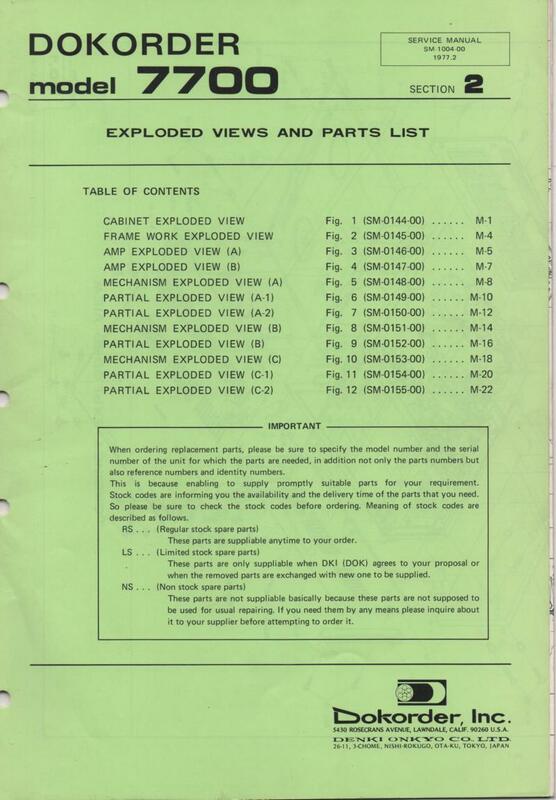 Owners manual with schematic. Stock No. 99-15687WX... PHOTO COPY! 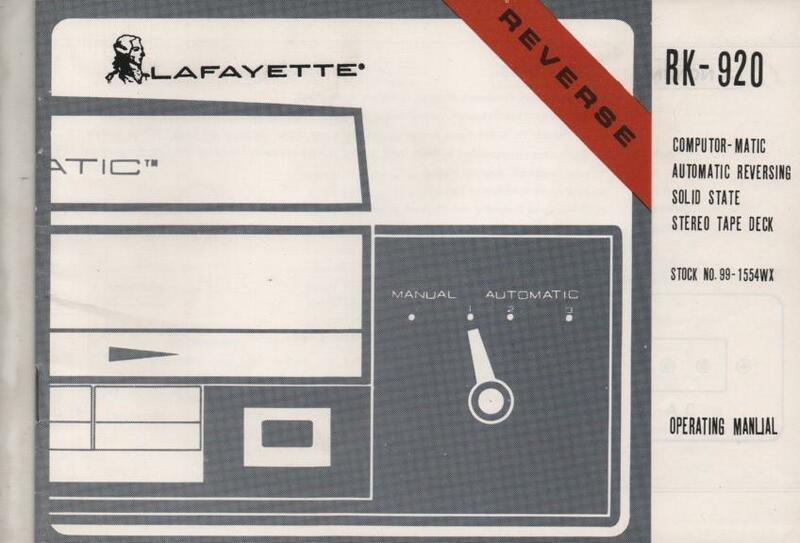 Manual LAFAYETTERK-825 Reel to Reel Service Manual with schematic. Stock No. 99-15687WX .. PHOTO COPY! 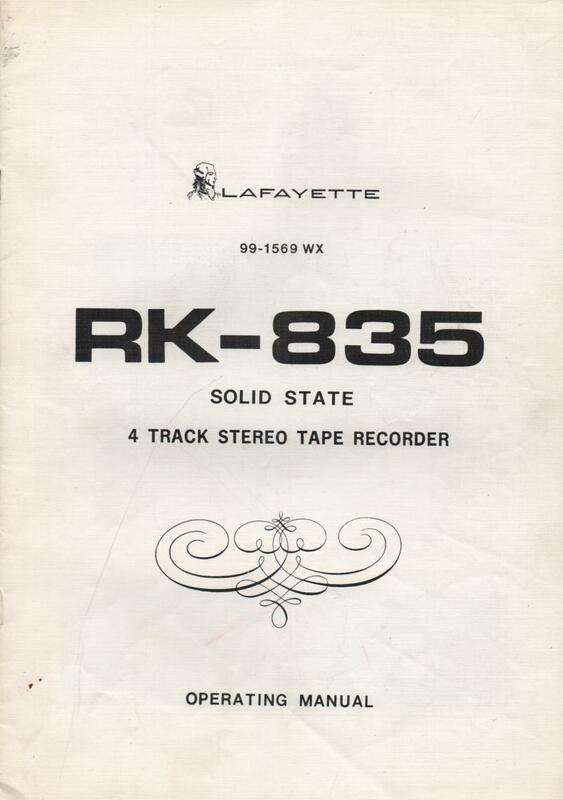 Manual LAFAYETTERK-835 Reel to Reel Owners Service Manual. Owners manual with schematic. Stock No. 99-1569WX . PHOTO COPY! 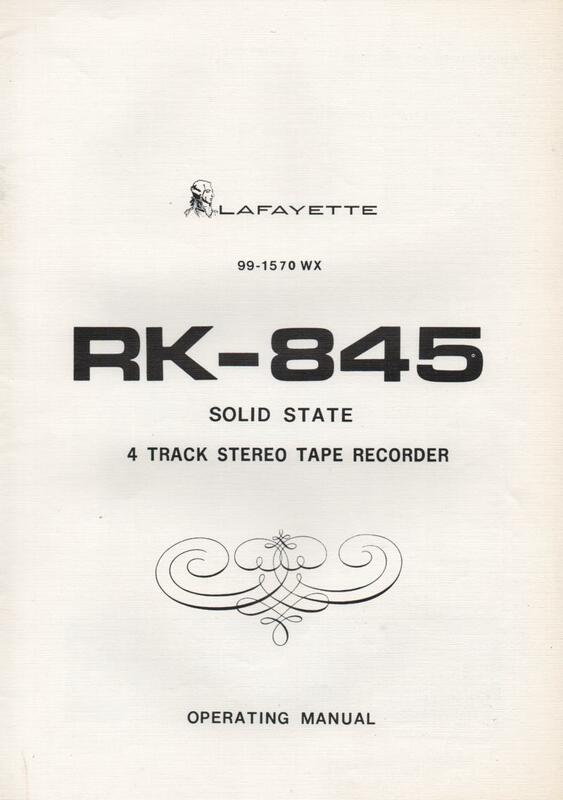 Manual LAFAYETTERK-845 Reel to Reel Owners Service Manual. Owners manual with schematic. Stock No. 99-1570WX . PHOTO COPY! 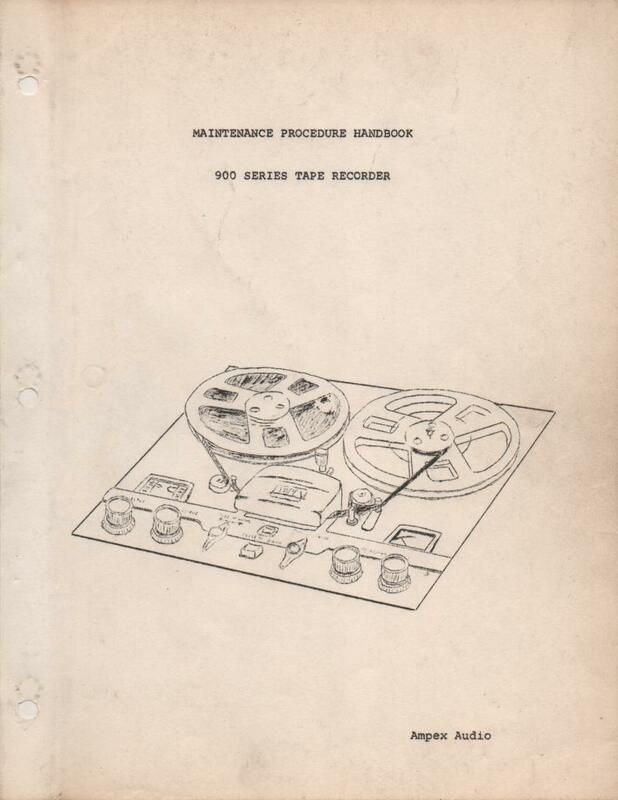 Manual LAFAYETTERK-860 Reel to Reel Owners Service Manual with schematic. Stock No. 99-1530WX PHOTO COPY! 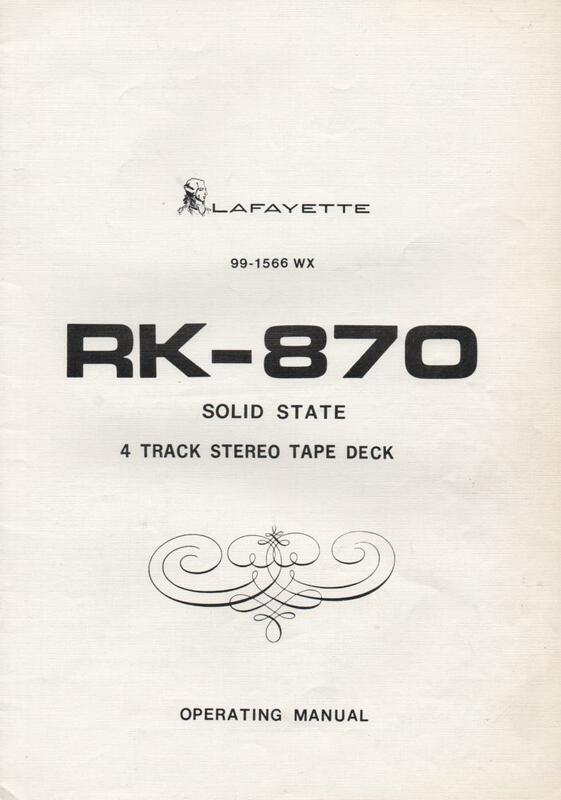 Manual LAFAYETTERK-870 Reel to Reel Owners Manual. Owners manual with schematic. Stock No. 99-1566WX... PHOTO COPY! 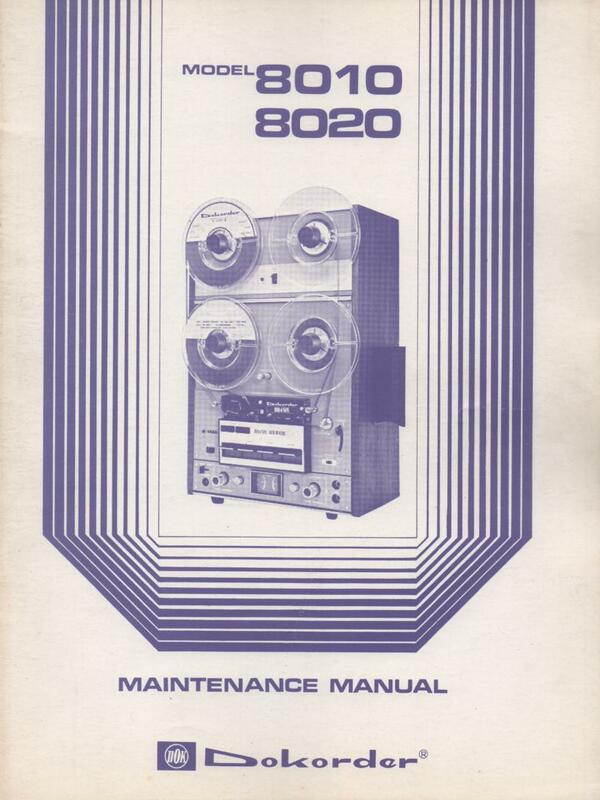 Manual LAFAYETTERK-920 Reel to Reel Owners Service Manual. 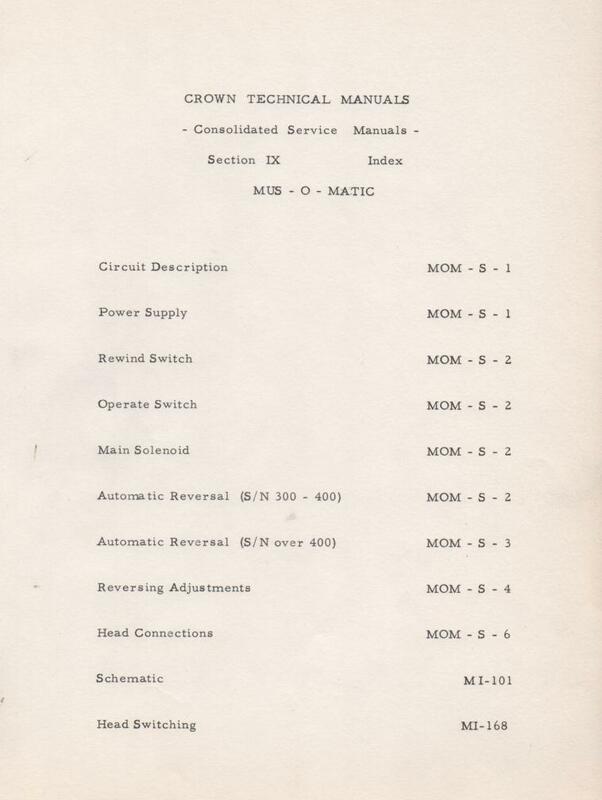 Owners manual with schematic.. Stock No. 99-1554WX . PHOTO COPY! 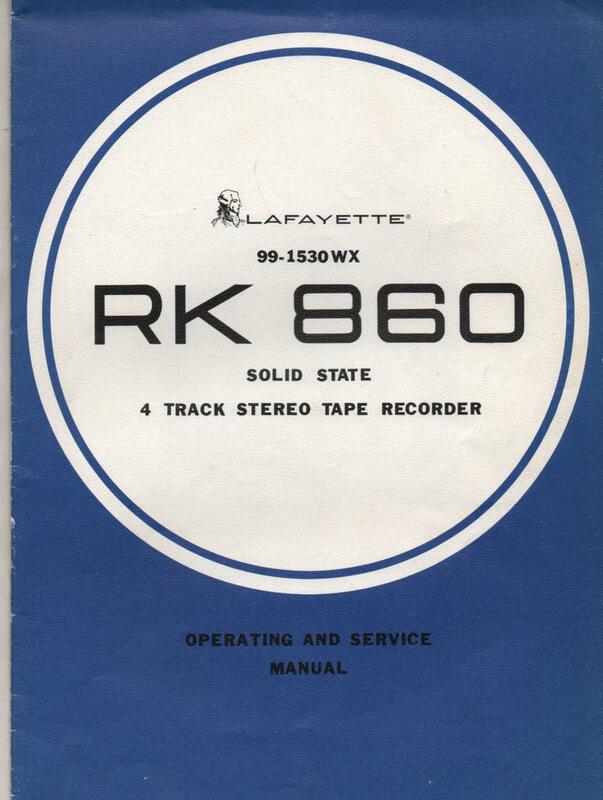 Manual LAFAYETTERK-960 Reel to Reel Owners Service Manual. 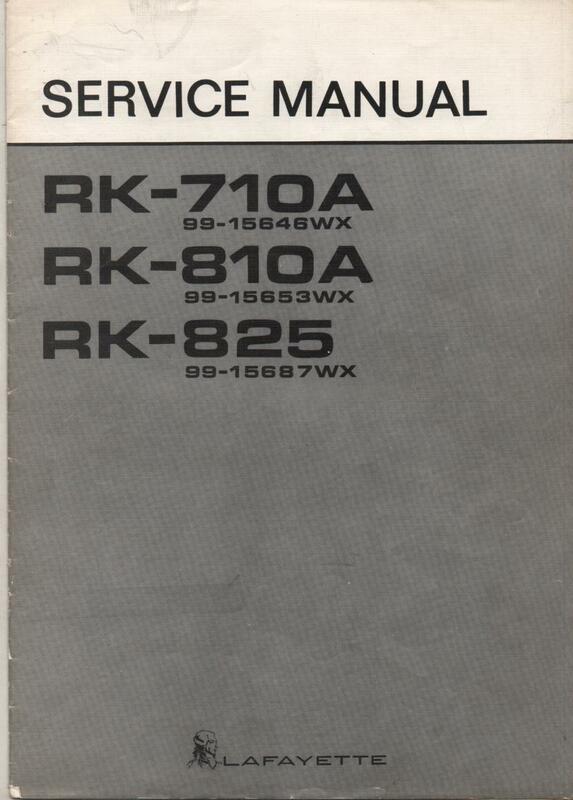 Owners manual with schematic.. Stock No. 99-1548WX . PHOTO COPY! 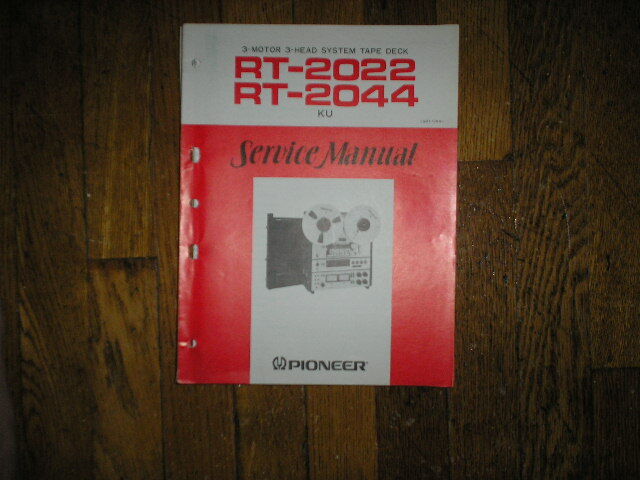 Manual PioneerRT-2022 RT-2044 Reel to Reel Service Manual ART-174 PHOTO COPY! 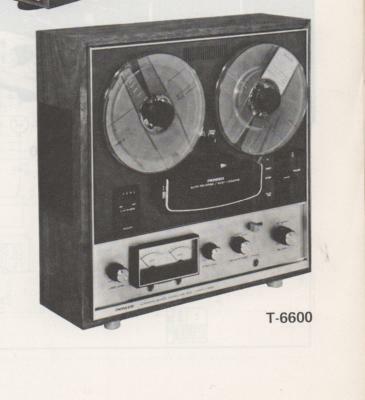 Manual PioneerT-600 F T-600F Reel to Reel Tape Recorder Operating Manual with Schematic PHOTO COPY! 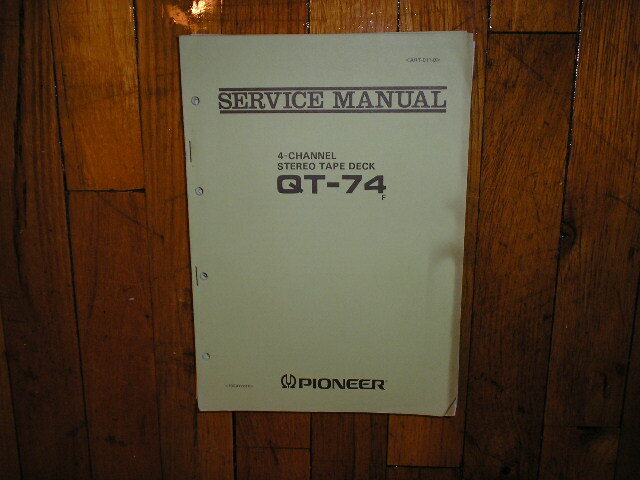 Manual PioneerQT-74 4 Channel Reel to Reel Service Manual PHOTO COPY! 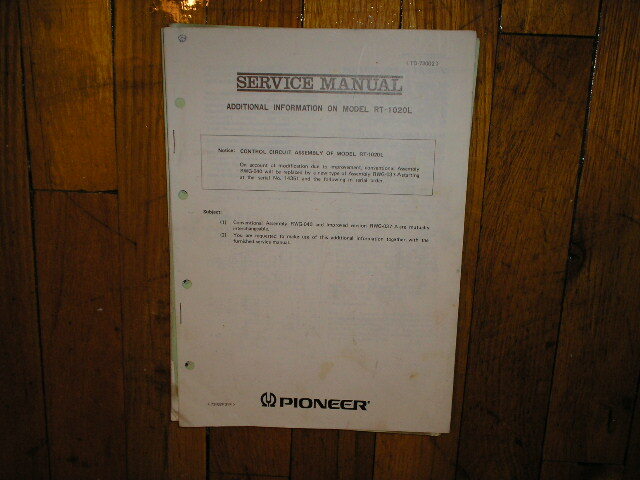 Manual PioneerQT-6100F QT-6100 F Reel to Reel Service Manual PHOTO COPY! 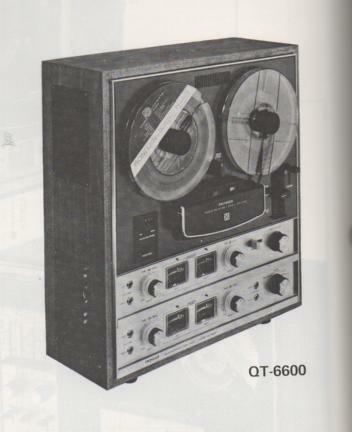 Manual PioneerQT-6600 QT-6600 F QT-6600F Reel to Reel Service Manual PHOTO COPY! 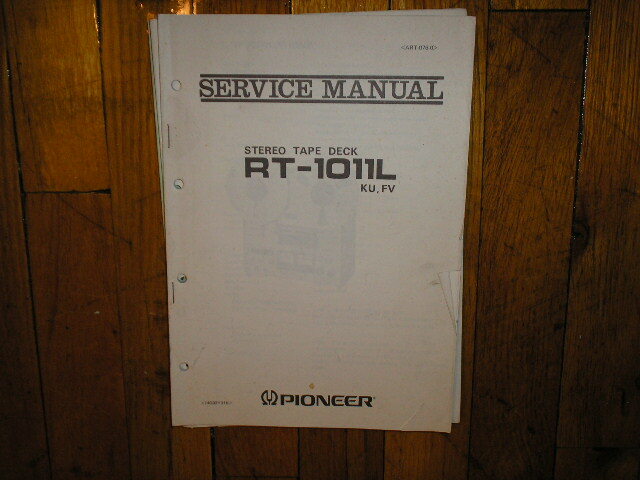 Manual PioneerRT-1011L RT-1011L KU FV Reel to Reel Service Manual PHOTO COPY! 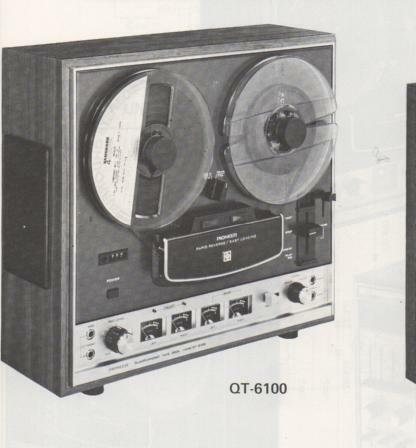 Manual PioneerRT-1020L RT-1020L F Reel to Reel Service Manual. Supplement Only PHOTO COPY! 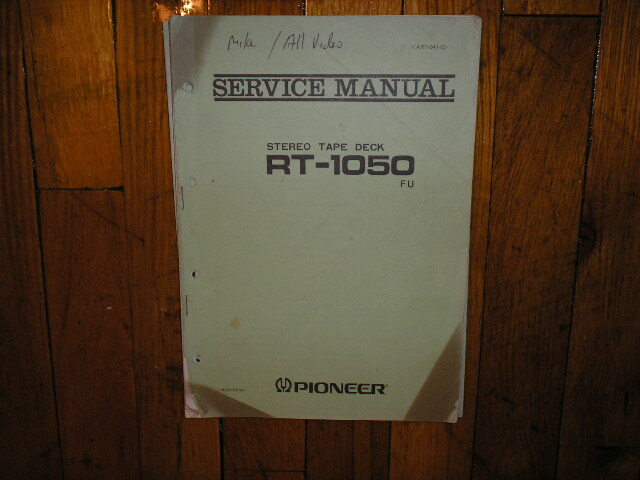 Manual PioneerRT-1050 FU RT-1050FU Reel to Reel Service Manual PHOTO COPY! 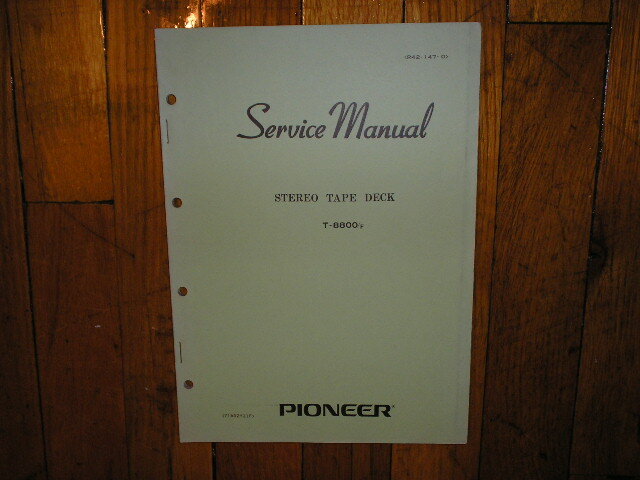 Manual PioneerT-8800 F T-8800F Reel to Reel Service Manual PHOTO COPY! 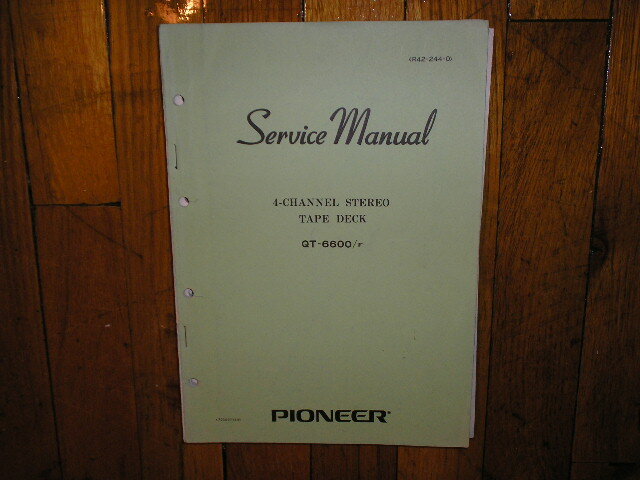 Manual PioneerT-600 4-Track Reel to Reel Service Manual PHOTO COPY! 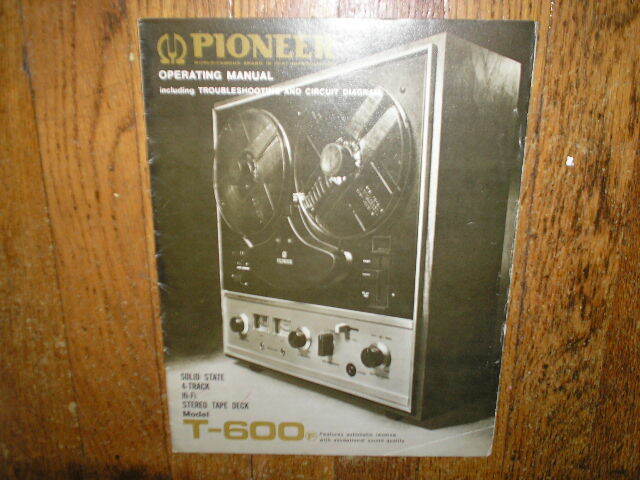 Manual PioneerRT-1050 Reel to Reel Owners Manual PHOTO COPY! 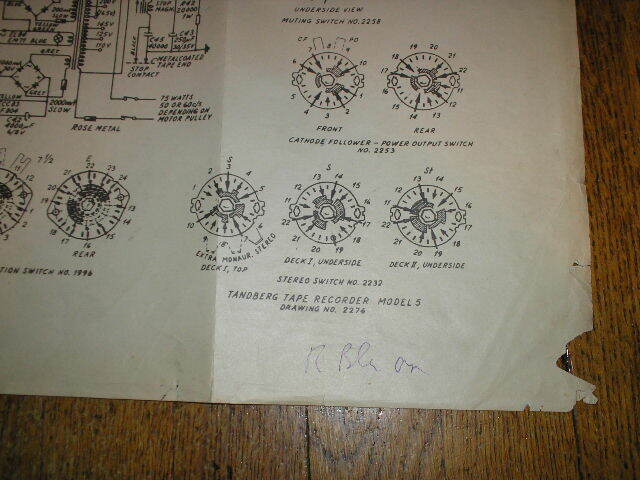 Manual PIONEER SCHEMATIC MANUALST-6100 Reel to Reel Schematic Only. It does not contain parts lists, alignments,etc. Schematics only PHOTO COPY! 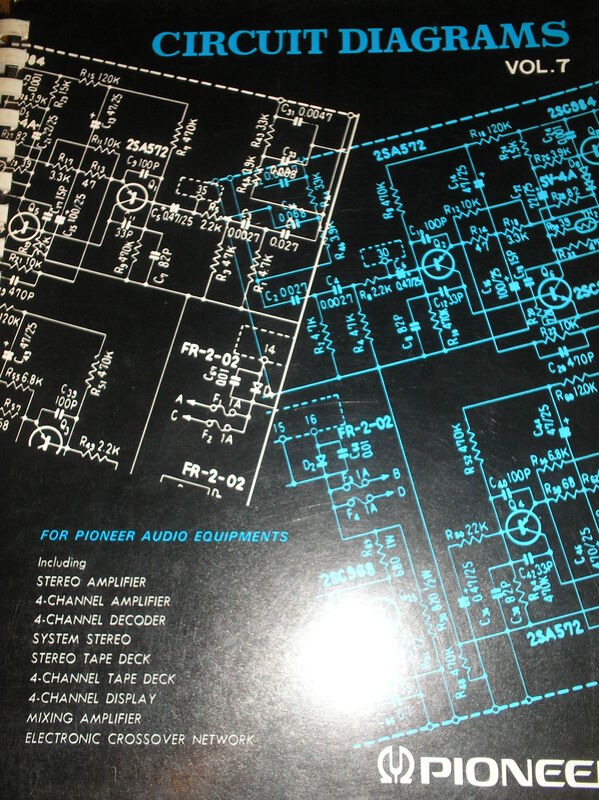 Manual PIONEER SCHEMATIC MANUALST-6600 Reel to Reel Schematic Manual Only. It does not contain parts lists, alignments,etc. Schematics only PHOTO COPY! 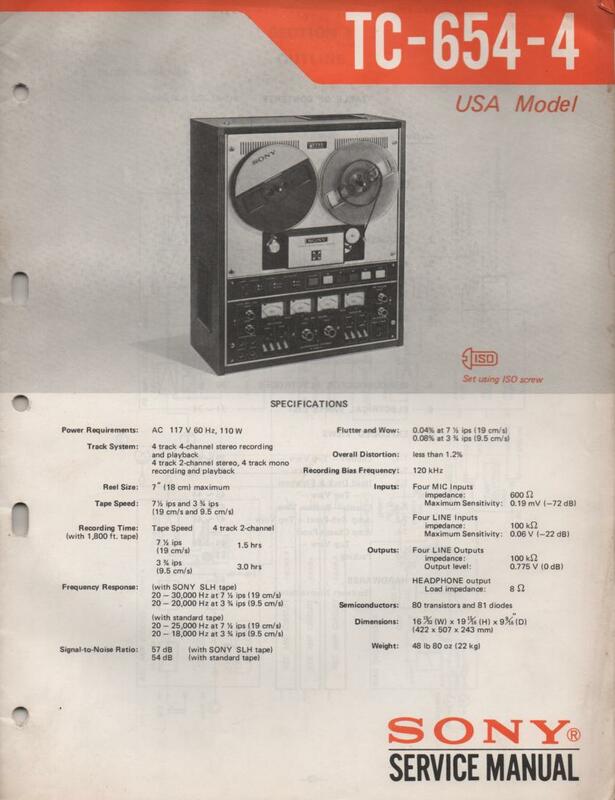 Manual PIONEER SCHEMATIC MANUALST-8800 Reel to Reel Schematic Manual Only. It does not contain parts lists, alignments,etc. Schematics only PHOTO COPY! Manual PIONEER SCHEMATIC MANUALSQT-6100 Reel to Reel Schematic Manual Only. 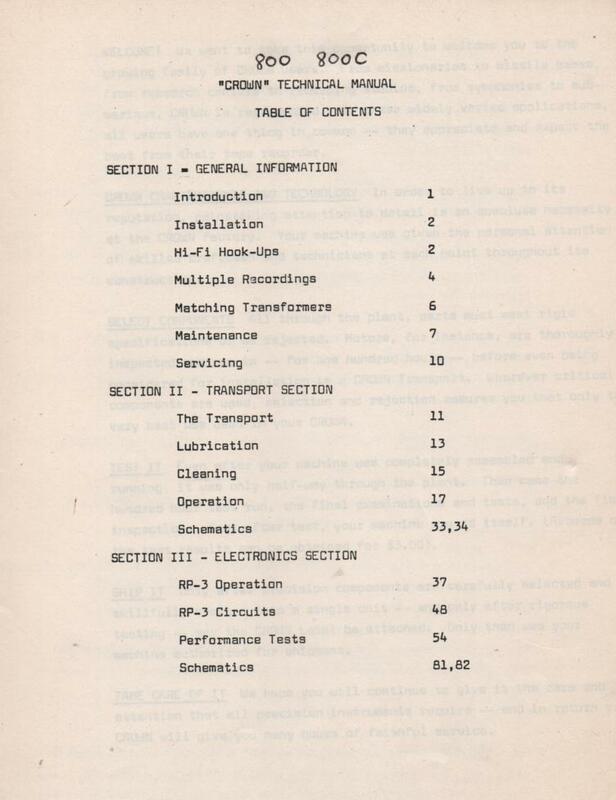 It does not contain parts lists, alignments,etc. Schematics only PHOTO COPY! 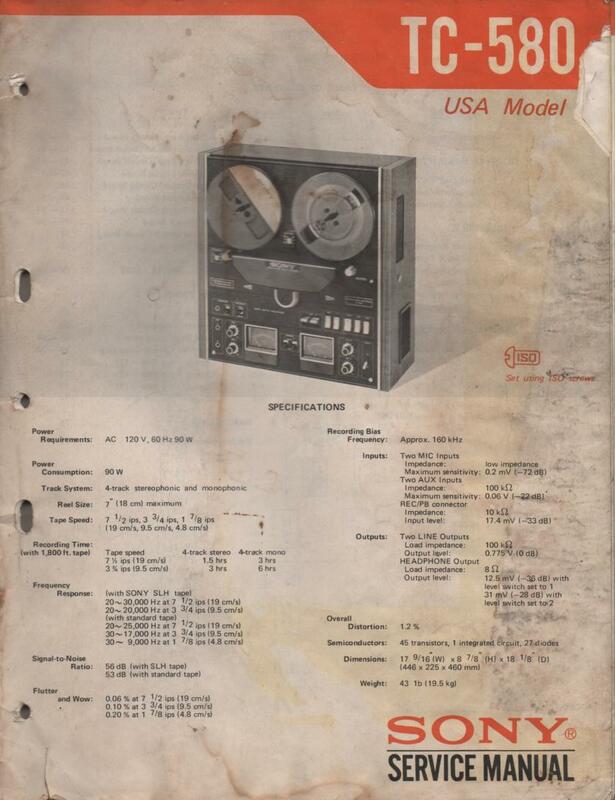 Manual PIONEER SCHEMATIC MANUALSQT-6600 Reel to Reel Schematic Manual Only. It does not contain parts lists, alignments,etc. Schematics only PHOTO COPY! 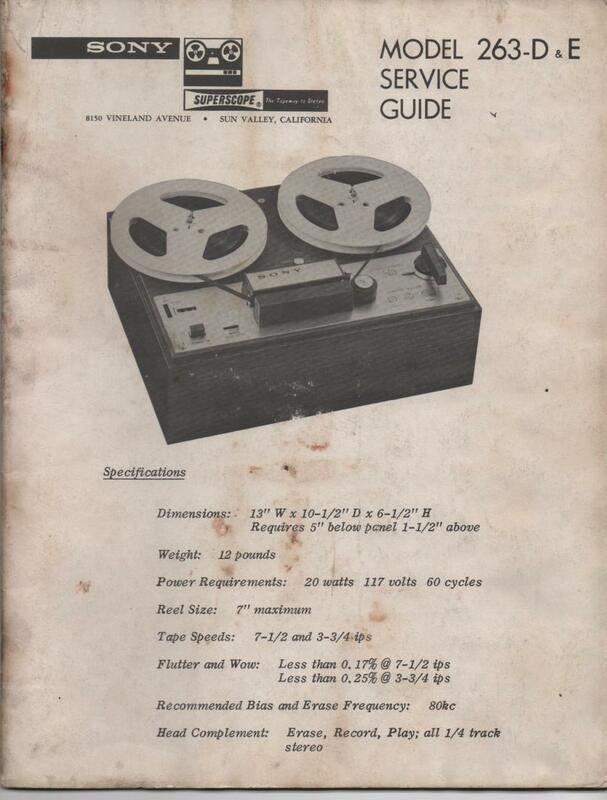 Manual PIONEER SCHEMATIC MANUALSQT-74 4 Channel Reel to Reel fold out schematics. Book 7 PHOTO COPY! Manual PIONEER SCHEMATIC MANUALSRT-71 Reel to Reel fold out schematics. F Versions Book 7 PHOTO COPY! 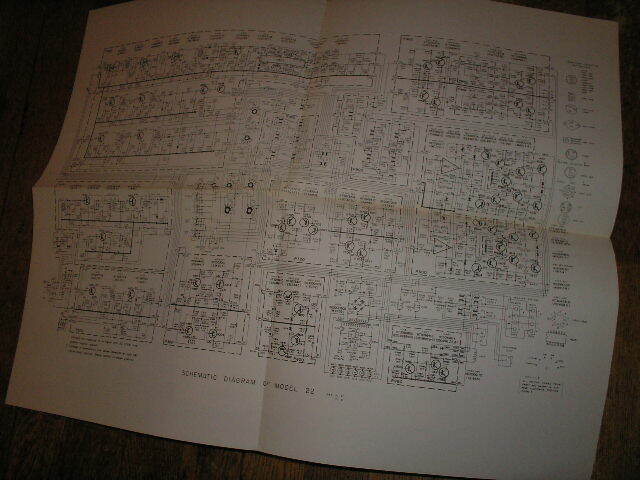 Manual PIONEER SCHEMATIC MANUALSRT-1011L Reel to Reel fold out schematics. FU KU Versions Book 7 PHOTO COPY! 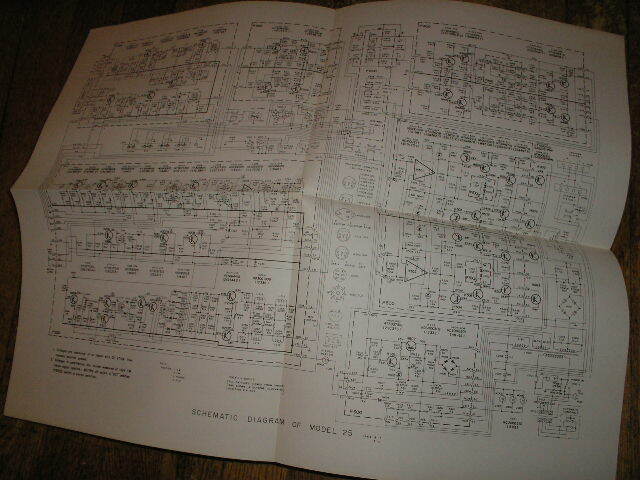 Manual PIONEER SCHEMATIC MANUALSRT-1020L F Reel to Reel fold out schematics. F Versions Book 7 PHOTO COPY! Manual PIONEER SCHEMATIC MANUALSRT-1020L FU Reel to Reel fold out schematics. FU Versions Book 7 PHOTO COPY! Manual PIONEER SCHEMATIC MANUALSRT1020H Reel to Reel fold out schematics. FU Versions Book 7 PHOTO COPY! 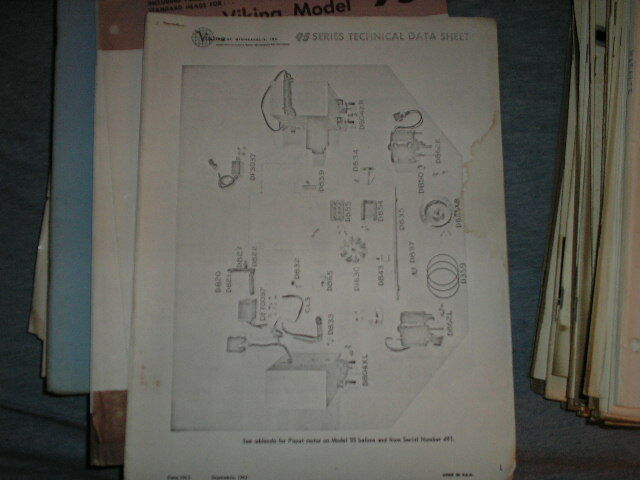 Manual PIONEER SCHEMATIC MANUALSRT-1050 Reel to Reel fold out schematics. FU Versions Book 7 PHOTO COPY! 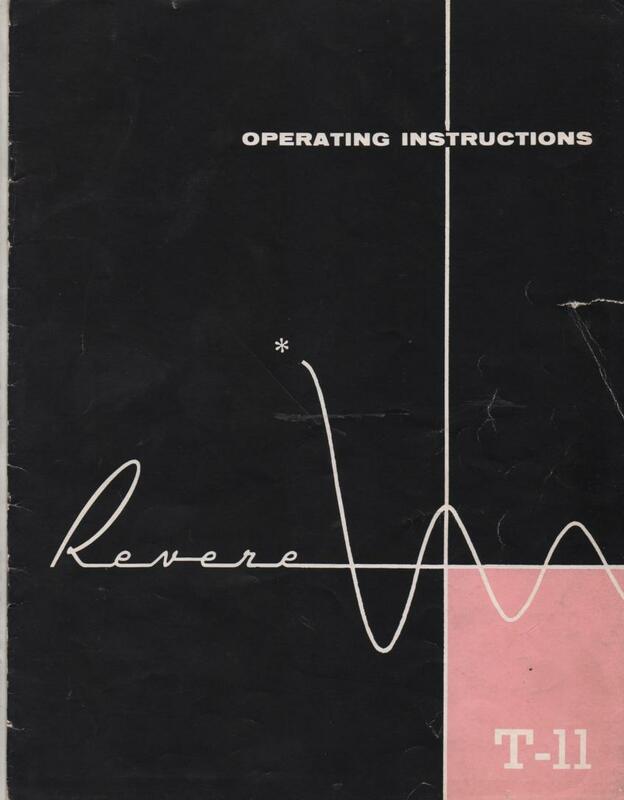 Manual REVERET-11 Reel to Reel Operating Service Manual with schematic PHOTO COPY! 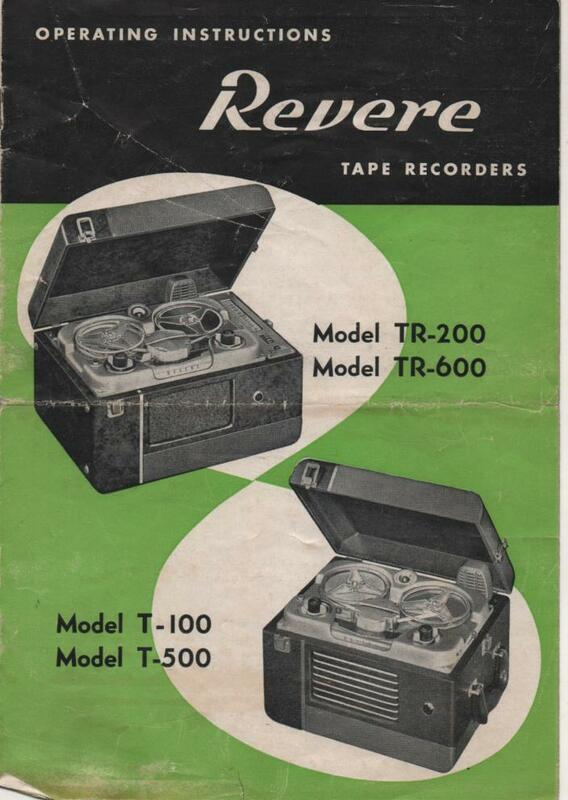 Manual REVERET-100 TR-200 T-500 TR-600 Reel to Reel Operating Service Manual PHOTO COPY! 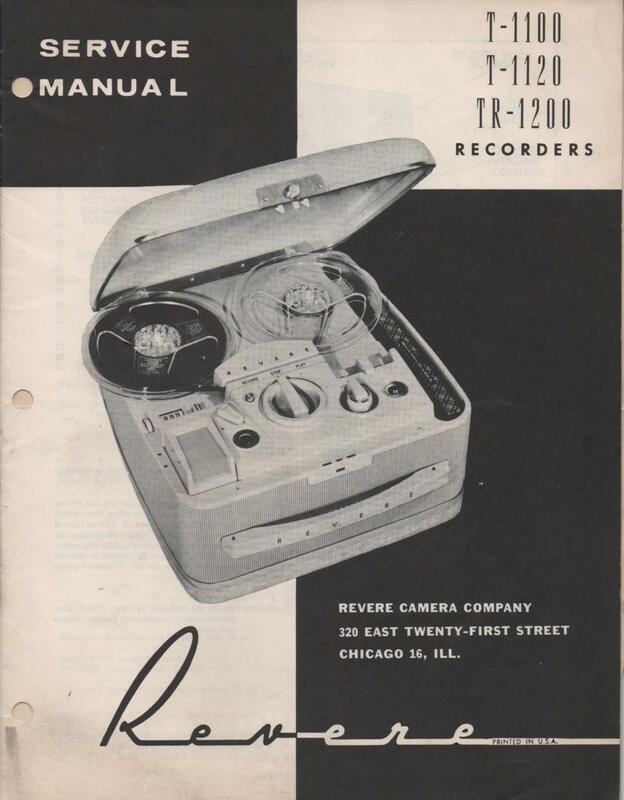 Manual REVERET-1100 T-1120 TR-1200 Reel to Reel Operating Service Manual PHOTO COPY! 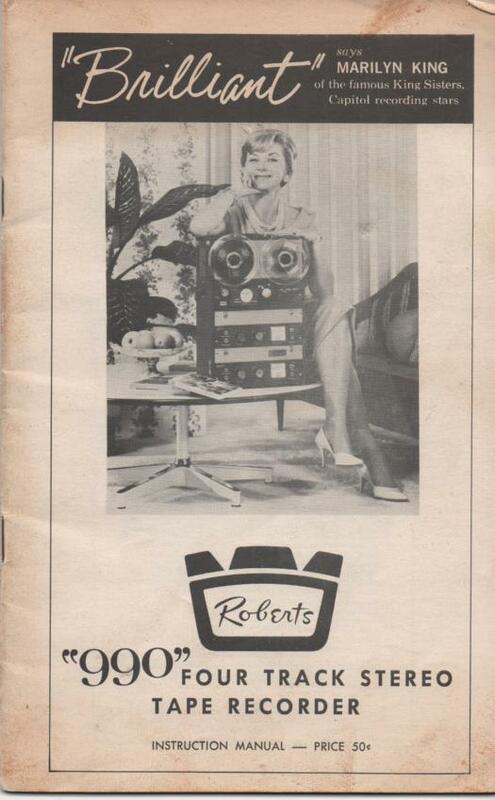 Manual ROBERTS62-178 Reel to Reel Stereo Tape Deck Service Manual PHOTO COPY! 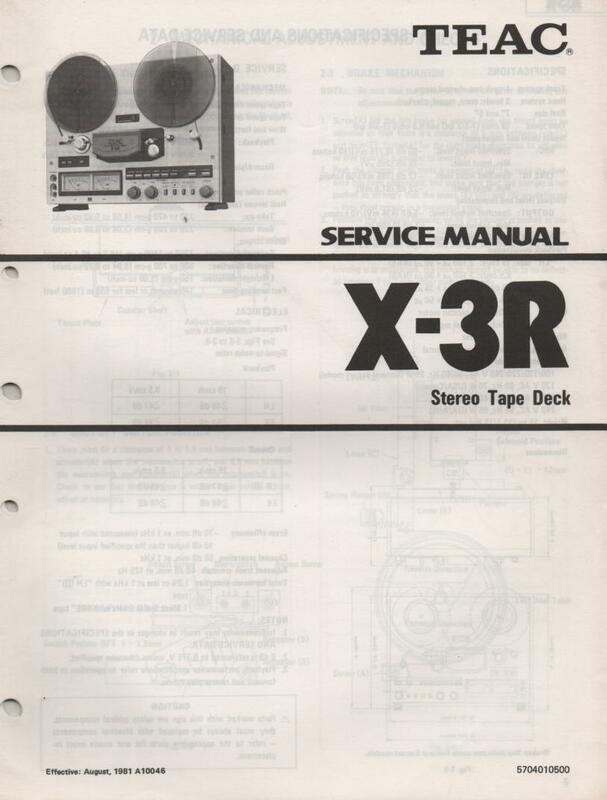 Manual ROBERTS333X Stereo Reel to Reel and Cassette Tape Deck Service Manual PHOTO COPY! 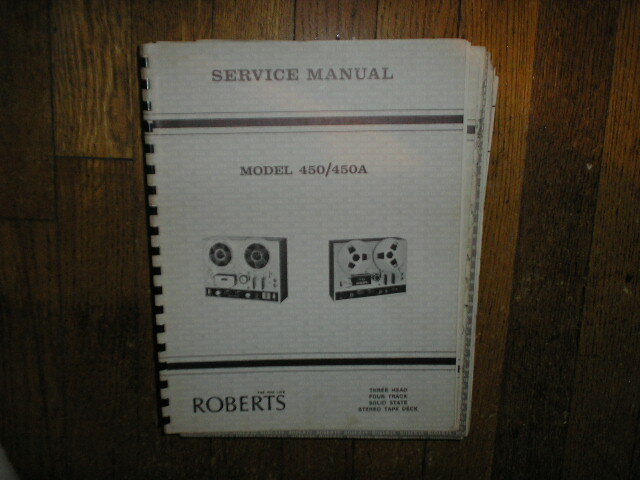 Manual ROBERTS440 Stereo Tape Deck Service Manual PHOTO COPY! 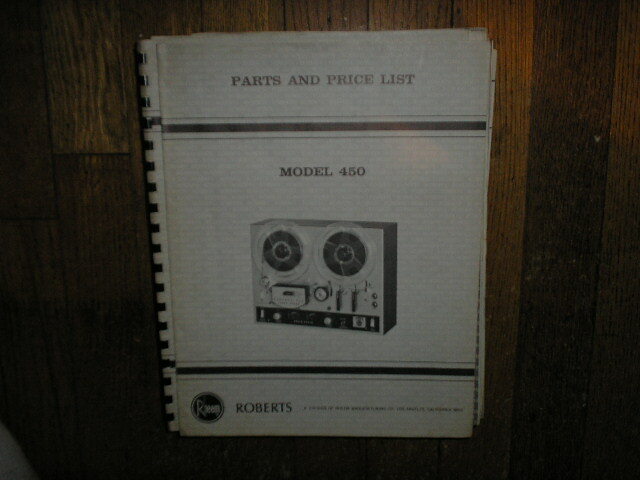 Manual ROBERTS450 450A Stereo Reel to Reel Tape Deck Service Manual PHOTO COPY! Manual ROBERTS450 Stereo Reel to Reel Tape Deck Parts List PHOTO COPY! 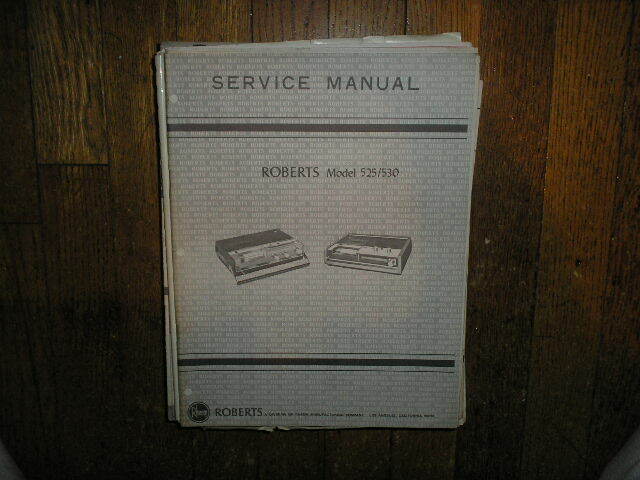 Manual ROBERTS525 530 Stereo Cassette Tape Deck Service Manual PHOTO COPY! Manual ROBERTS610X Stereo Reel to Reel Tape Deck Service Manual PHOTO COPY! 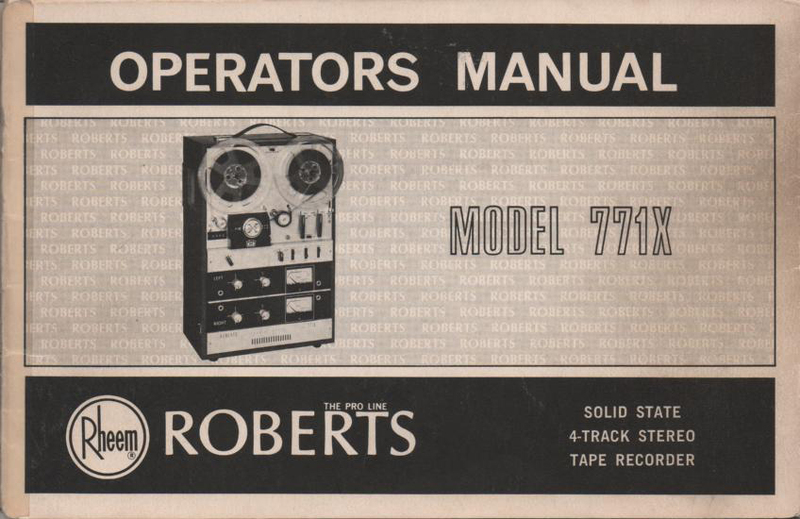 Manual ROBERTS770X-SS 771X Stereo Reel to Reel Tape Deck Service Manual PHOTO COPY! 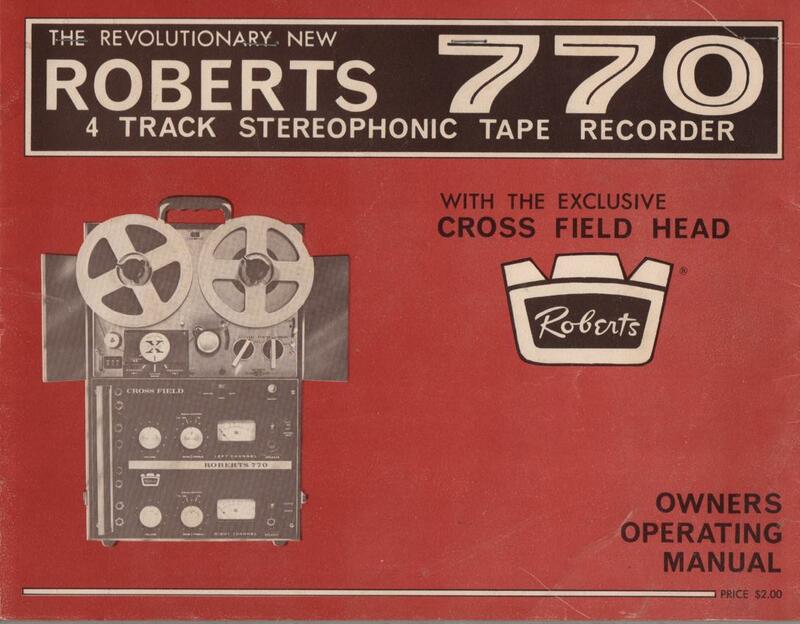 Manual ROBERTS770X-SS 771X Stereo Reel to Reel Tape Deck Parts Manual PHOTO COPY! Manual ROBERTS778X Stereo Reel to Reel Tape Deck Parts Manual PHOTO COPY! 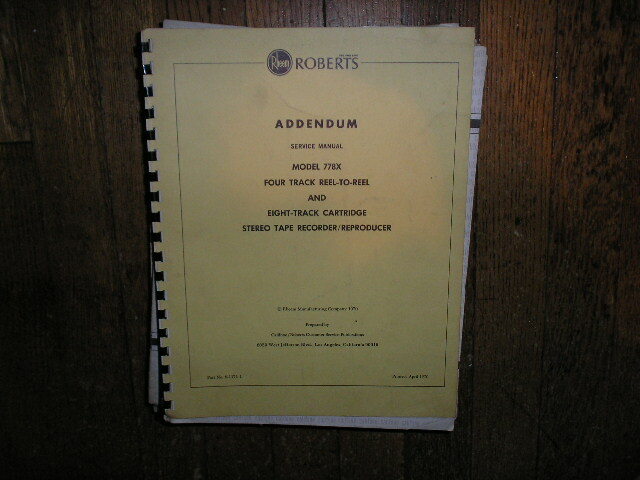 Manual ROBERTS778X Stereo Reel to Reel Tape Deck Service Manual Addendum PHOTO COPY! Manual ROBERTS990 Stereo Reel to Reel Tape Deck Service Manual PHOTO COPY! Manual ROBERTS1600 Stereo Reel to Reel Tape Deck Service Manual PHOTO COPY! 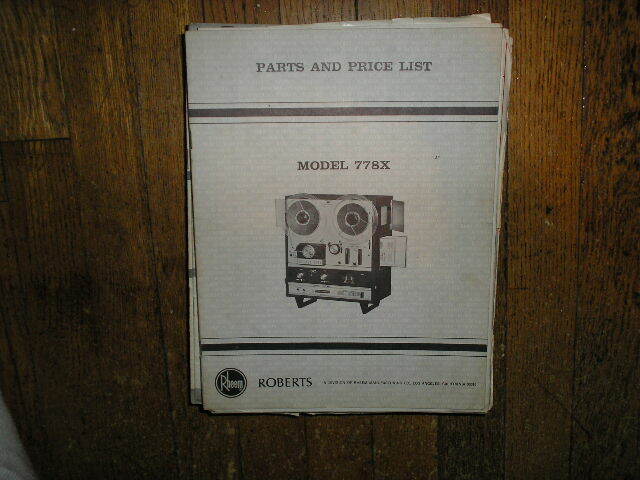 Manual ROBERTS1719 1720 1721 4-Track Stereo Reel to Reel Tape Deck Service Manual PHOTO COPY! 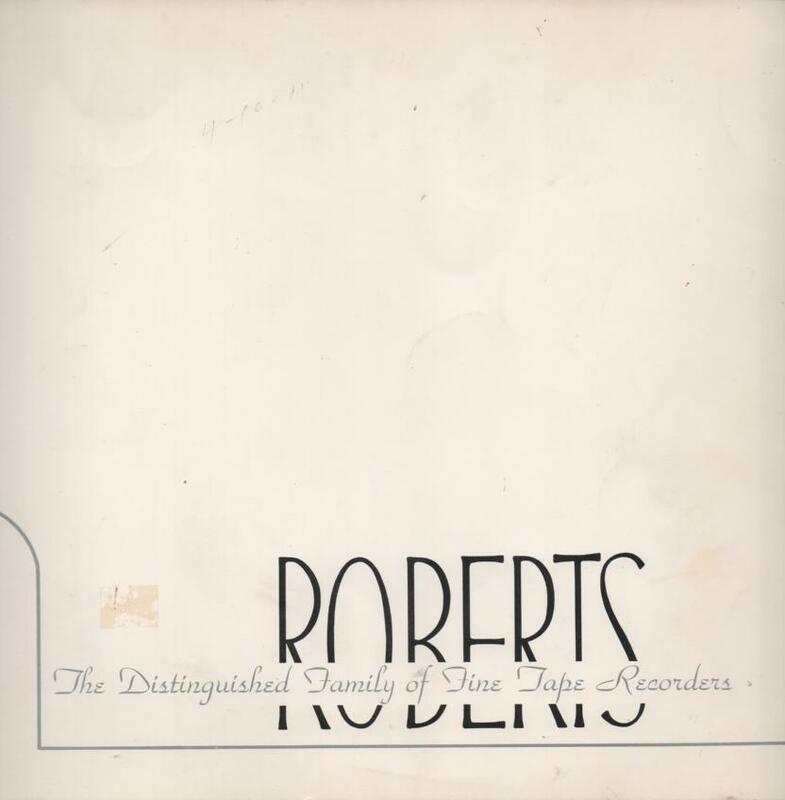 Manual ROBERTS1725-8L III 3 8-Track Stereo Reel to Reel Tape Deck Service Manual PHOTO COPY! 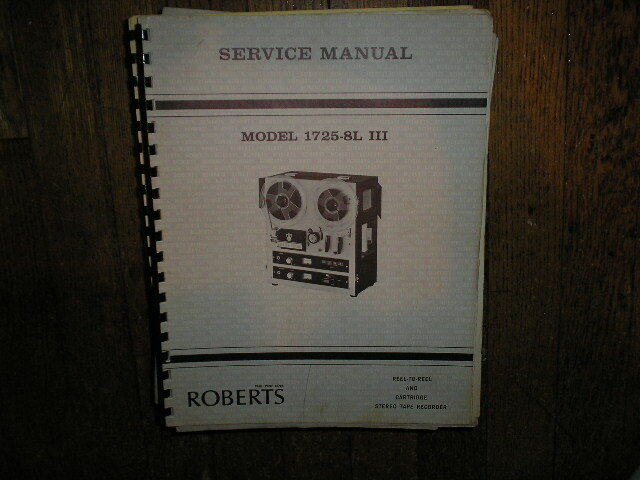 Manual ROBERTS1730 4-Track Stereo Reel to Reel Tape Deck Service Manual PHOTO COPY! 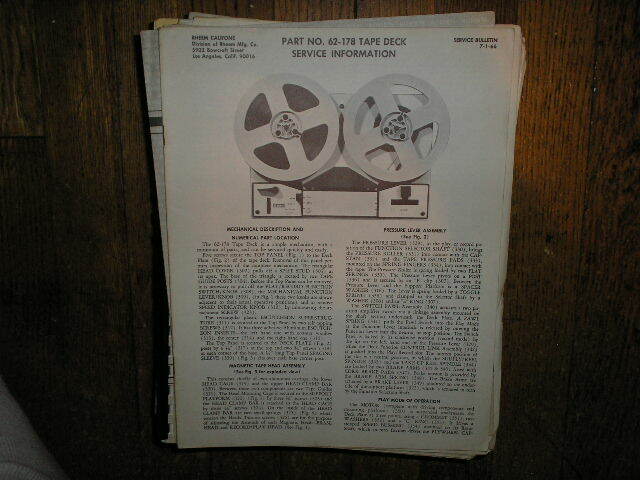 Manual ROBERTS1740X 4-Track Stereo Reel to Reel Tape Deck Service Manual PHOTO COPY! 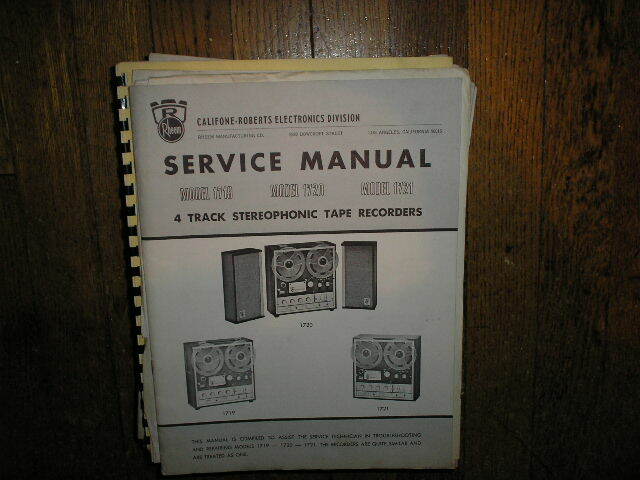 Manual ROBERTSStereo Tape Deck Service Manual PHOTO COPY! 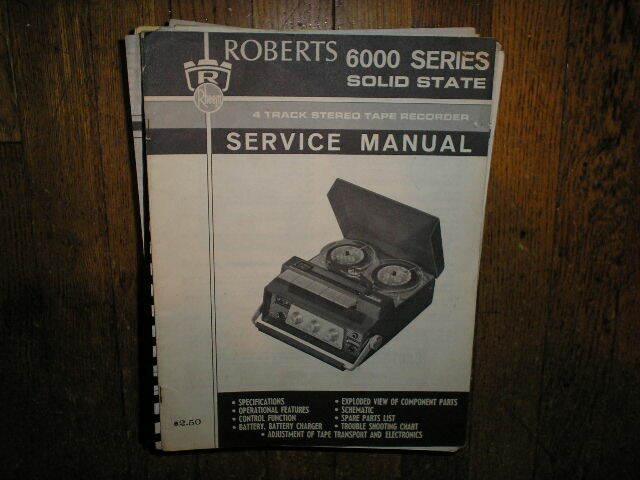 Manual ROBERTS6000 4-Track Stereo Reel to Reel Tape Deck Service Manual PHOTO COPY! 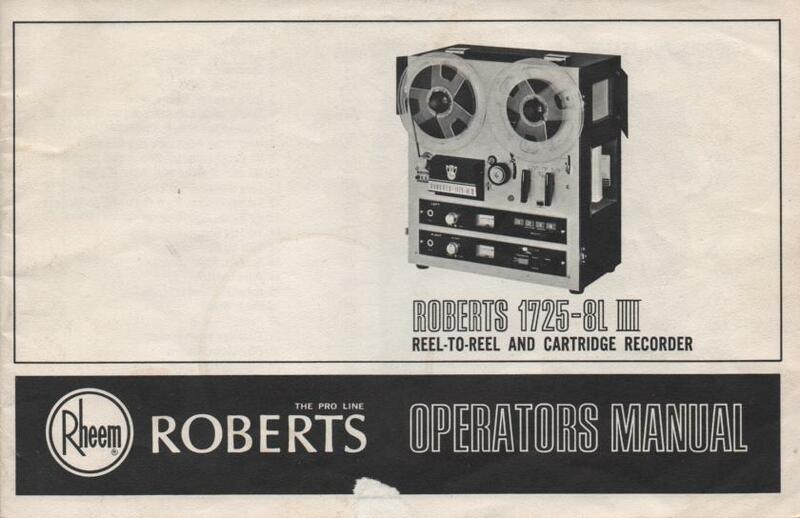 Manual ROBERTS770 Reel to Reel Operating Instruction Manual PHOTO COPY! 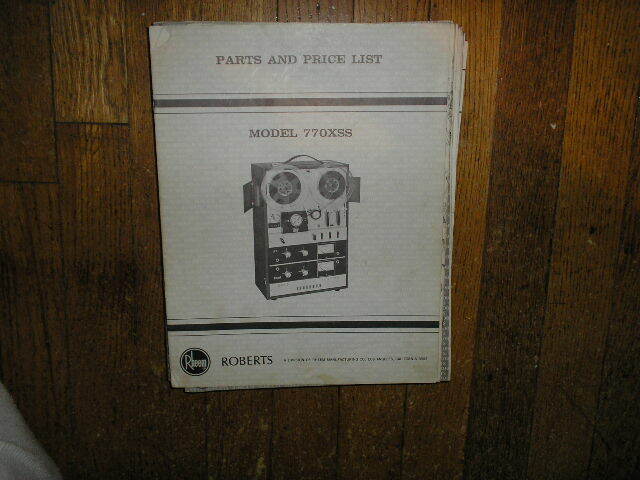 Manual ROBERTS771X Reel to Reel Operating Instruction Manual PHOTO COPY! 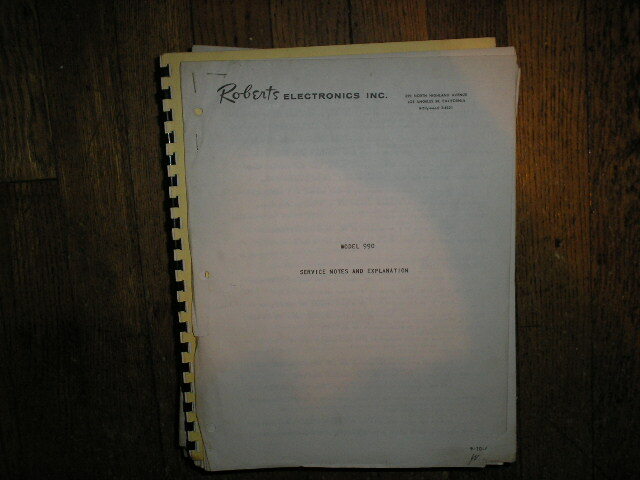 Manual ROBERTS990 Reel to Reel Operating Instruction Manual PHOTO COPY! 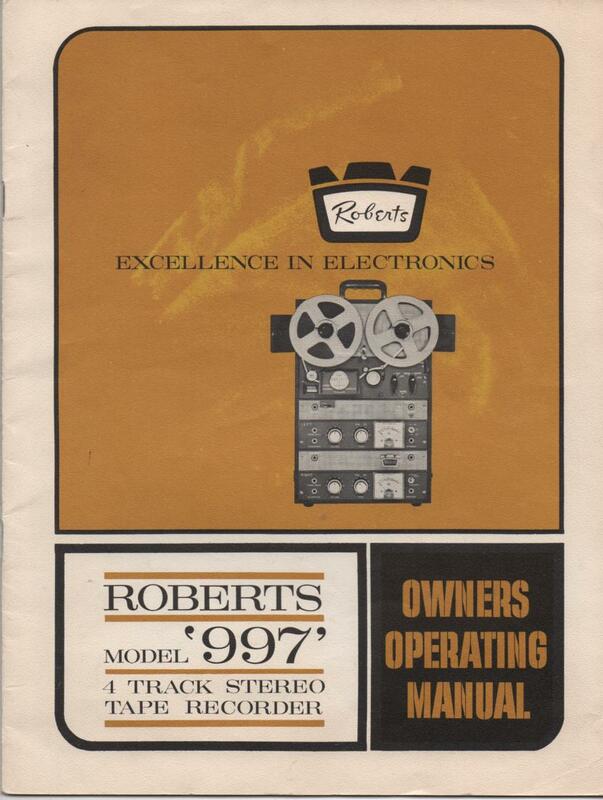 Manual ROBERTS997 Reel to Reel Operating Instruction Manual PHOTO COPY! Manual ROBERTS1630 Reel to Reel Operating Instruction Manual PHOTO COPY! 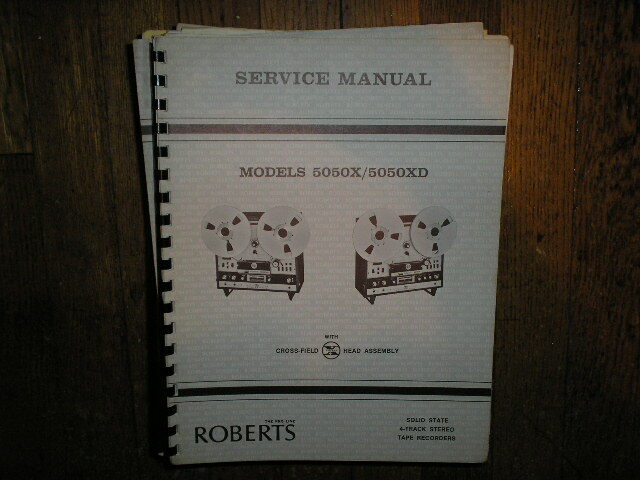 Manual ROBERTS650XD 800X Reel to Reel Service Instruction Manual PHOTO COPY! 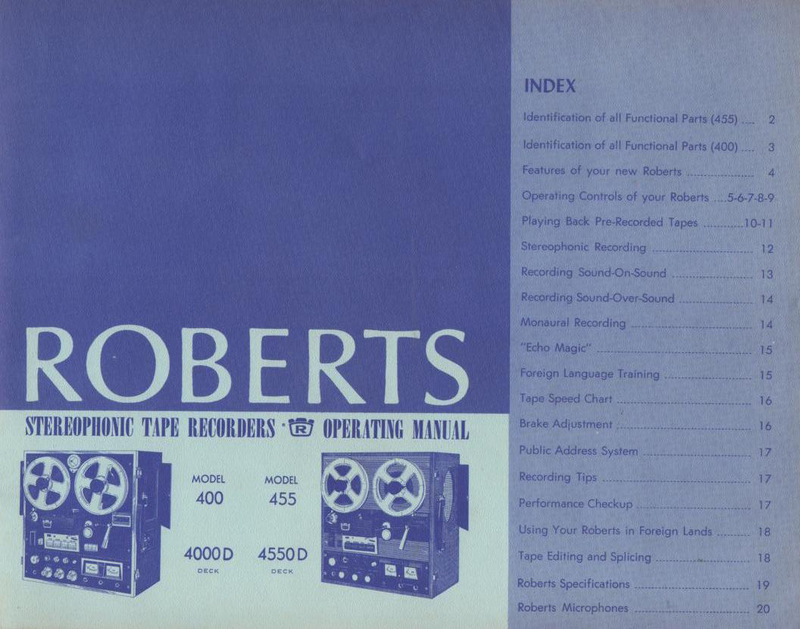 Manual ROBERTS440 455 4000D 4550D Reel to Reel Owners Operating Instruction Manual PHOTO COPY! 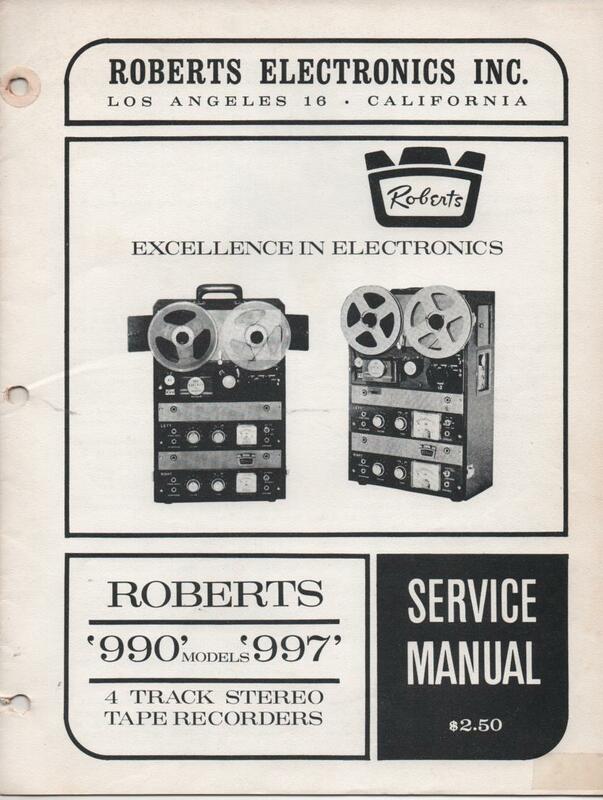 Manual ROBERTS990 997 Reel to Reel Service Manual PHOTO COPY! 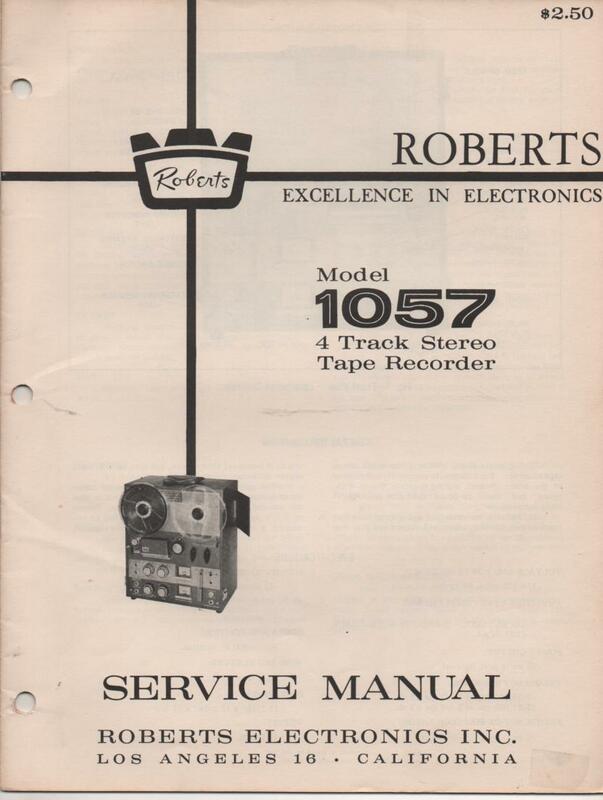 Manual ROBERTS1057 4 Track Reel to Reel Service Manual PHOTO COPY! 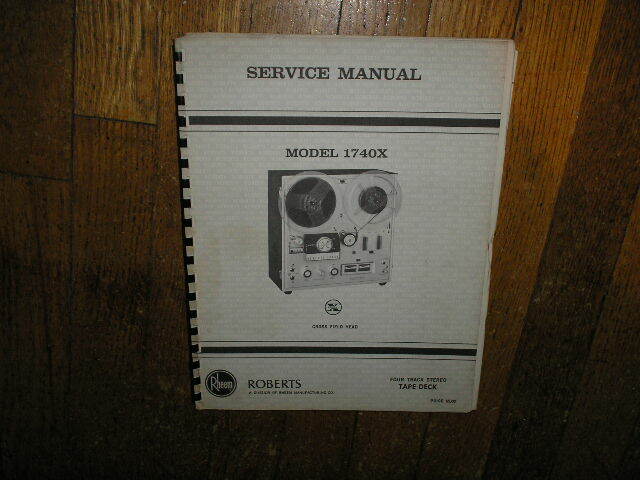 Manual ROBERTS1630A 1630-8L 1725 1725W 1725-8L Reel to Reel Service Manual PHOTO COPY! 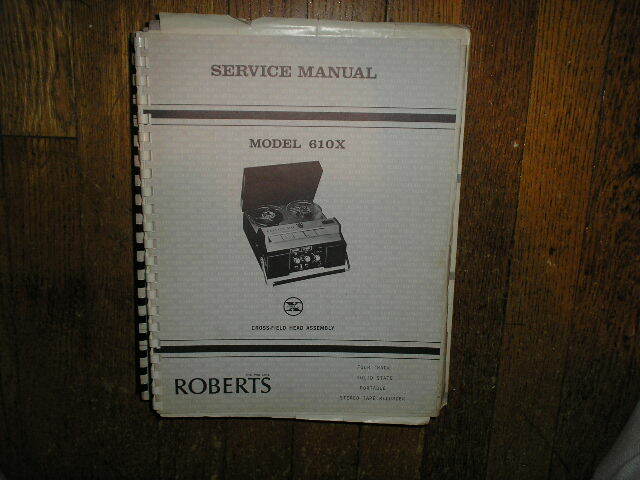 Manual ROBERTS1630A S907A 838 Reel to Reel 8-Track Service Manual PHOTO COPY! 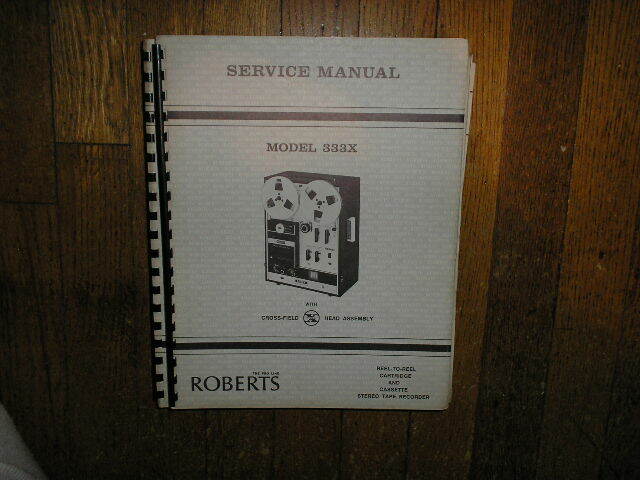 Manual ROBERTS1660D Reel to Reel Service Manual PHOTO COPY! 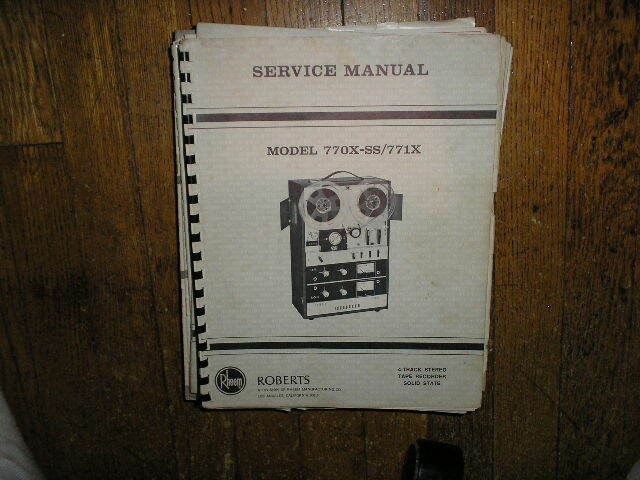 Manual ROBERTS1770D Reel to Reel Service Manual PHOTO COPY! 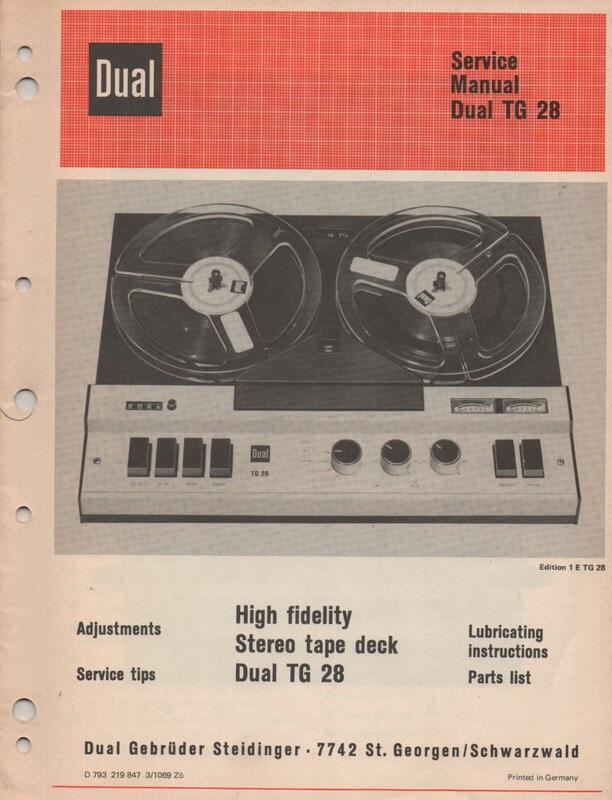 Manual ROBERTS1725-8L III 3 8-Track Stereo Reel to Reel Tape Deck Owners Manual PHOTO COPY! 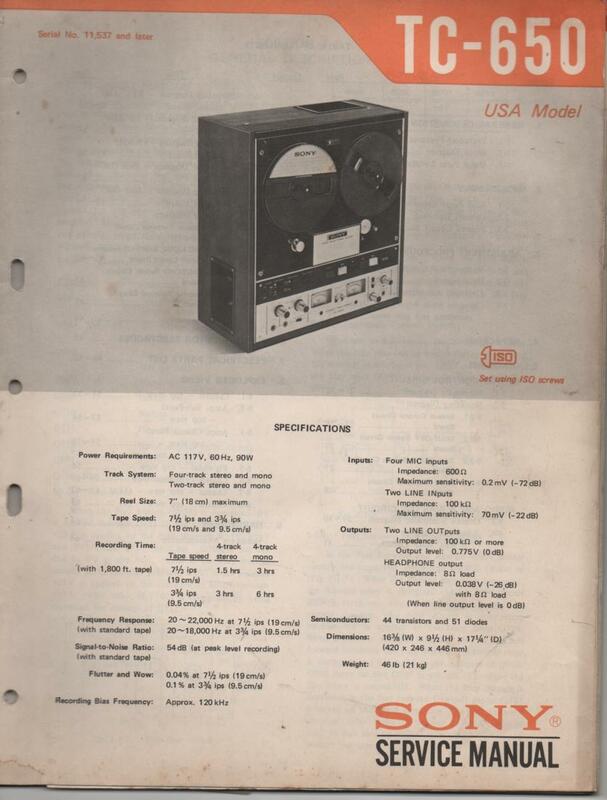 Manual SansuiSD-5000 Reel To Reel Operator Manual PHOTO COPY! 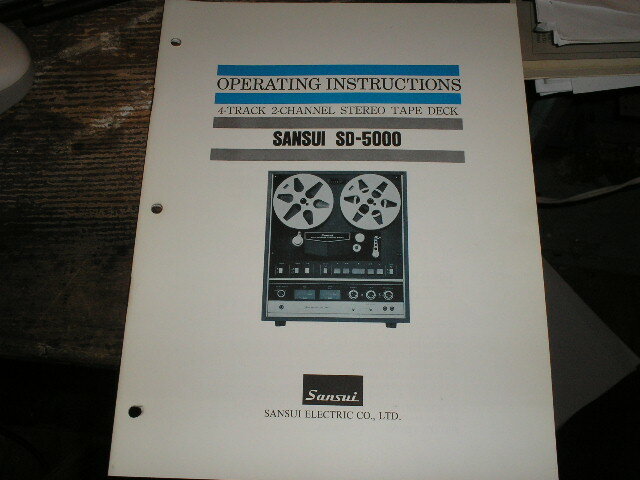 Manual SansuiSD-5000 Reel To Reel Service Manual.. PHOTO COPY! 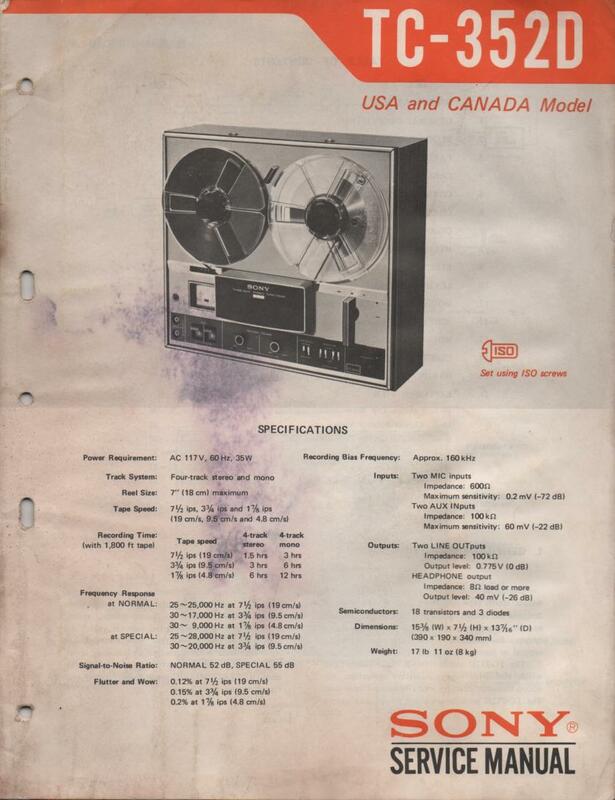 Manual SansuiSD-7000 Reel To Reel Service Manual.. WITH 2 LARGE FOLD OUT SCHEMATICS PHOTO COPY! 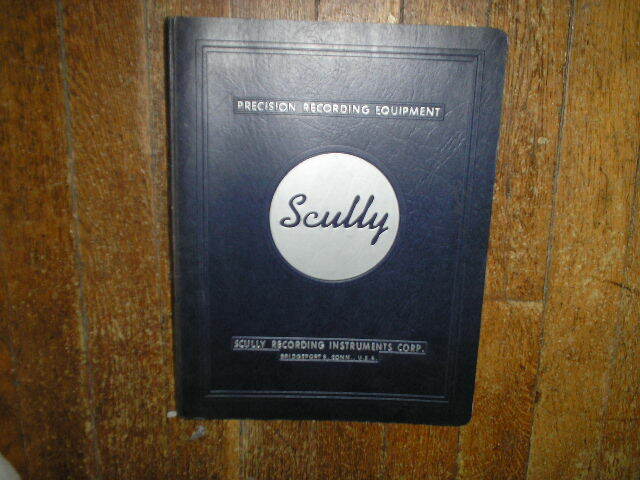 Manual SCULLY280 Reel to Reel Recorder Instruction Manual 1 PHOTO COPY! Manual SCULLY280 Reel to Reel Recorder Service Instruction Manual 2 PHOTO COPY! Manual Sony263-D 263-E Superscope Reel to Reel Service Manual PHOTO COPY! 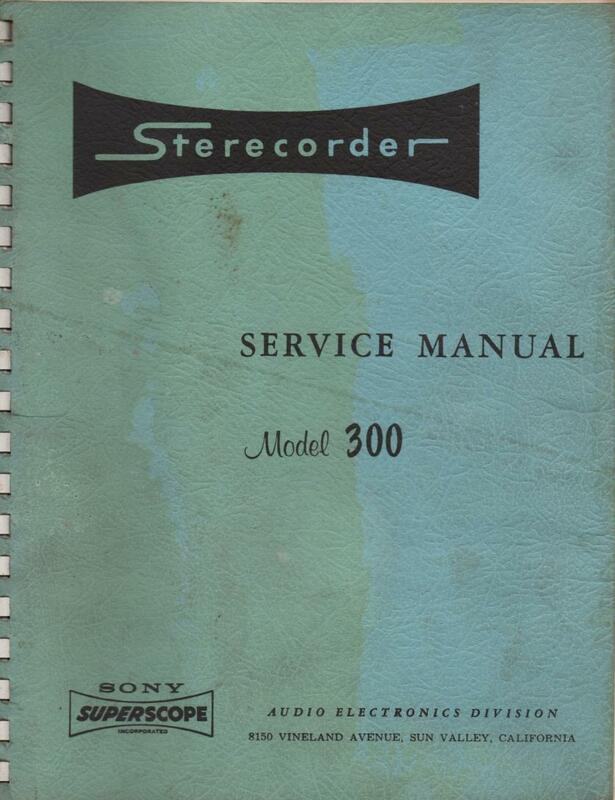 Manual Sony300 Superscope Reel to Reel Service Manual PHOTO COPY! 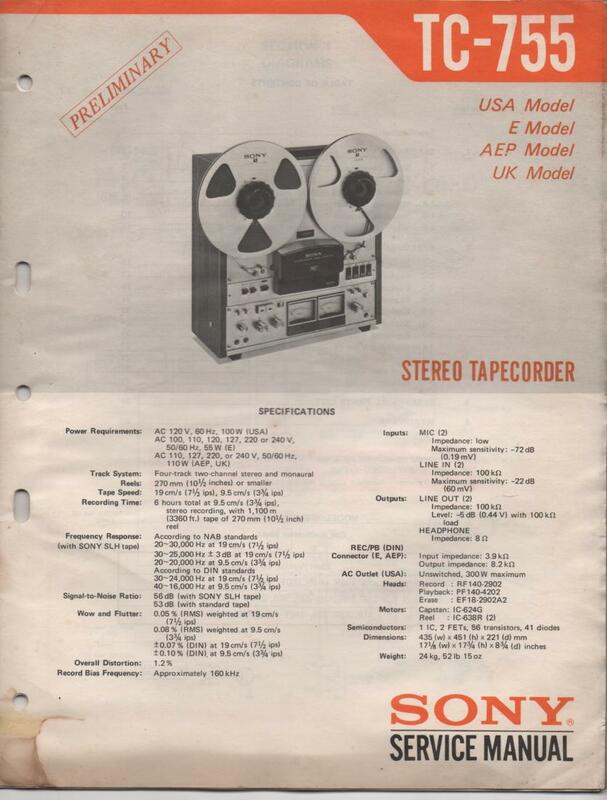 Manual Sony464-D Reel to Reel Service Manual PHOTO COPY! 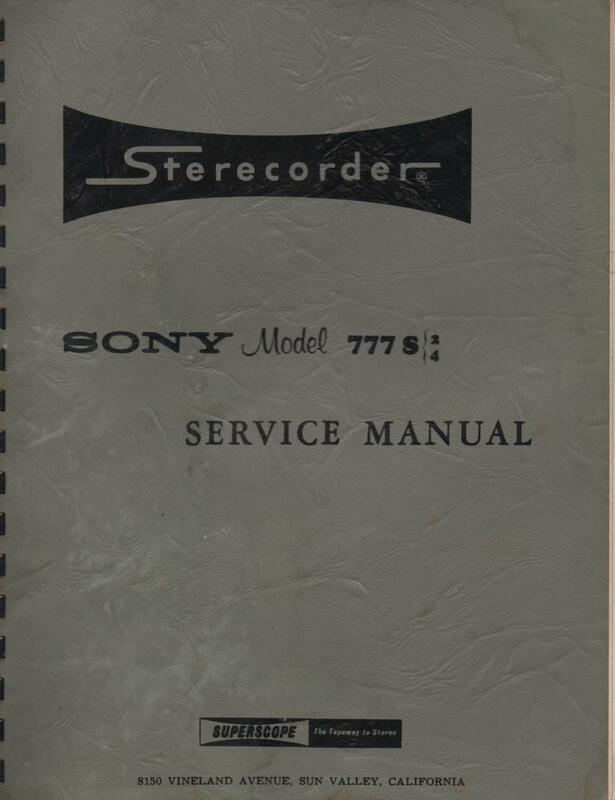 Manual Sony777S-2 777S-4 Reel to Reel Service Manual PHOTO COPY! Manual SonyTC-352D Reel to Reel Service Manual PHOTO COPY! Manual SonyTC-353D Reel to Reel Service Manual PHOTO COPY! 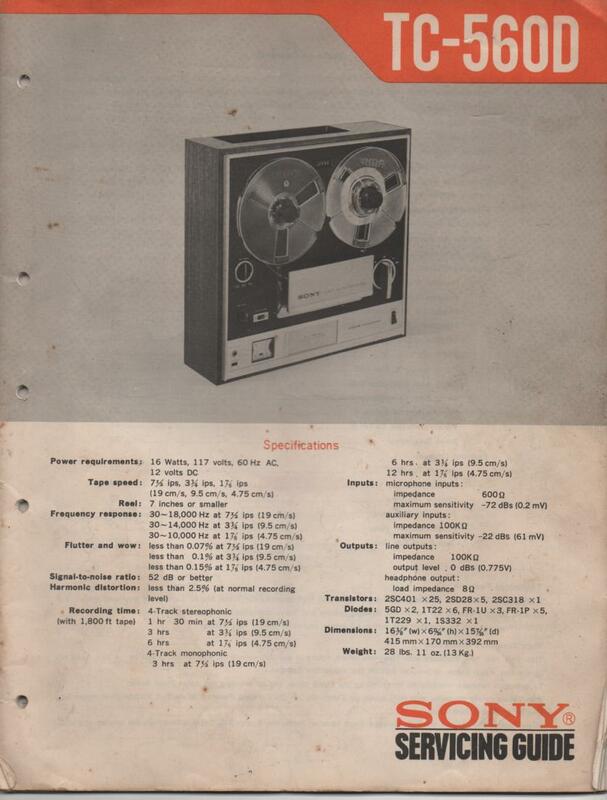 Manual SonyTC-366 Reel to Reel Service Manual PHOTO COPY! Manual SonyTC-458 Reel to Reel Service Manual PHOTO COPY! Manual SonyTC-560D Reel to Reel Service Manual PHOTO COPY! Manual SonyTC-580 Reel to Reel Service Manual PHOTO COPY! Manual SonyTC-630D Reel to Reel Service Manual PHOTO COPY! Manual SonyTC-640 Reel to Reel Service Manual PHOTO COPY! Manual SonyTC-640B Reel to Reel Service Manual PHOTO COPY! Manual SonyTC-650 Reel to Reel owners Operating Instruction Manual PHOTO COPY! Manual SonyTC-650 Reel to Reel Service Manual PHOTO COPY! 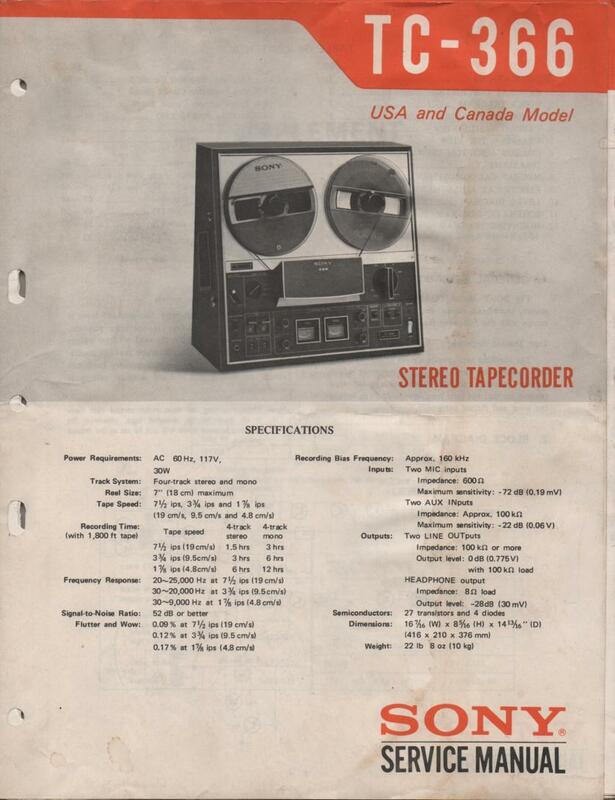 Manual SonyTC-652-4 Reel to Reel Service Manual PHOTO COPY! Manual SonyTC-642-4 Reel to Reel Service Manual PHOTO COPY! 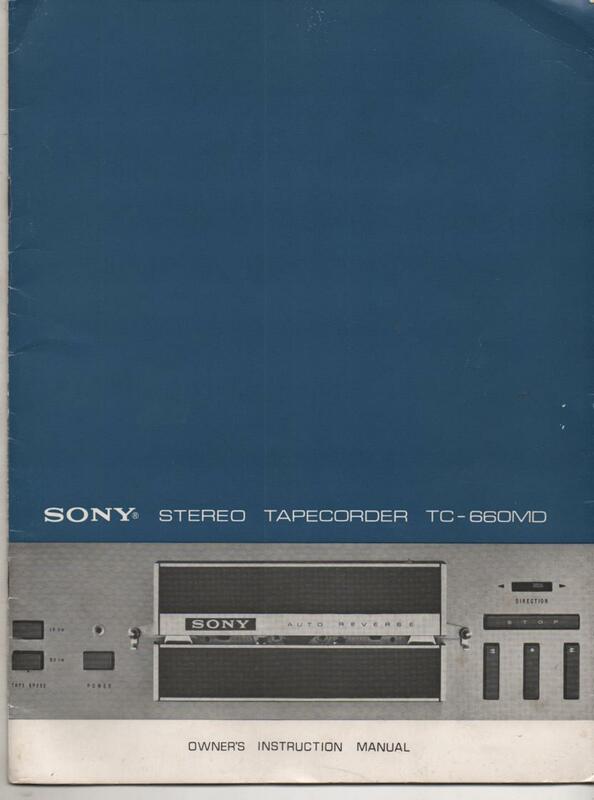 Manual SonyTC-660 Reel to Reel Service Manual PHOTO COPY! 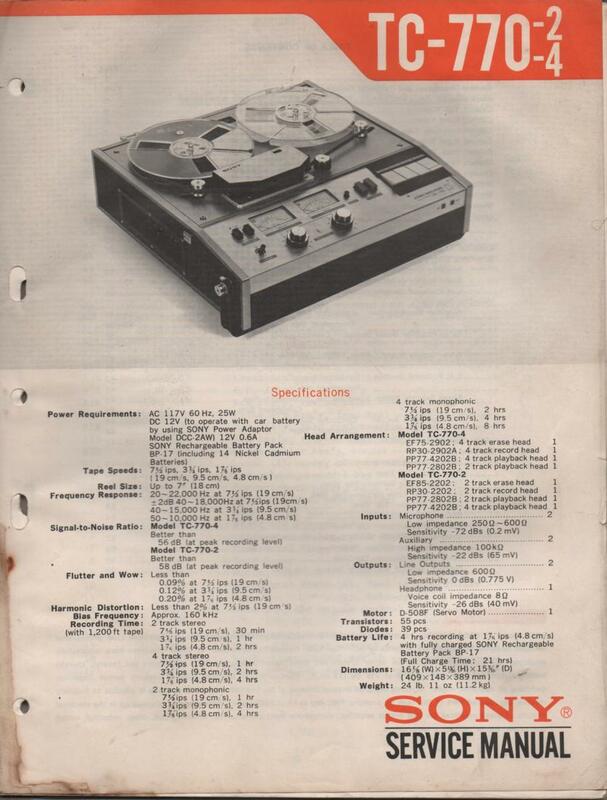 Manual SonyTC-755 Reel to Reel Service Manual PHOTO COPY! 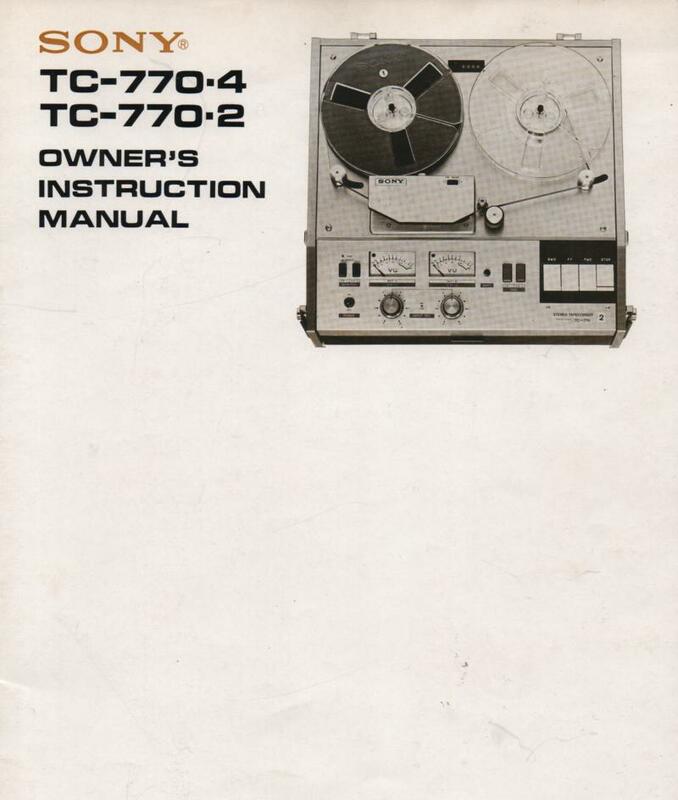 Manual SonyTC-770-2 TC-770-4 Reel to Reel Service Manual PHOTO COPY! Manual SonyTC-788-4 Reel to Reel Service Manual PHOTO COPY! 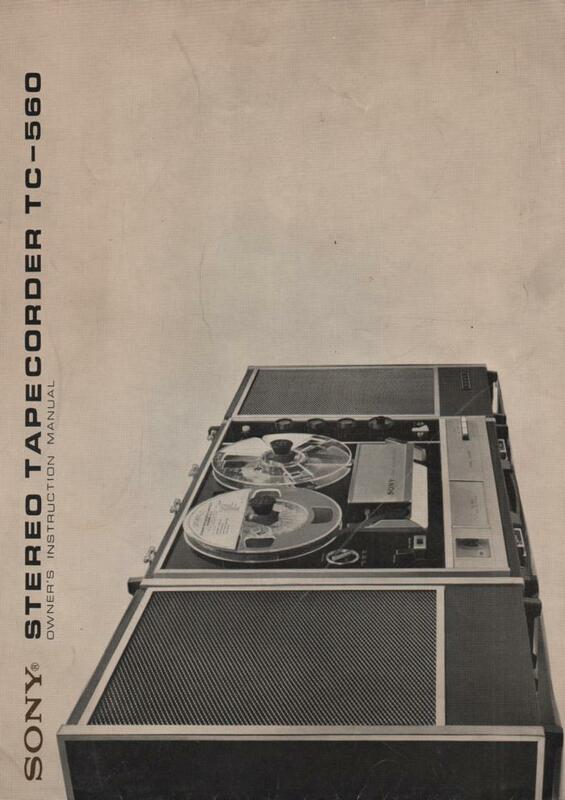 Manual SonyTC-560 Reel to Reel Owners Manual PHOTO COPY! 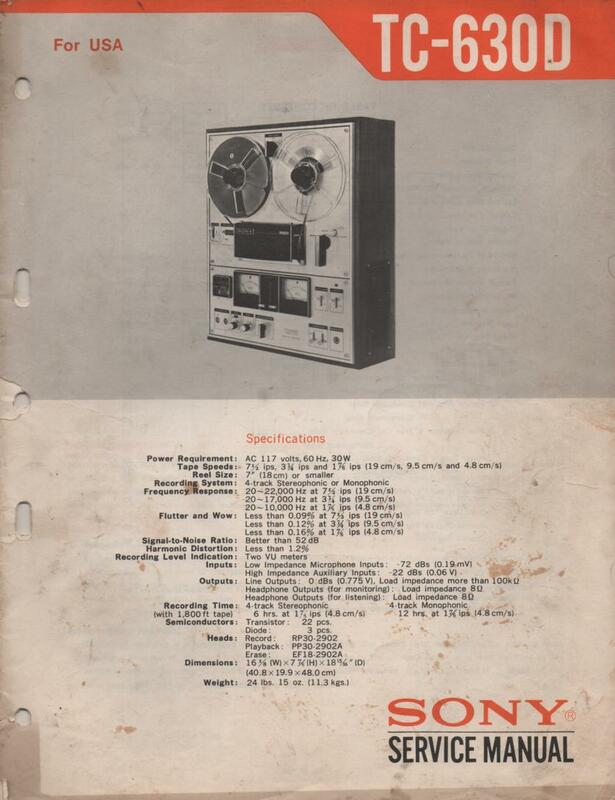 Manual SonyTC-660MD Reel to Reel owners Operating Instruction Manual PHOTO COPY! 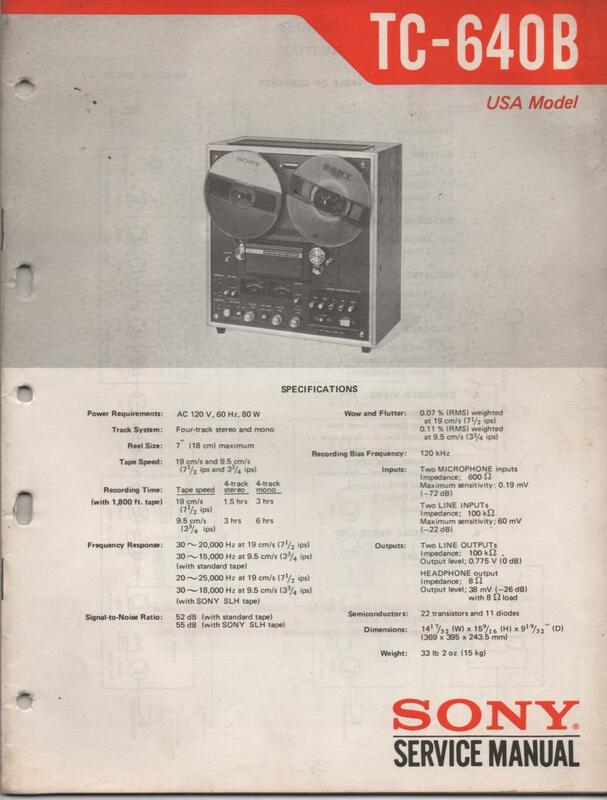 Manual SonyTC-770-2 -4 Reel to Reel owners Operating Instruction Manual PHOTO COPY! 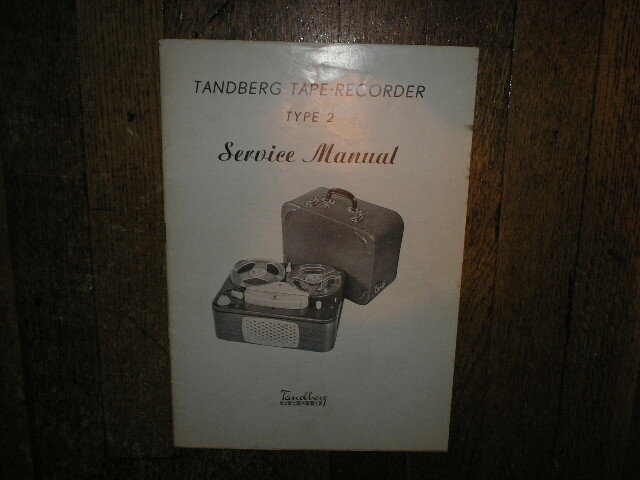 Manual TANDBERGType 2 Tape Recorder Service Manual 1 PHOTO COPY! 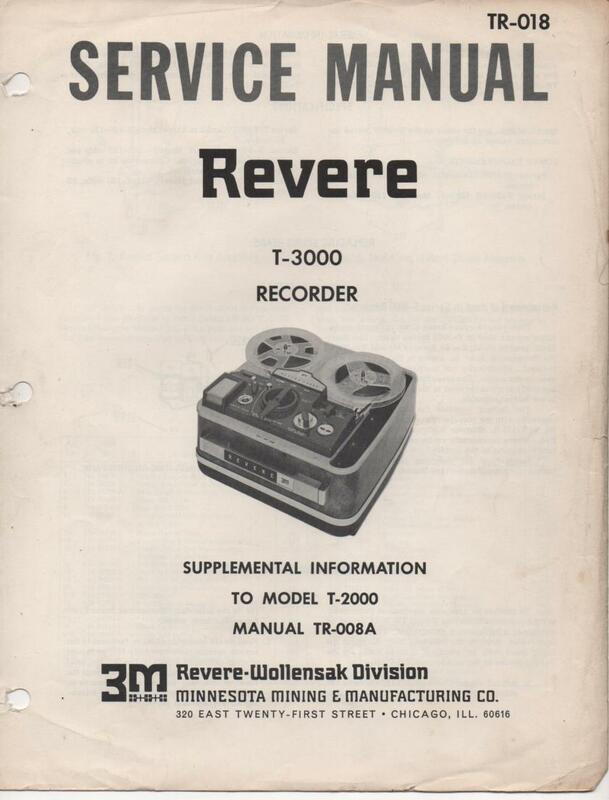 Manual TANDBERGType-2 Model-F Tape Recorder Service Manual SERIAL No.230600 and UP PHOTO COPY! 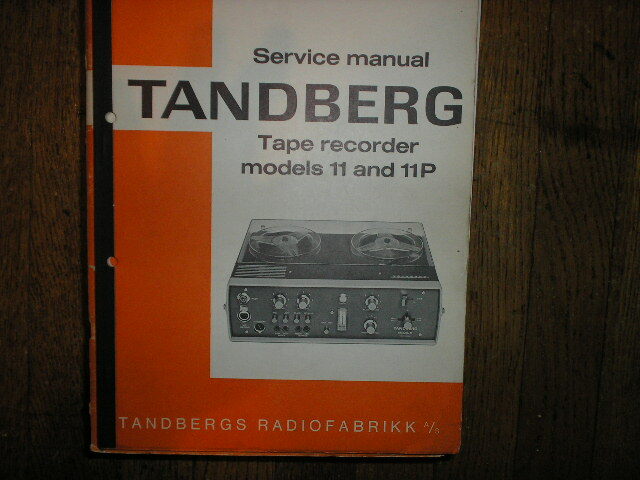 Manual TANDBERGModel 3 Hi-Fi Tape Recorder Service Manual.. Also Need Type 2 Manual 1 to complete this set.. PHOTO COPY! 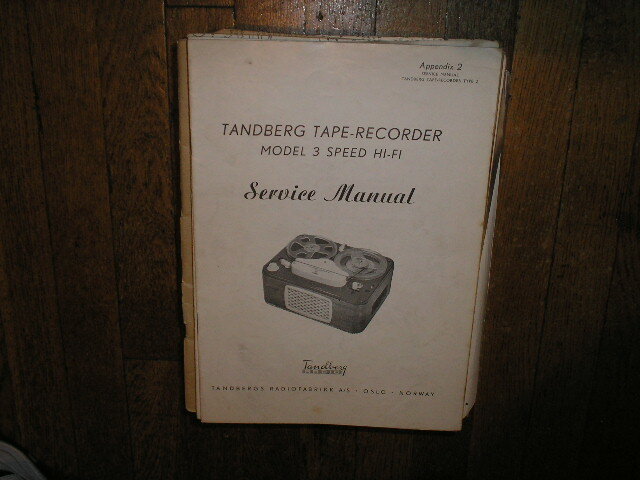 Manual TANDBERGModel 3 3B 3BF Tape Recorder Service Manual..60 Pages PHOTO COPY! 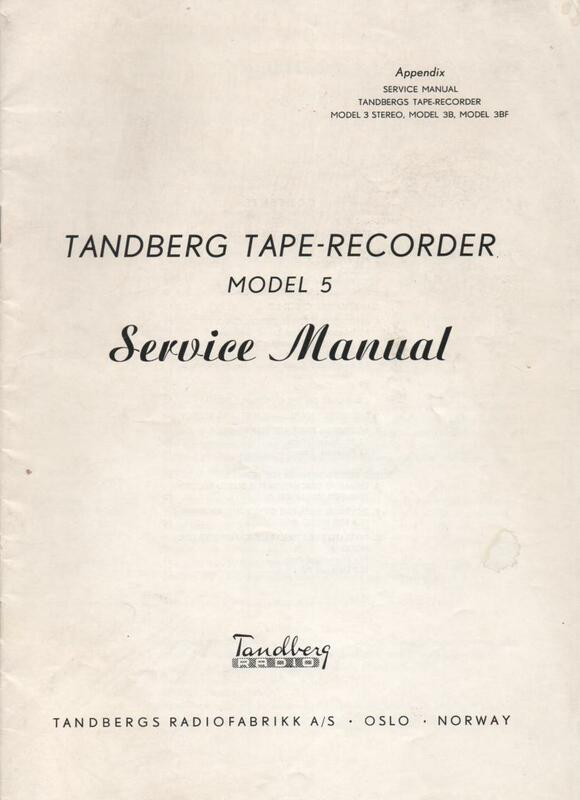 Manual TANDBERGModel 6 Tape Recorder Service Manual 1. Covers Serial No. 602700 - 607500 Need separate Schematic for Serial No. 607501 and UP. PHOTO COPY! 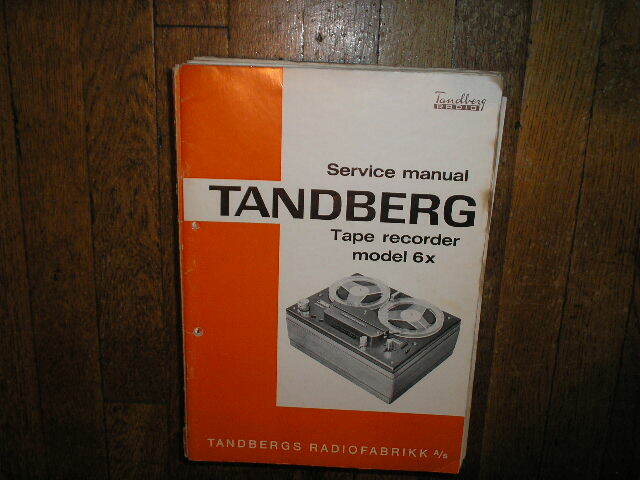 Manual TANDBERGModel 6X Tape Recorder Service Manual PHOTO COPY! 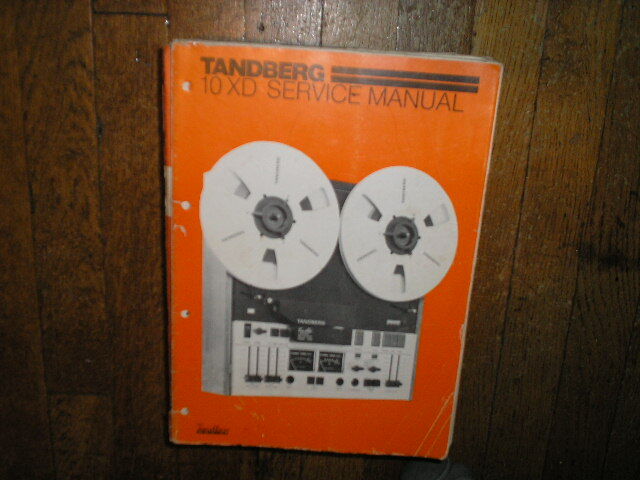 Manual TANDBERGSeries 10XD Tape Recorder Service Manual PHOTO COPY! 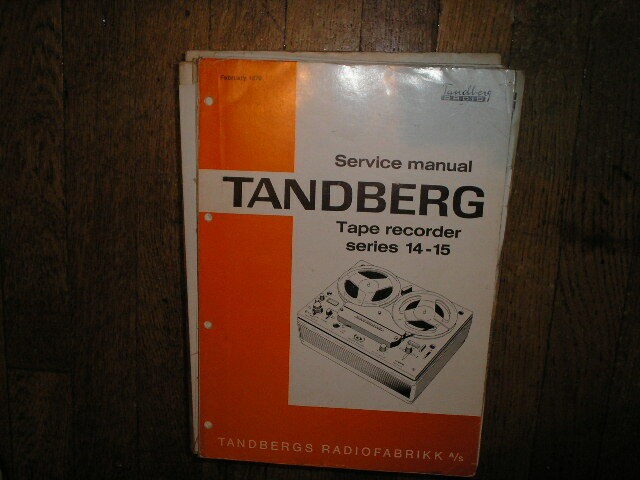 Manual TANDBERGModel 11 11P Tape Recorder Service Manual 1...50 + pages.. PHOTO COPY! 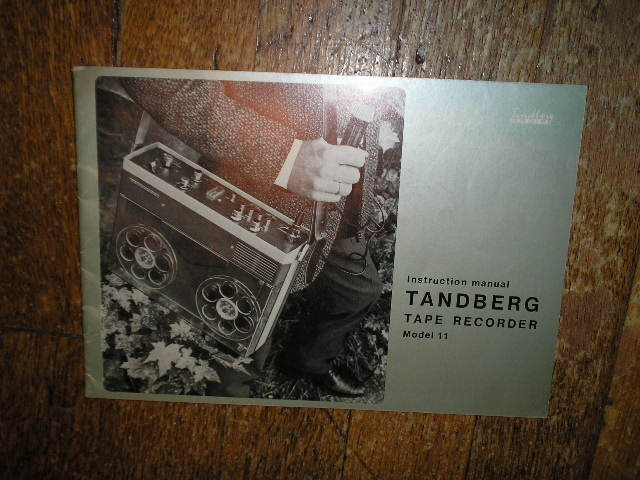 Manual TANDBERGModel 11 Tape Recorder Operating Instruction Manual 2 PHOTO COPY! 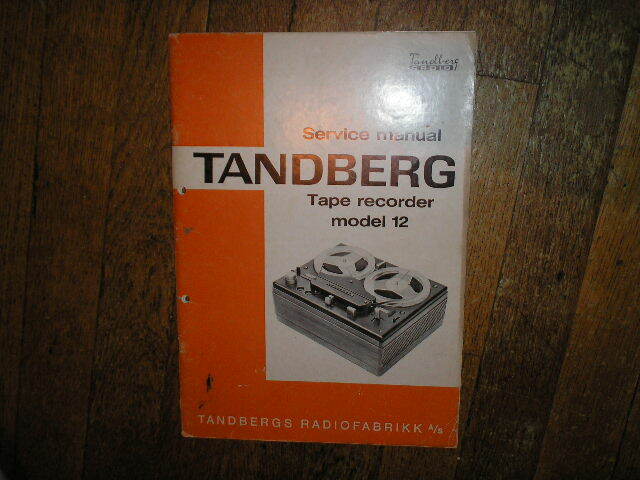 Manual TANDBERGModel 12-2 12-4 Tape Recorder Service Manual PHOTO COPY! 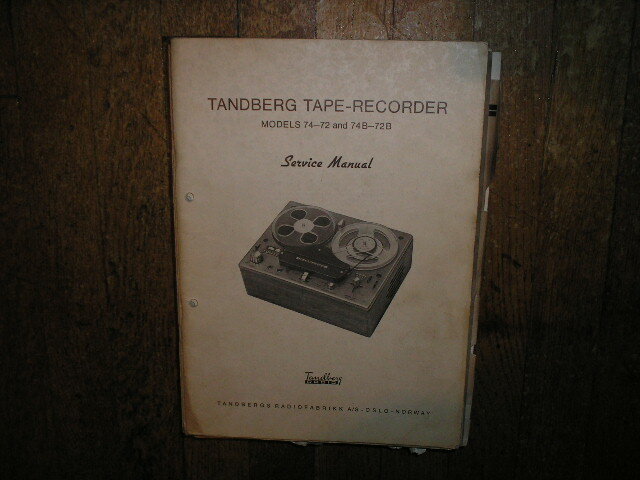 Manual TANDBERGModel 14 15 14X 15X Tape Recorder Service Manual PHOTO COPY! 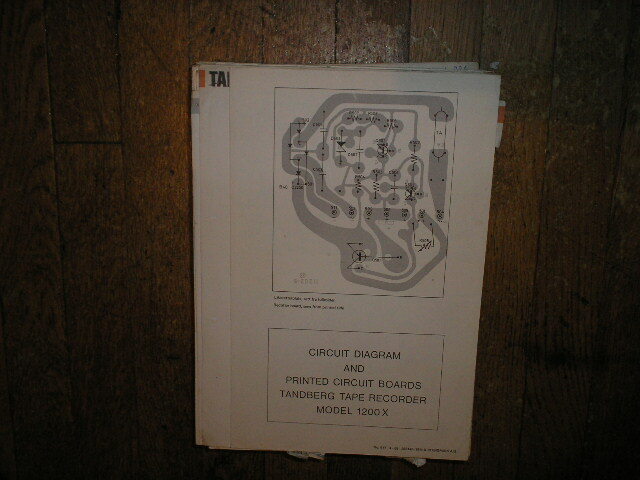 Manual TANDBERGTD20A Tape Recorder Schematic and Alignment Chart PHOTO COPY! 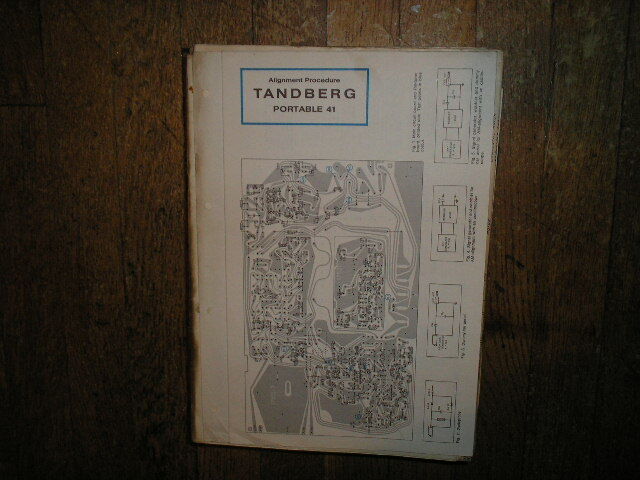 Manual TANDBERGModel 22 Schematic Only.. Large Foldout Schematic PHOTO COPY! 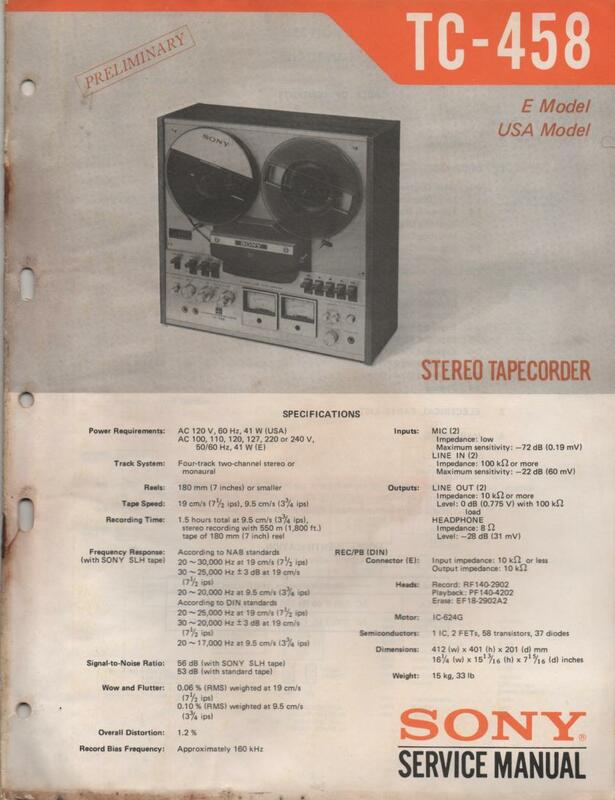 Manual TANDBERGModel 25 Tape Recorder Schematic Only.. Large Foldout Schematic PHOTO COPY! Manual TANDBERGPortable 41 Tape Recorder Schematic and Alignment Chart PHOTO COPY! 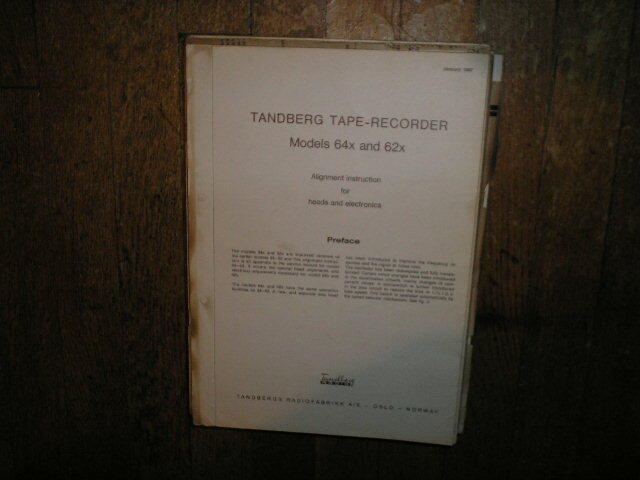 Manual TANDBERGModel 62 64 Tape Recorder Service Manual PHOTO COPY! 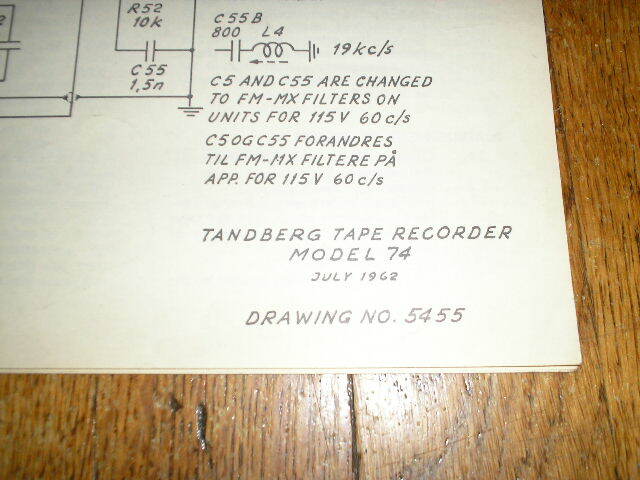 Manual TANDBERGModel 62X 64X Tape Recorder Schematic and Alignment Chart PHOTO COPY! 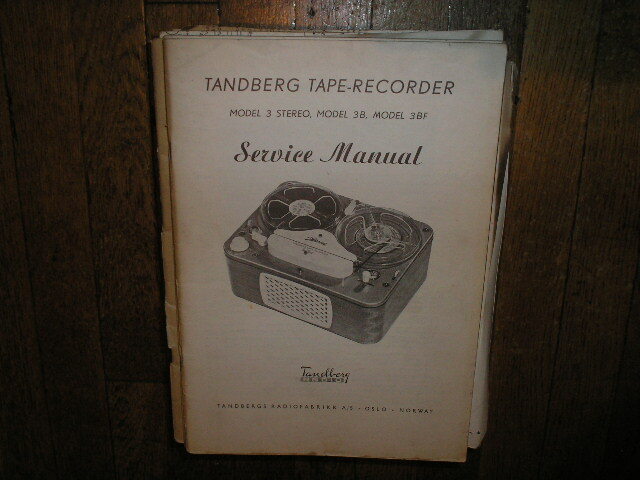 Manual TANDBERGModel 72 74 72B 74B Tape Recorder Service Manual PHOTO COPY! 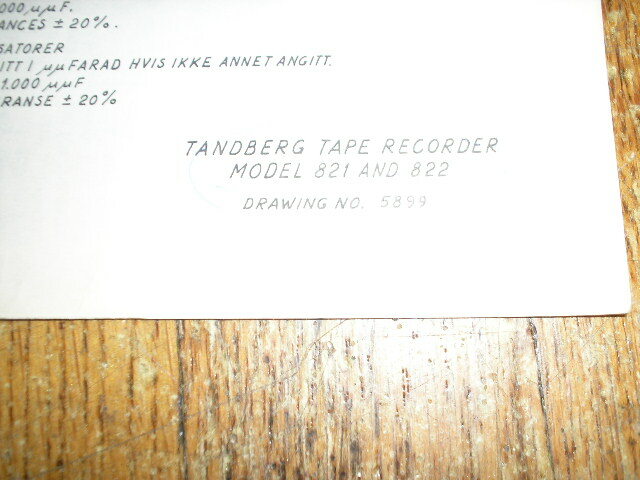 Manual TANDBERGModel 92 Tape Recorder Service Manual PHOTO COPY! 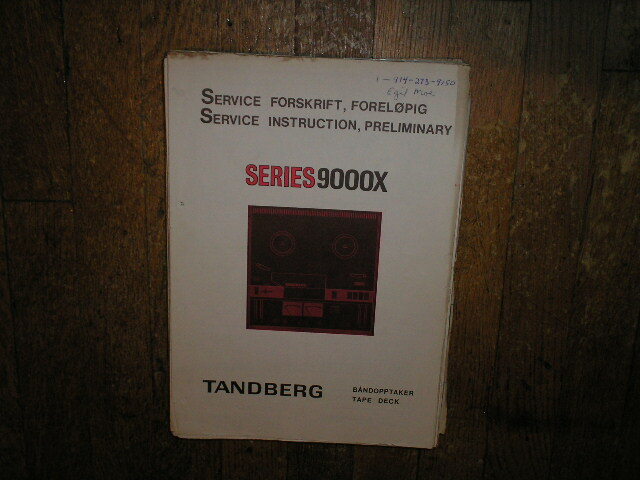 Manual TANDBERG9100X 9200XD Tape Recorder Service Manual PHOTO COPY! 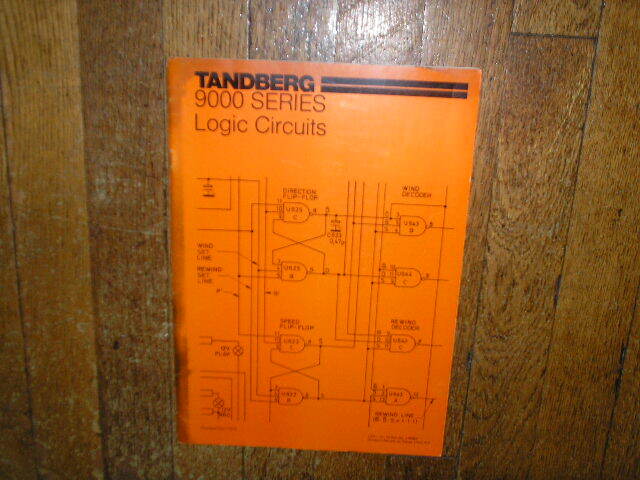 Manual TANDBERG1200X Circuit and Board Diagram Manual plus some Service Bulletins PHOTO COPY! 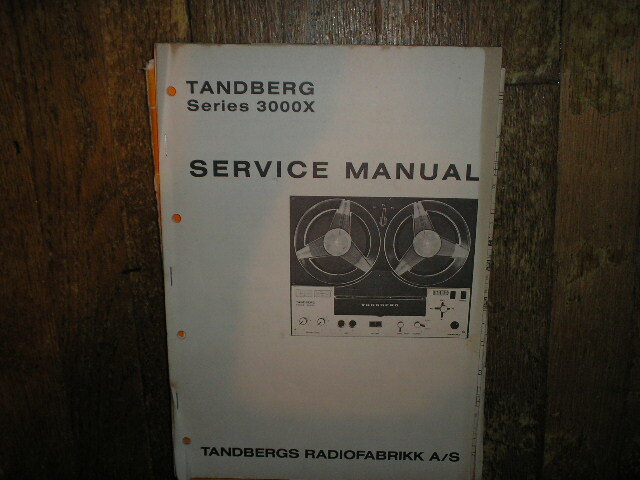 Manual TANDBERG1600X Service and Operation Manual. 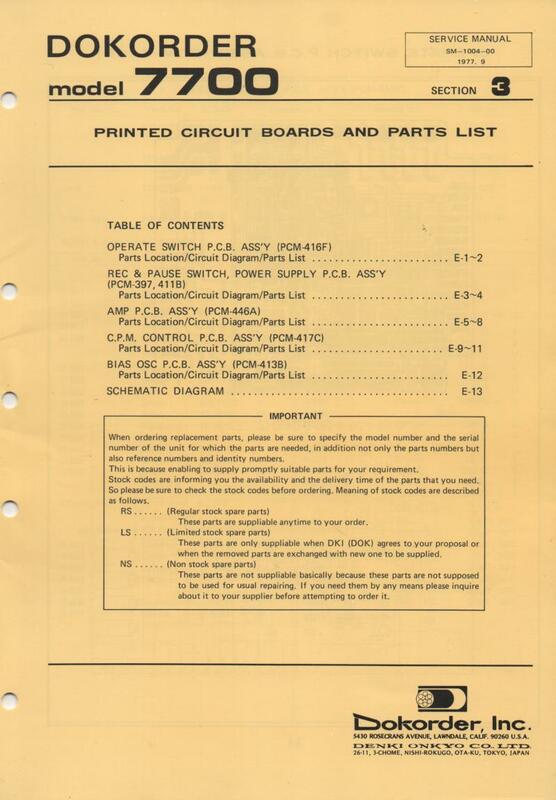 Circuit and Board Diagram Manual plus Alignment Manual some Service Bulletins (see 1200x) PHOTO COPY! 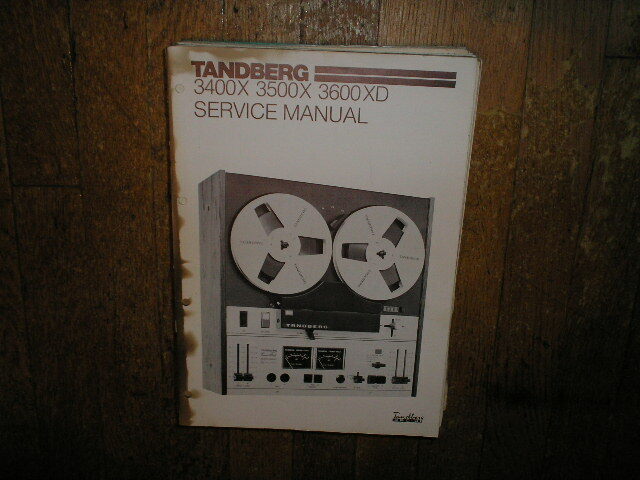 Manual TANDBERG3000X Series Tape Recorder Service Manual PHOTO COPY! Manual TANDBERG3400X 3500X 3600XD Tape Recorder Service Manual PHOTO COPY! 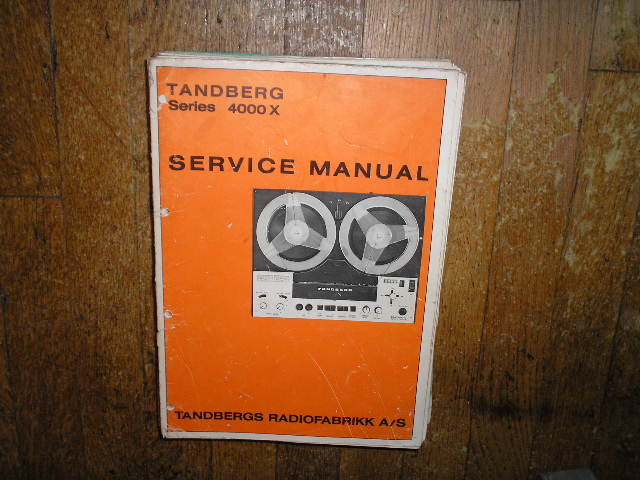 Manual TANDBERG4000X Tape Recorder Service Manual PHOTO COPY! 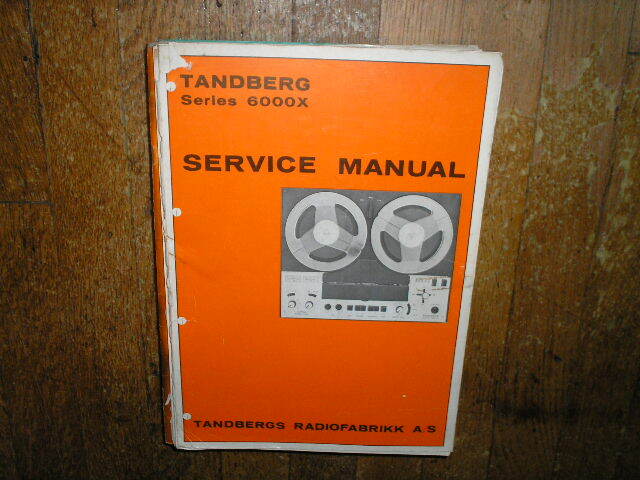 Manual TANDBERG6000X Tape Recorder Service Manual PHOTO COPY! 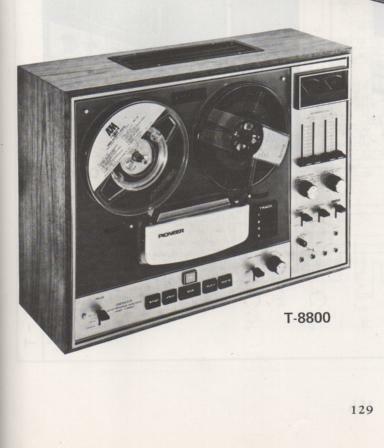 Manual TANDBERG9000X Series Tape Recorder Service Manual 3 PHOTO COPY! 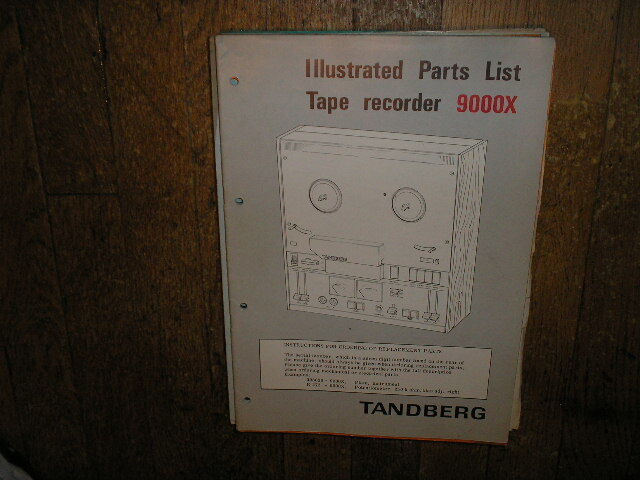 Manual TANDBERG9000X Series Tape Recorder Parts Manual 2 PHOTO COPY! 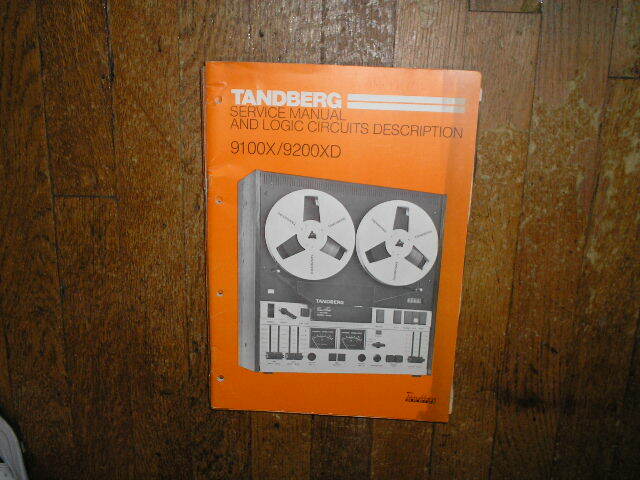 Manual TANDBERG9000 Series Tape Recorder Logic Circuit Manual 1 PHOTO COPY! 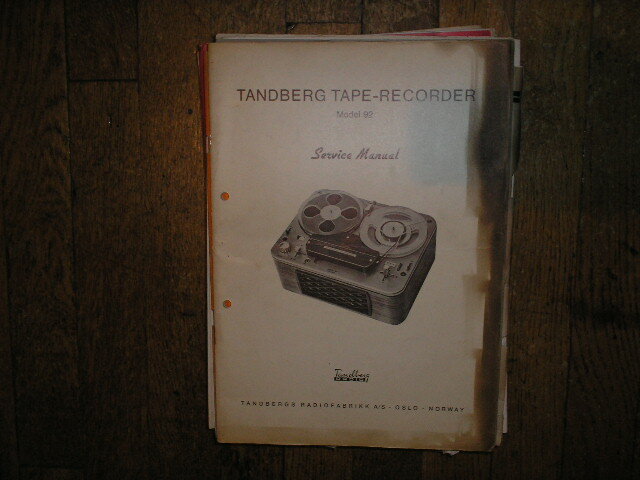 Manual TANDBERGModel 5 Tape Recorder Service Manual.. 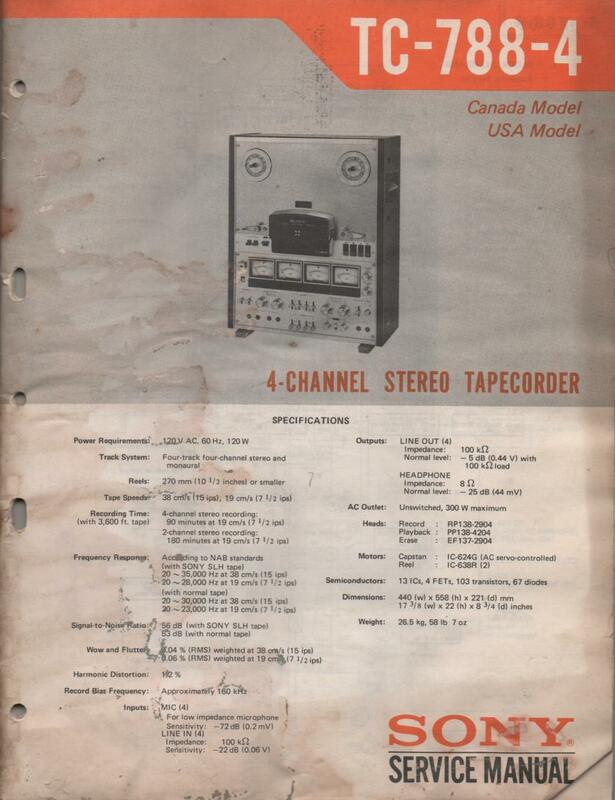 Need manual Model 3 3B 3BF Tape Recorder Service Manual for complete manual. PHOTO COPY! 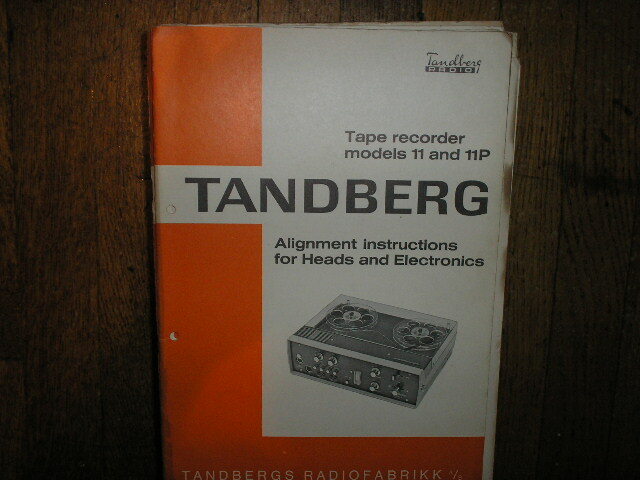 Manual TANDBERGModel 11 11P Tape Recorder Alignment Service Manual 3 PHOTO COPY! 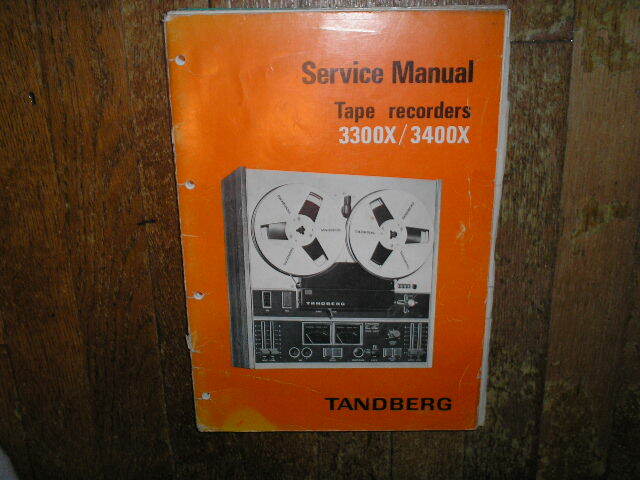 Manual TANDBERG3300X 3400X Tape Recorder Service Manual PHOTO COPY! 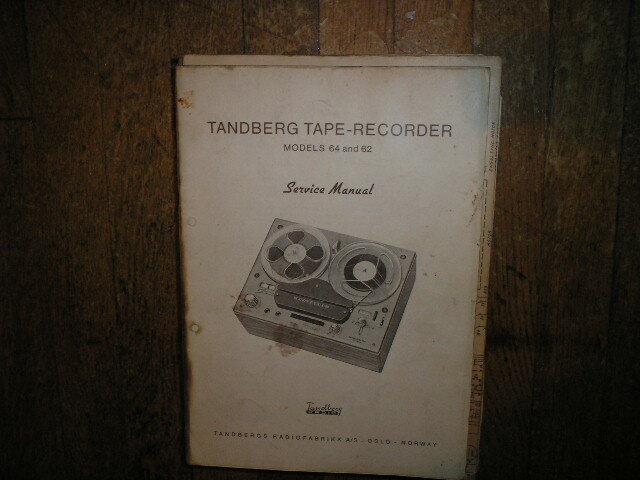 Manual TANDBERGModel 5 Tape Recorder Service Manual 2 PHOTO COPY! 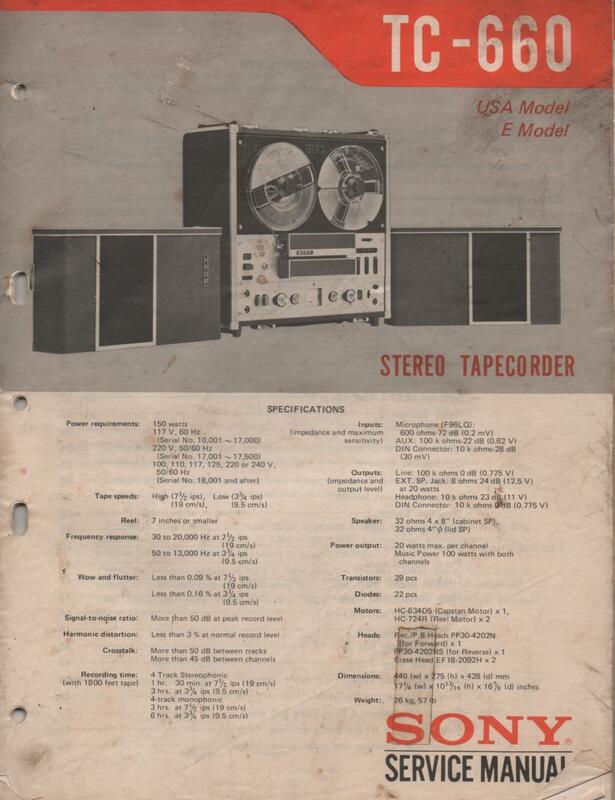 Manual TANDBERGModel 5 Tape Recorder Large Foldout Schematic PHOTO COPY! 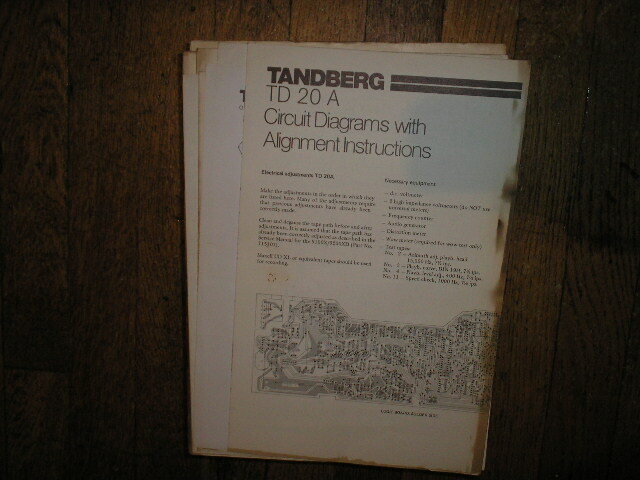 Manual TANDBERGModel 74 Large Foldout Schematic and Alignment Instructions PHOTO COPY! Manual TANDBERG821 822 Tape Recorder Schematic and Alignment Instructions PHOTO COPY! 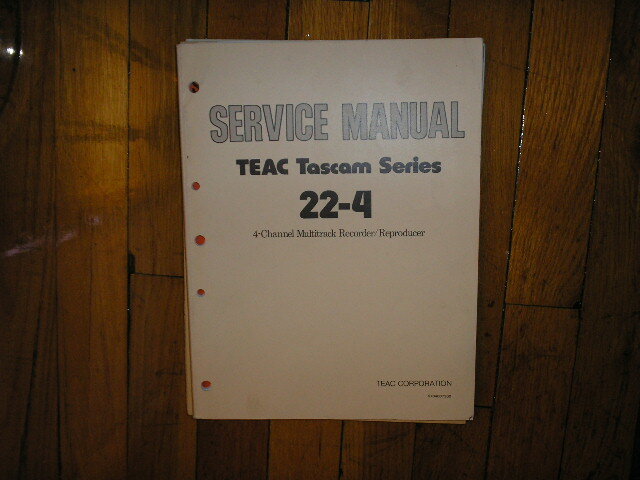 Manual TASCAM22-4 Service Manual 4-Track Reel to Reel PHOTO COPY! Manual TASCAM32-2 Service Manual 2-TRACK Reel to Reel PHOTO COPY! 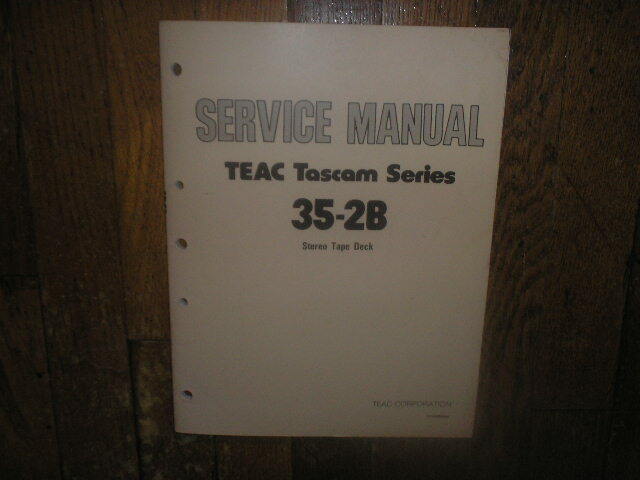 Manual TASCAM35-2B Reel to Reel Service Manual PHOTO COPY! Manual TASCAM40-4 Reel to Reel Owners Manual PHOTO COPY! Manual TEACX-300 X-300R Reel to Reel Tape Deck Owners Manual PHOTO COPY! 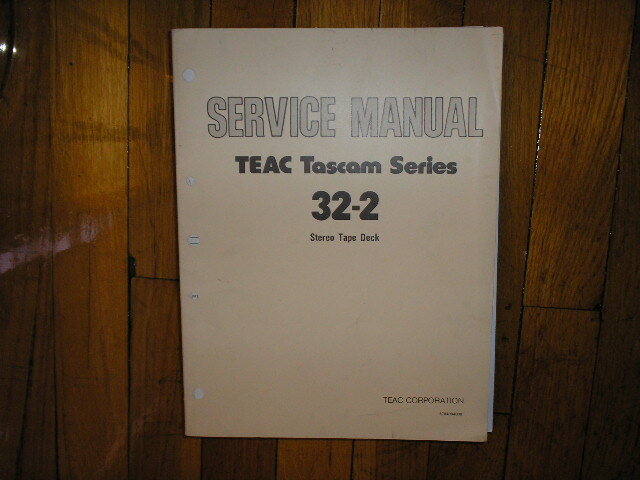 Manual TEACA-1230 A-1250 A-2300 A-2500 Reel to Reel Service Manual PHOTO COPY! Manual TEACA1230 A-1250 A-2300 A-2500 Reel to Reel Service Manual 2 PHOTO COPY! Manual TEACA1230 A-1250 A-2300 A-2500 Reel to Reel Service Parts Manual 2 PHOTO COPY! 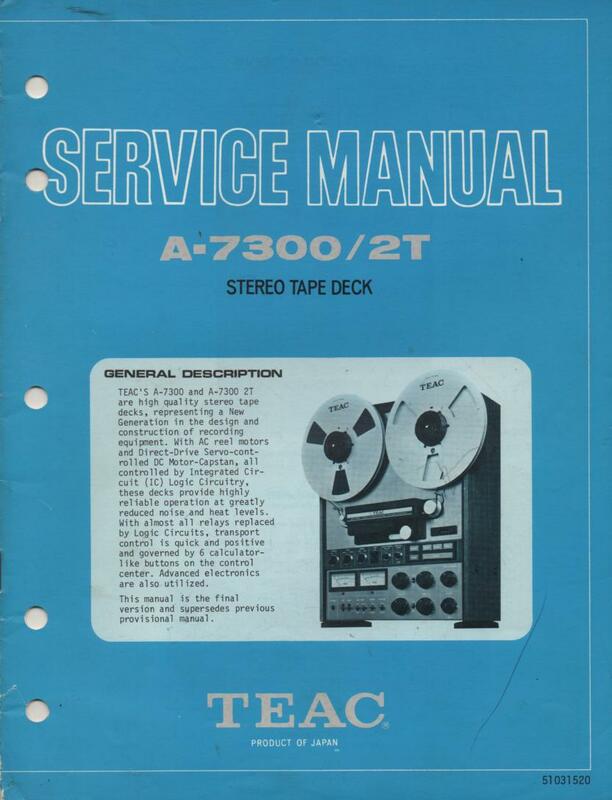 Manual TEACA-1250 A-2500 Reel to Reel Service Manual PHOTO COPY! 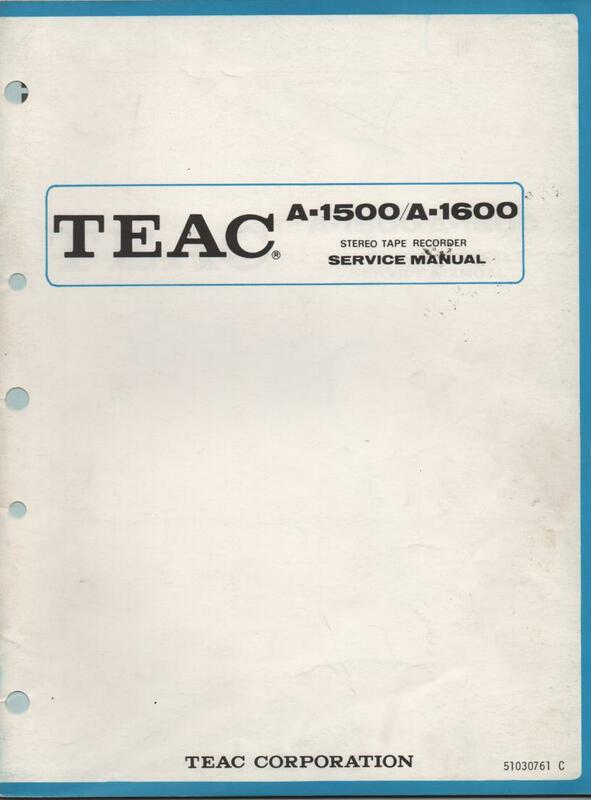 Manual TEACA-1500 Reel to Reel Service Manual PHOTO COPY! 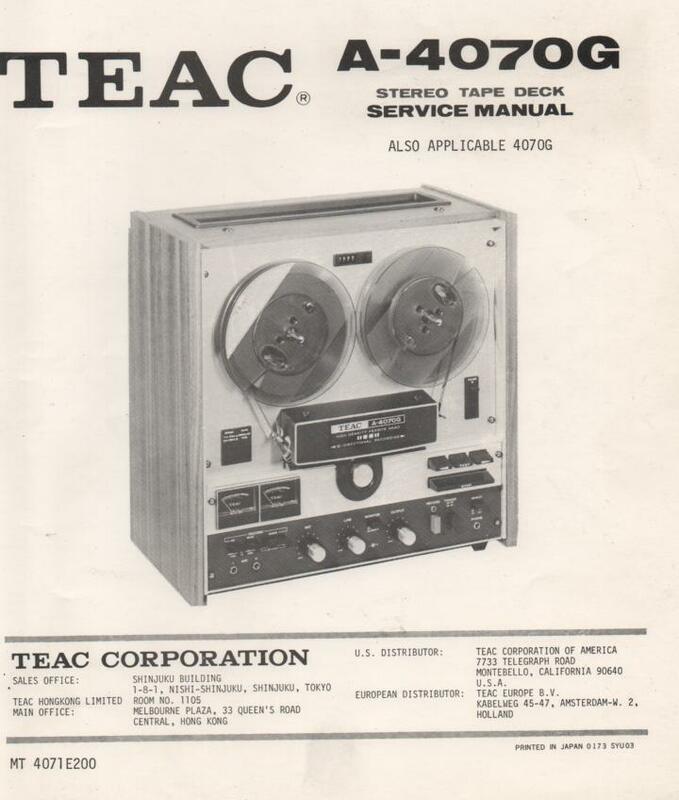 Manual TEACA-1600 Reel to Reel Service Manual PHOTO COPY! 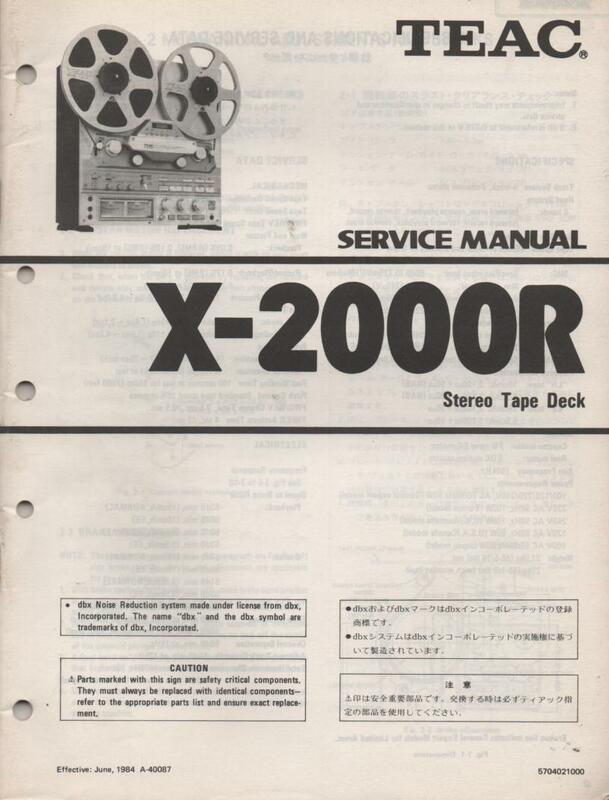 Manual TEACA-2000 A2200SX A-3300SX Reel to Reel Service Manual PHOTO COPY! Manual TEACA-2000 A2200SX A-3300SX Reel to Reel Service Parts Manual PHOTO COPY! Manual TEACA-2010 Reel to Reel Service Manual PHOTO COPY! Manual TEACA-2050 A-2010 Reel to Reel Service Manual PHOTO COPY! Manual TEACA-2060 A-2010 Reel to Reel Service Manual PHOTO COPY! 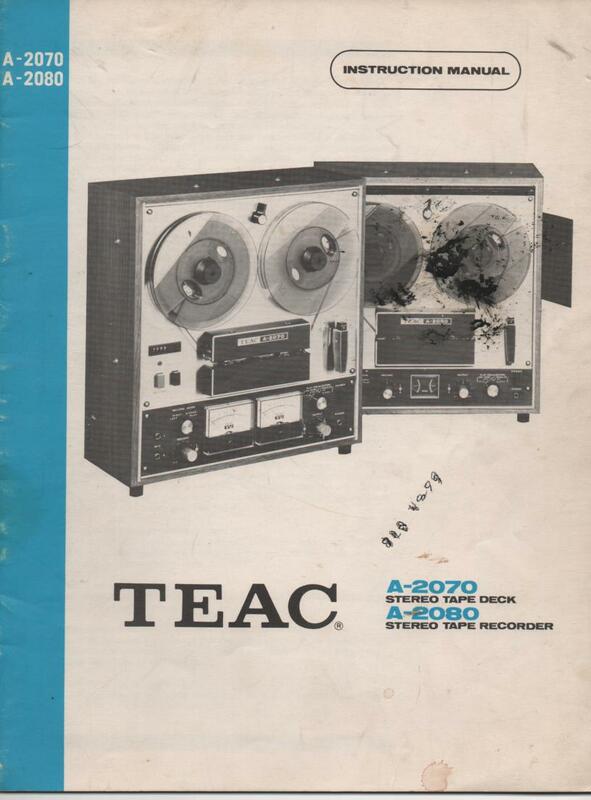 Manual TEACA-2070 A-2080 Reel to Reel Operating Instruction Manual PHOTO COPY! 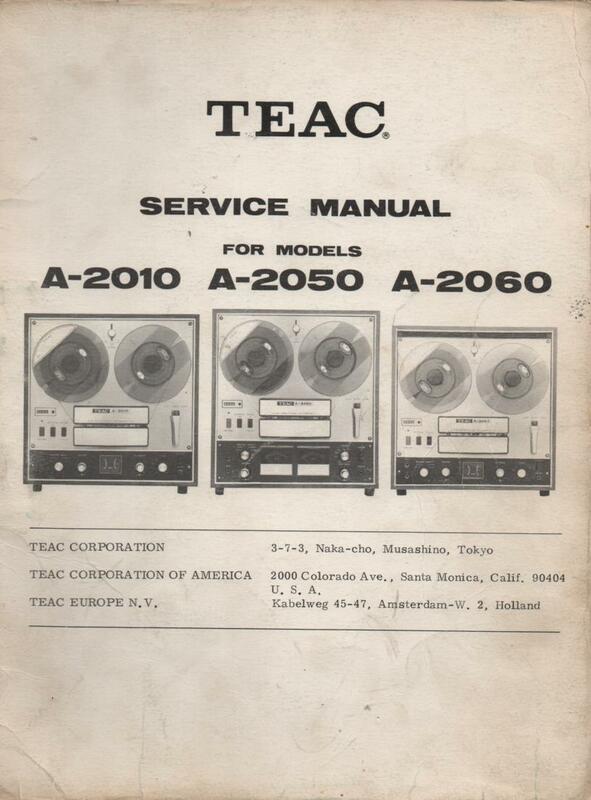 Manual TEACA-2070 A-2080 Reel to Reel Service Manual PHOTO COPY! 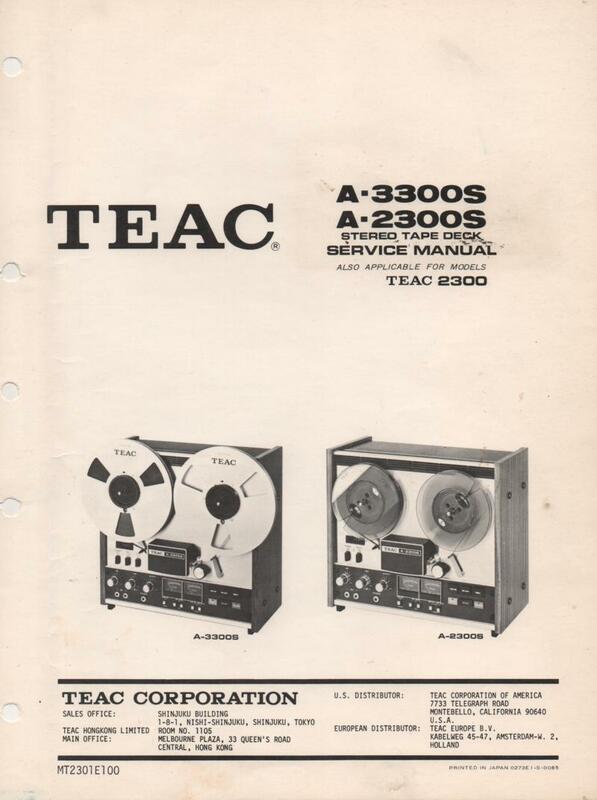 Manual TEACA-2300S A-3300S Reel to Reel Service Manual PHOTO COPY! 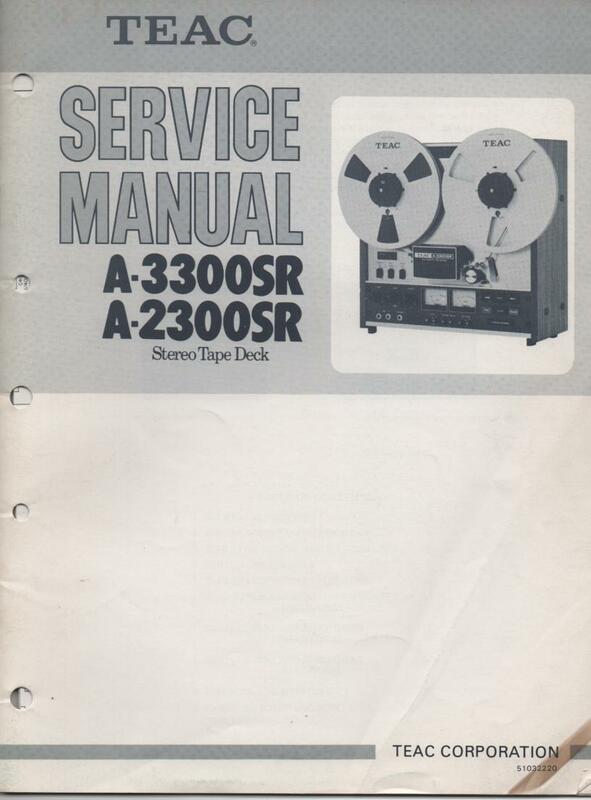 Manual TEACA-2300SR A-3300SR Reel to Reel Service Manual. 2 Manual set with foldup schematics PHOTO COPY! 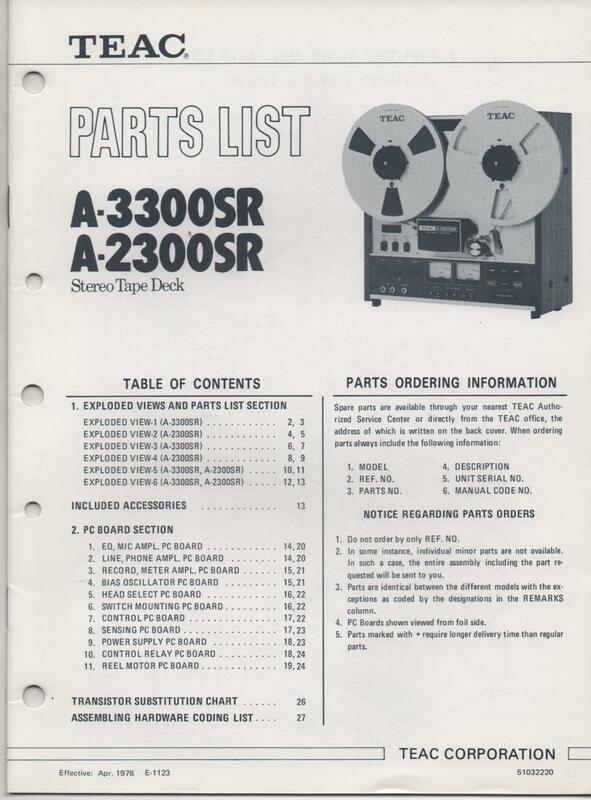 Manual TEACA-2300SR A-3300SR Reel to Reel Service Parts Manual Only PHOTO COPY! 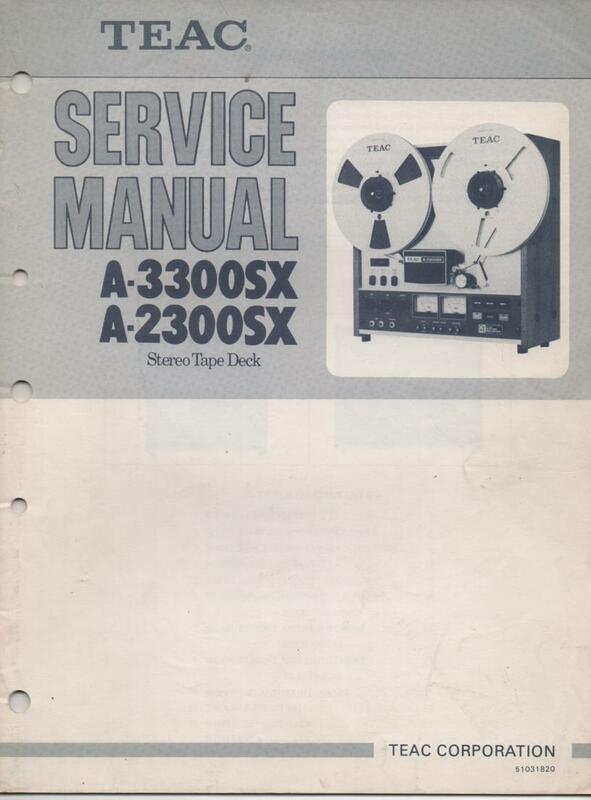 Manual TEACA-2300SX A-3300SX Reel to Reel Service Manual. 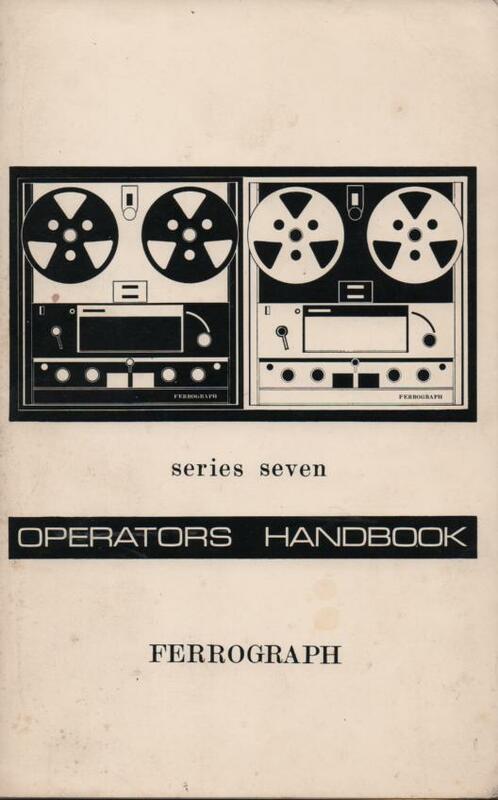 2 Manual set with foldup schematics. PHOTO COPY! 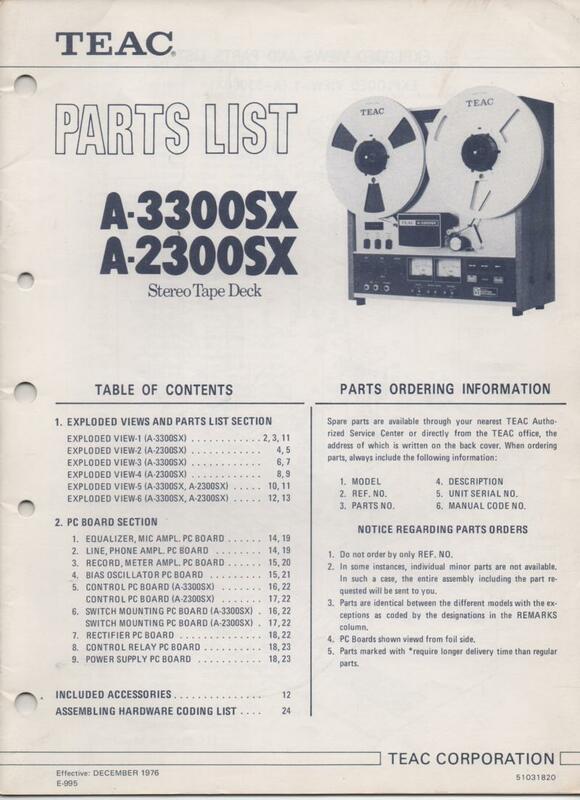 Manual TEACA-2300SX A-3300SX Reel to Reel Service Parts Manual Only. PHOTO COPY! 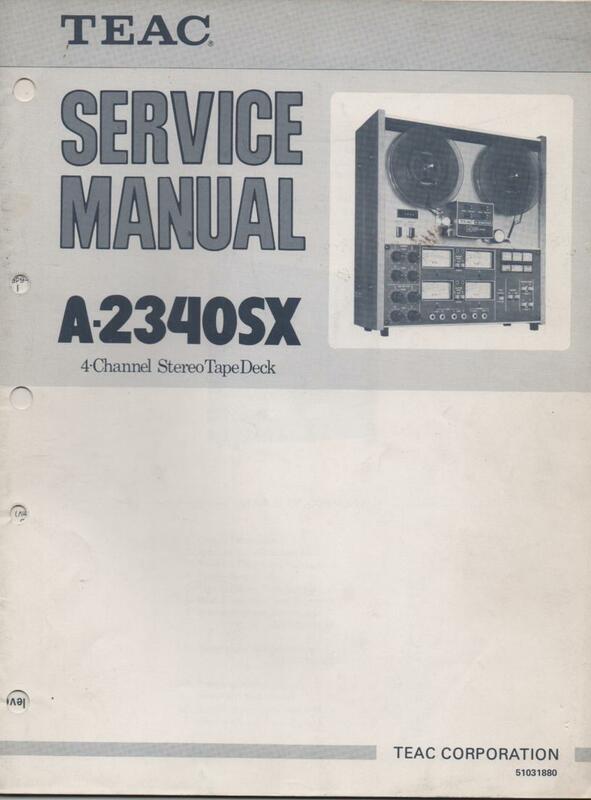 Manual TEACA-2340SX Reel to Reel Service Manual. 2 Manual set with foldout schematics. PHOTO COPY! 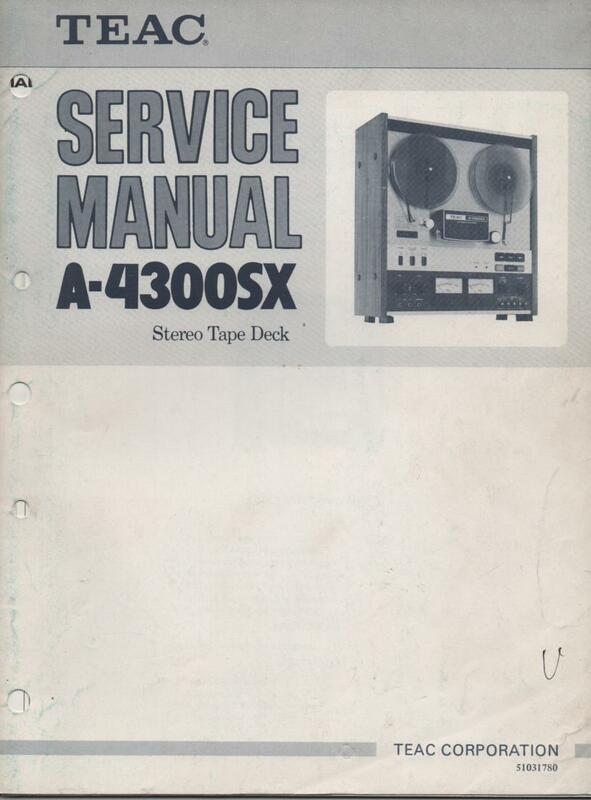 Manual TEACA-2340SX Reel to Reel Service Parts Manual. PHOTO COPY! 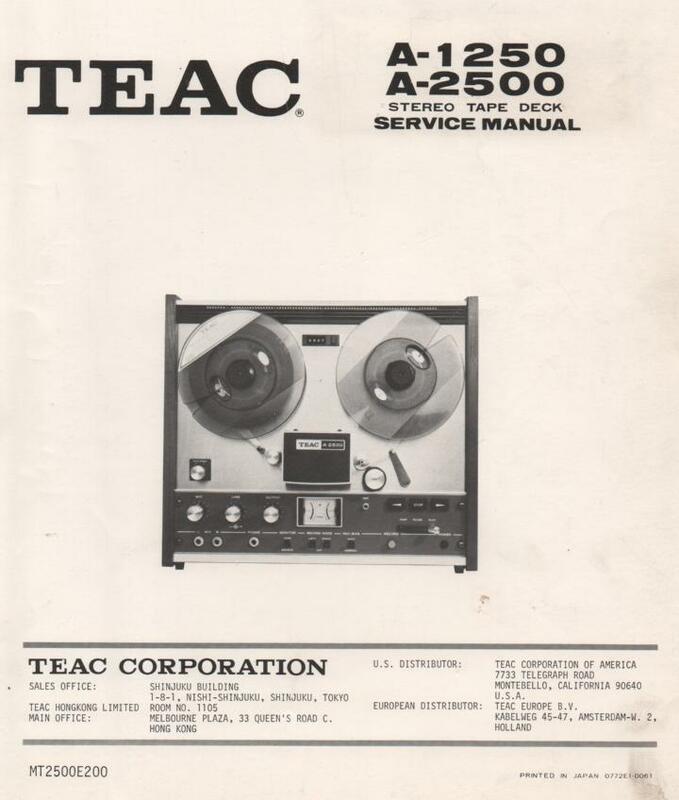 Manual TEACA-2500 A-1250 Reel to Reel Service Manual PHOTO COPY! 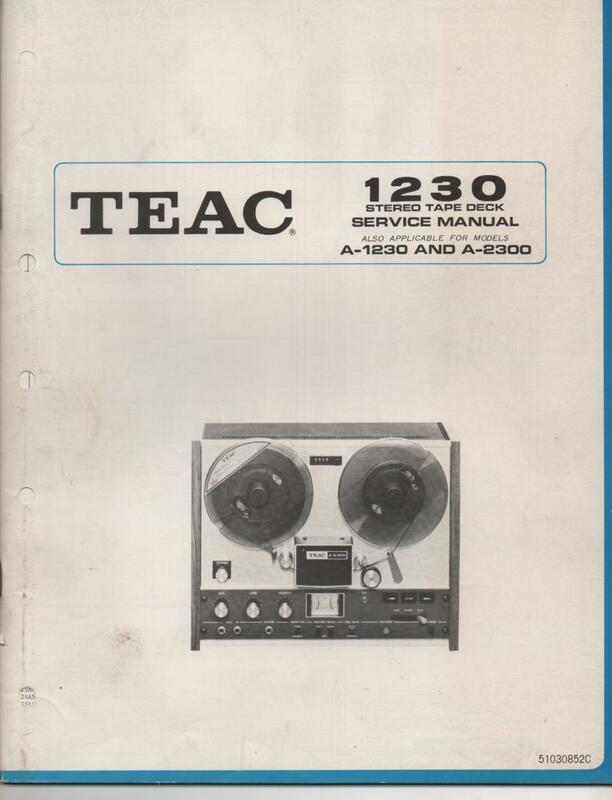 Manual TEACA-2500 A-1250 A-1230 Reel to Reel Service Manual PHOTO COPY! 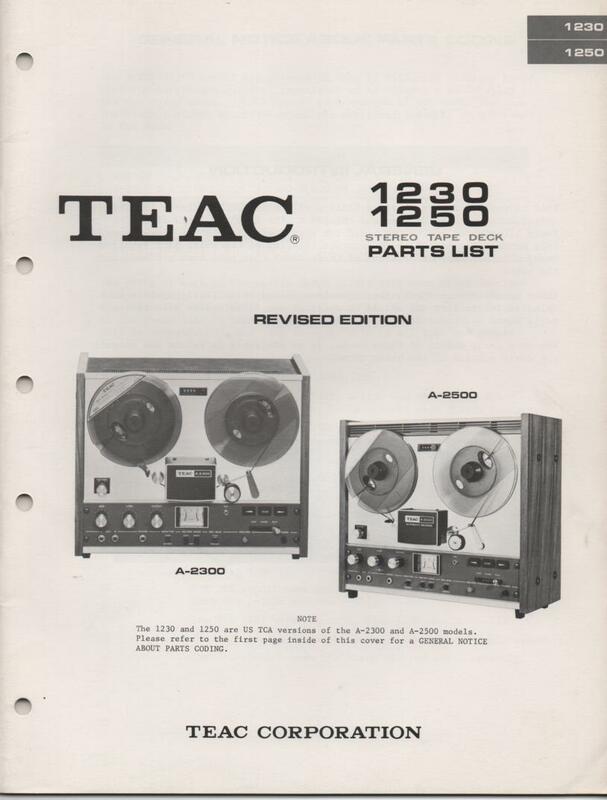 Manual TEACA-2500 A-1250 Reel to Reel Service Parts Manual PHOTO COPY! 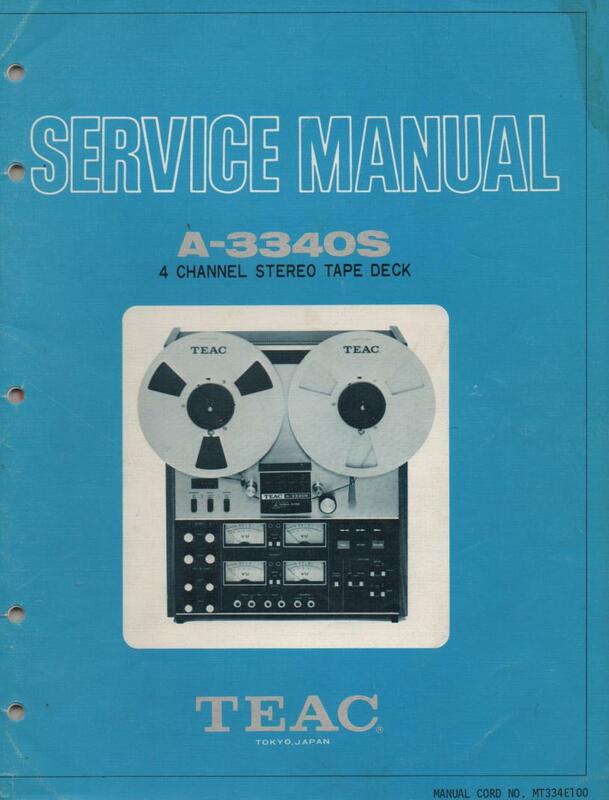 Manual TEACA-3300 A-3340 Reel to Reel Service Manual PHOTO COPY! 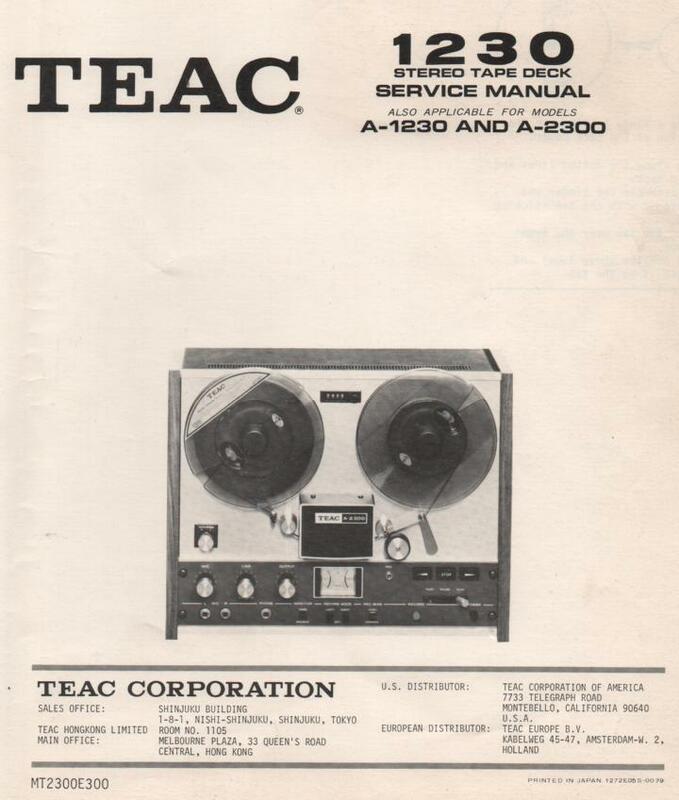 Manual TEACA-3300S A-2300S Reel to Reel Service Manual PHOTO COPY! 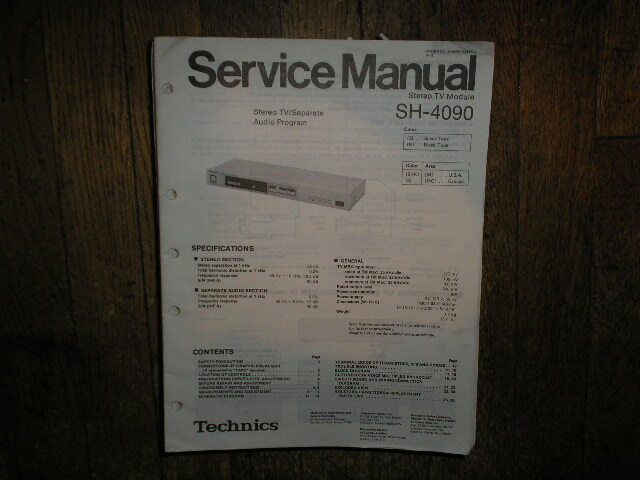 Manual TEACA-3300SR A-2300SR Reel to Reel Service Manual Set PHOTO COPY! Manual TEACA-3300SR A-2300SR Reel to Reel Parts Manual Only. PHOTO COPY! 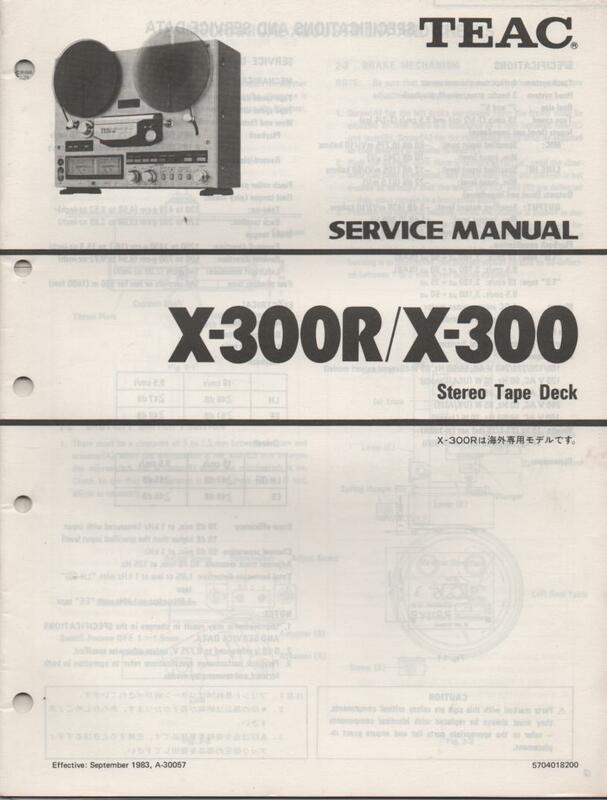 Manual TEACA-3300SX A-2300SX Reel to Reel Service Manual Set PHOTO COPY! 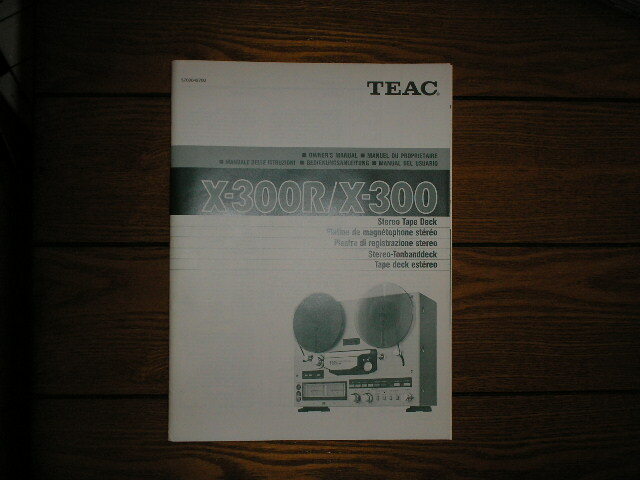 Manual TEACA-3300SX A-2300SX Reel to Reel Parts Manual Only PHOTO COPY! 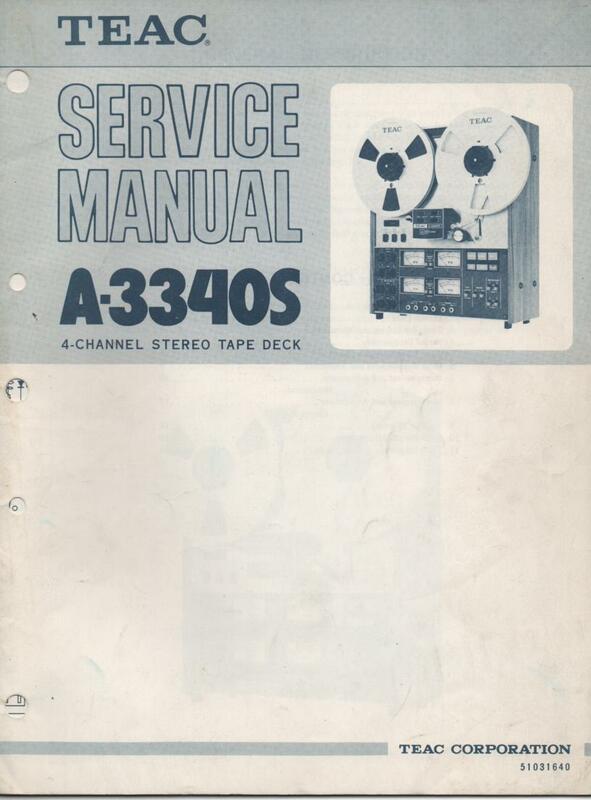 Manual TEACA-3340 A-3300 Reel to Reel Service Manual PHOTO COPY! Manual TEACA-3340S 1973 Reel to Reel Service Manual Set PHOTO COPY! Manual TEACA-3340S 1973 Reel to Reel Parts Manual Only PHOTO COPY! 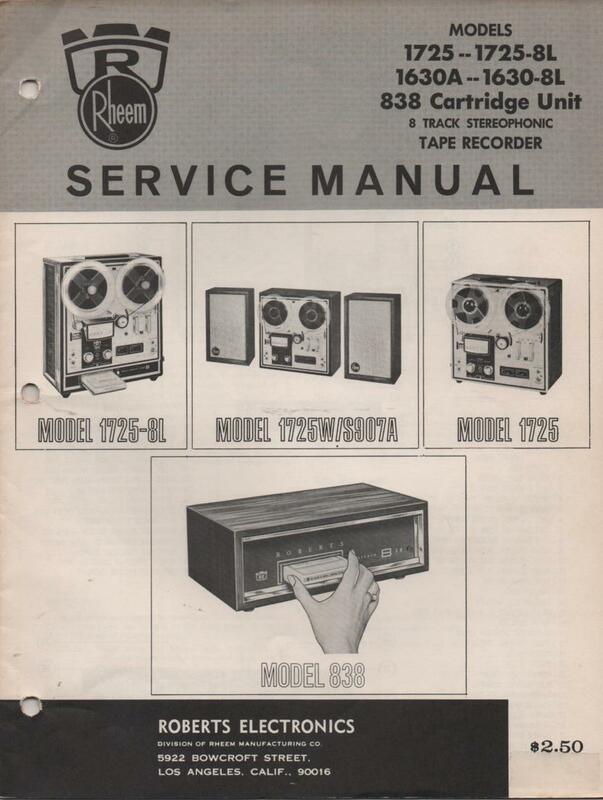 Manual TEACA-3340S 1975 Reel to Reel Service Manual Set PHOTO COPY! 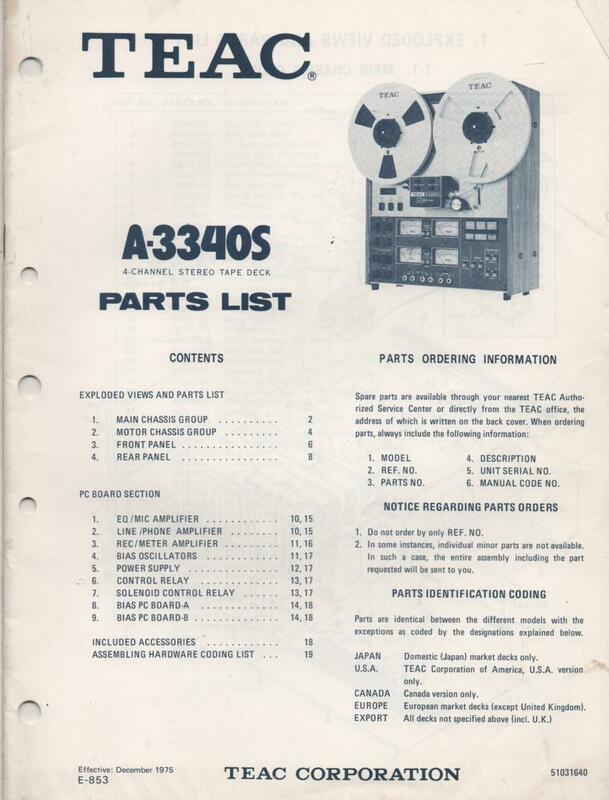 Manual TEACA-3340S 1975 Reel to Reel Parts Manual PHOTO COPY! 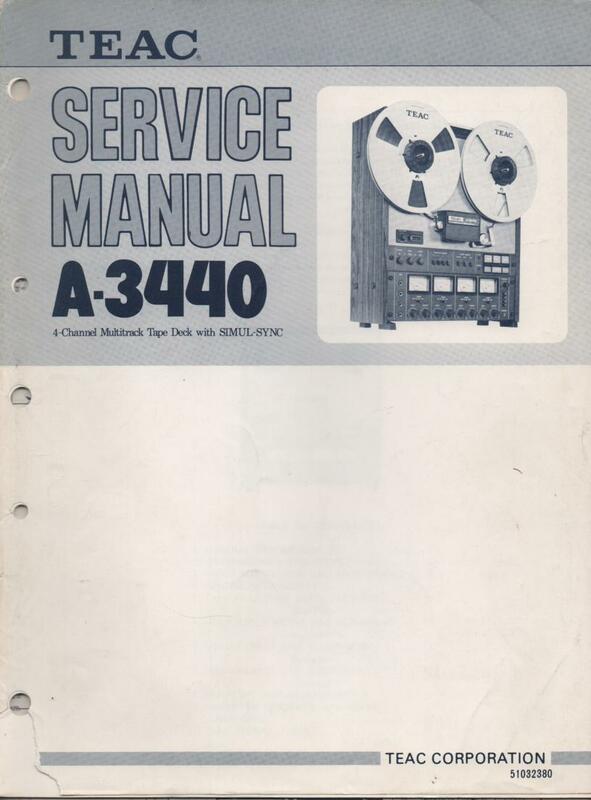 Manual TEACA-3440 Reel to Reel Service Manual Set. 3 Manuals Set. PHOTO COPY! 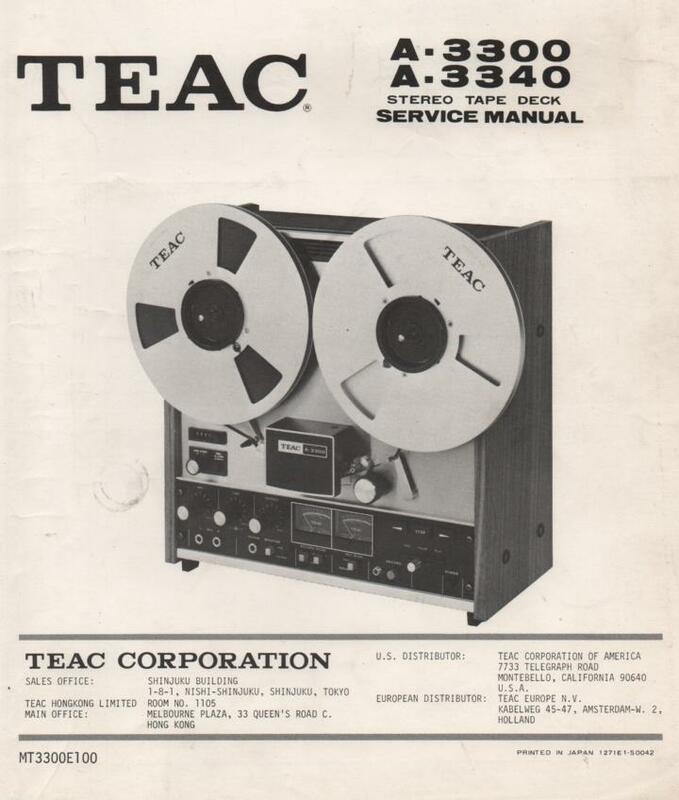 Manual TEACA-3440 Reel to Reel Circuit Description Service Manual PHOTO COPY! 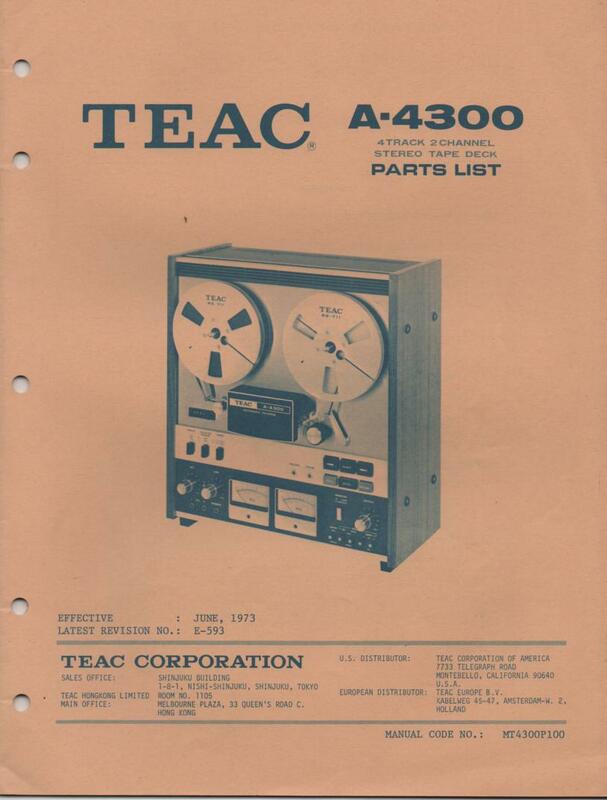 Manual TEACA-3440 Reel to Reel Parts Manual Only PHOTO COPY! 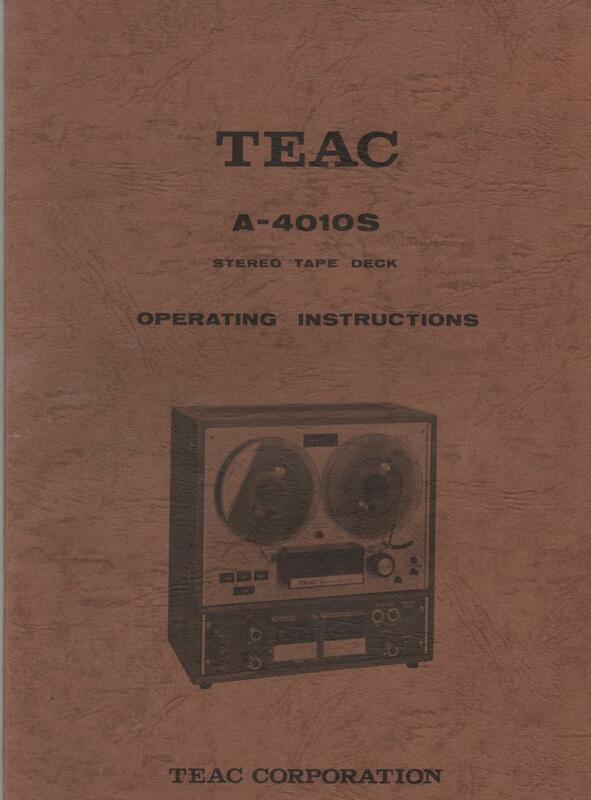 Manual TEACA-4010S Reel to Reel Operating Instruction Manual with Schematics PHOTO COPY! 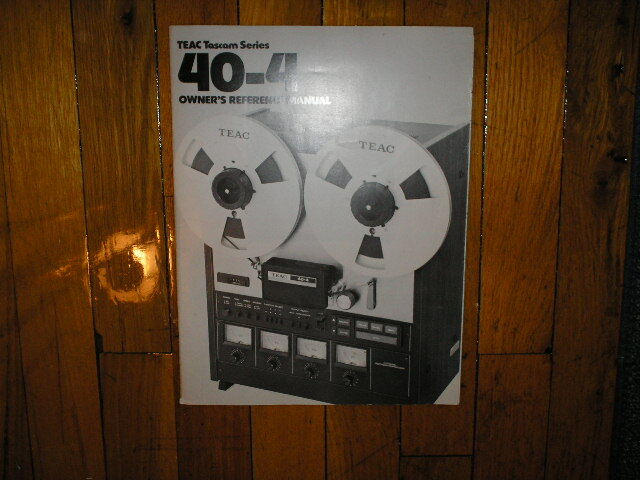 Manual TEACA-4010GSL Reel to Reel Service Manual PHOTO COPY! 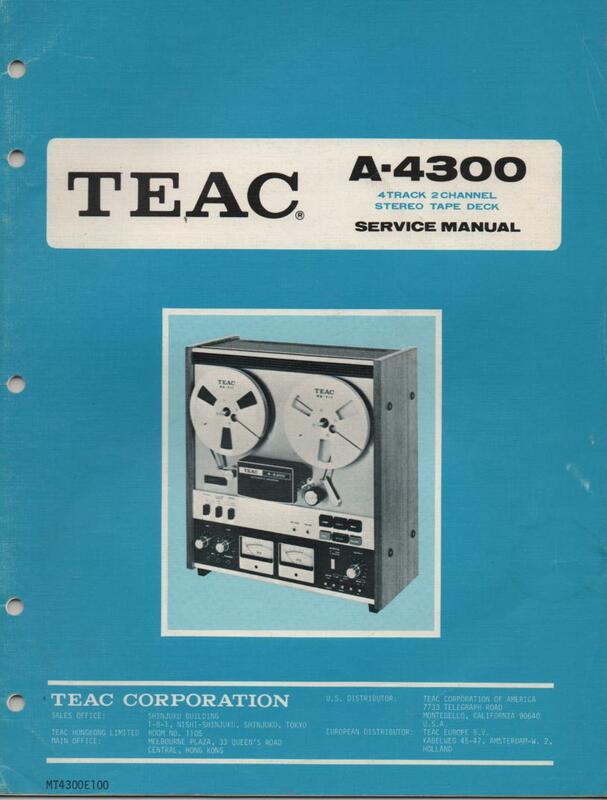 Manual TEACA-4070G Reel to Reel Service Manual PHOTO COPY! 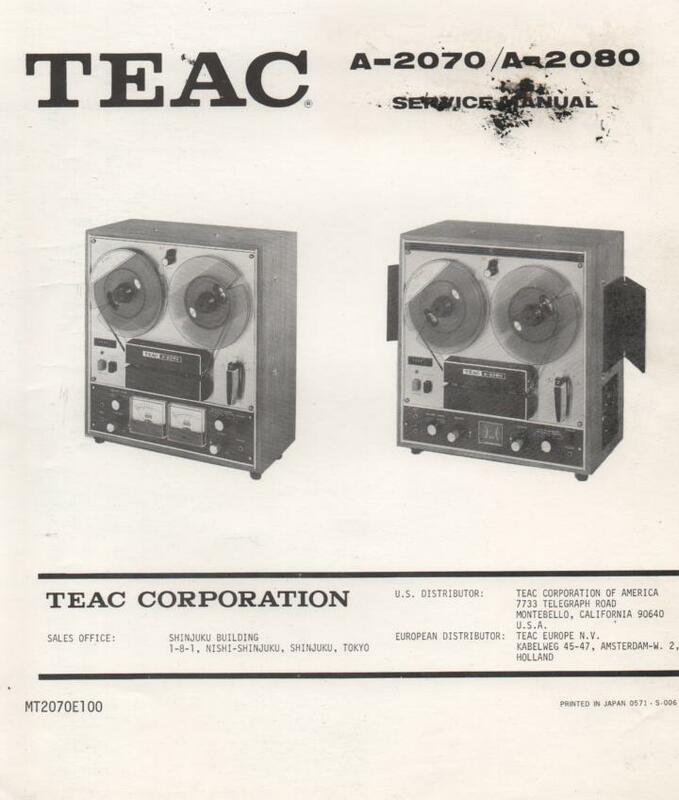 Manual TEACA-4300 Reel to Reel Service Manual Set.. 2 Manuals PHOTO COPY! 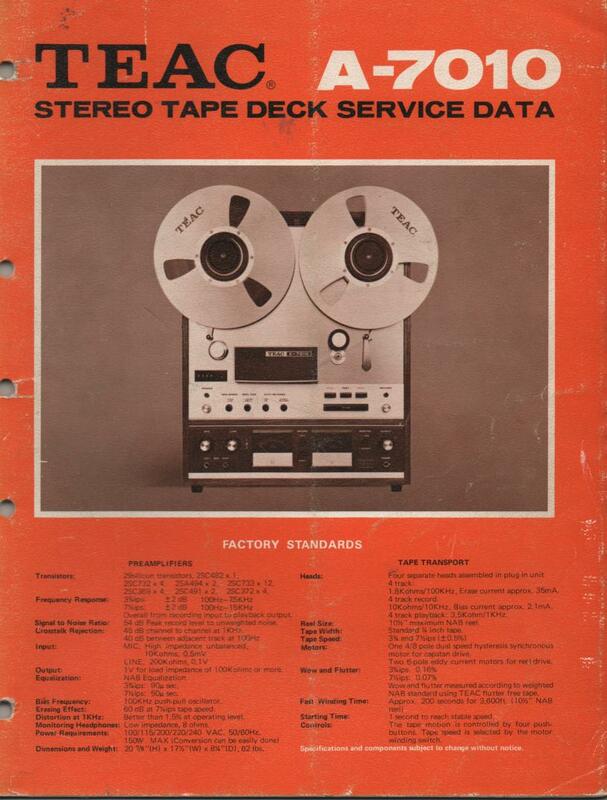 Manual TEACA-4300 Reel to Reel Service Parts Manual Only PHOTO COPY! 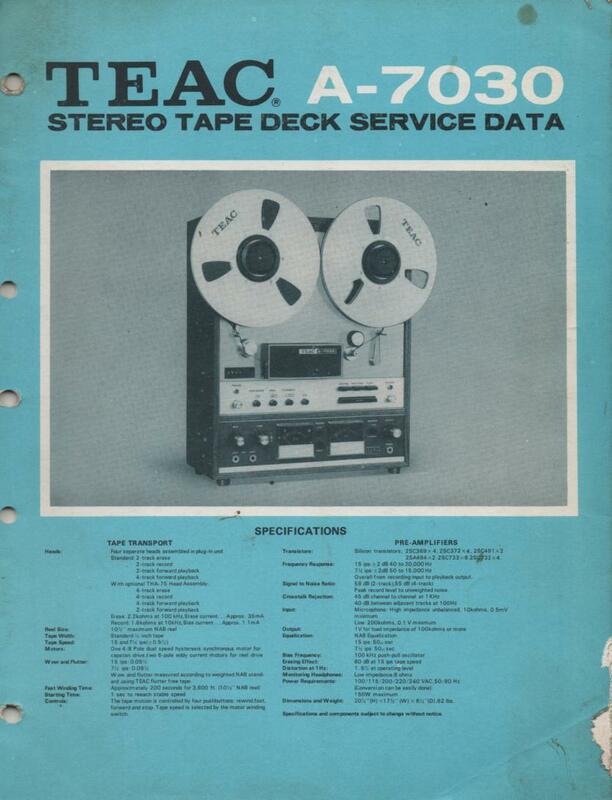 Manual TEACA-4300SX Reel to Reel Service Manual Set PHOTO COPY! 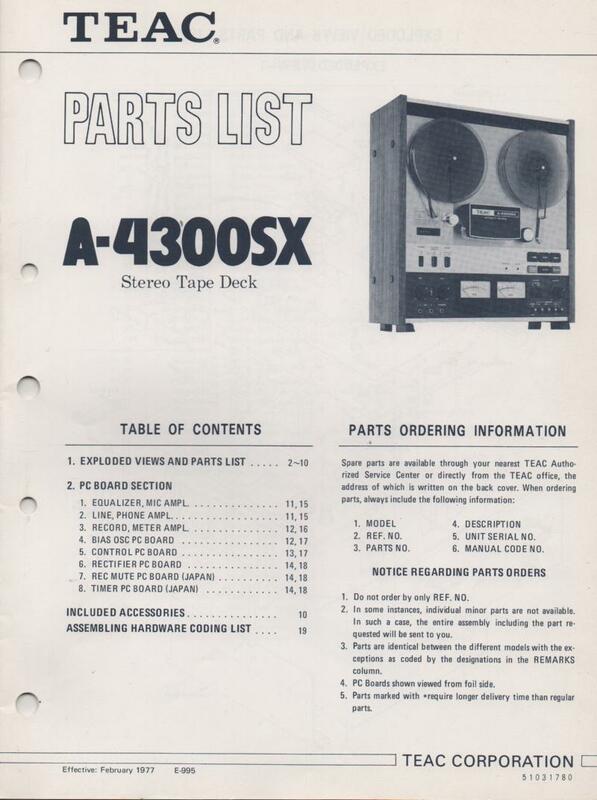 Manual TEACA-4300SX Reel to Reel Parts Service Manual Only PHOTO COPY! 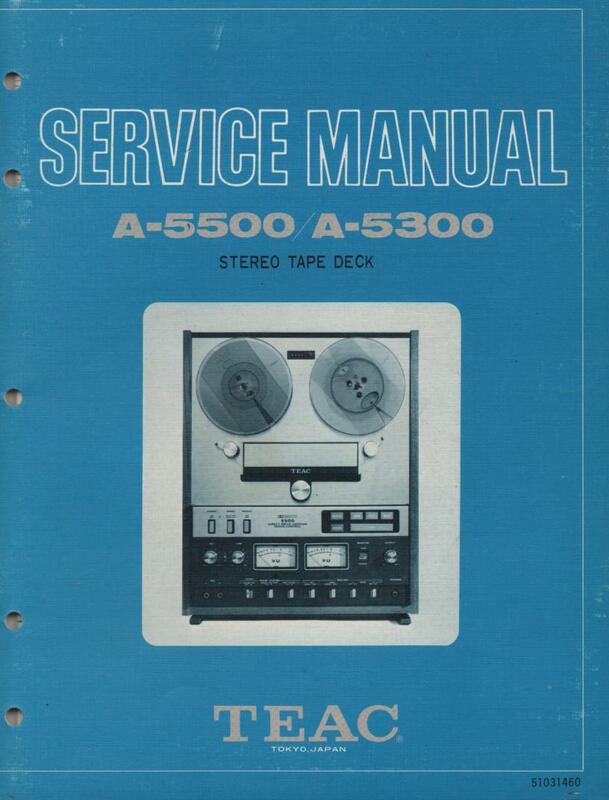 Manual TEACA-5300 A-5500 Reel to Reel Service Manual PHOTO COPY! 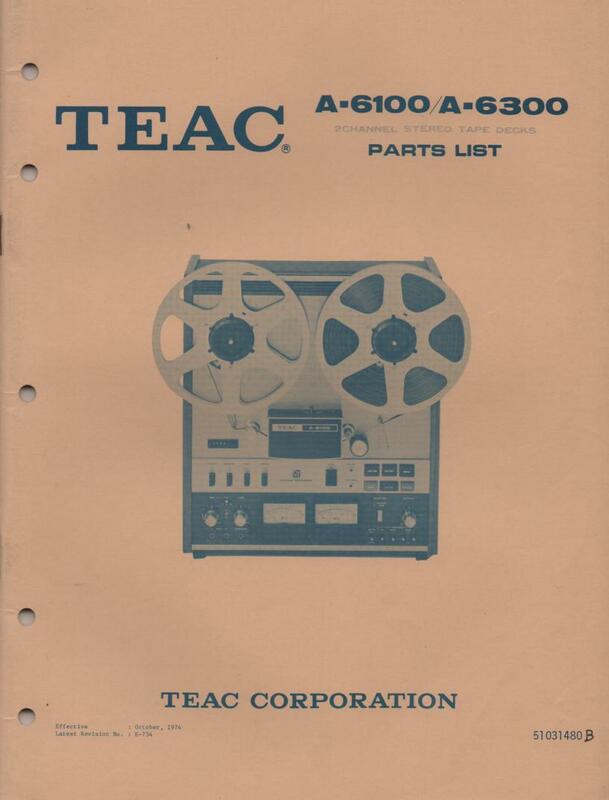 Manual TEACA-5300 A-5500 Reel to Reel Service Parts Manual PHOTO COPY! 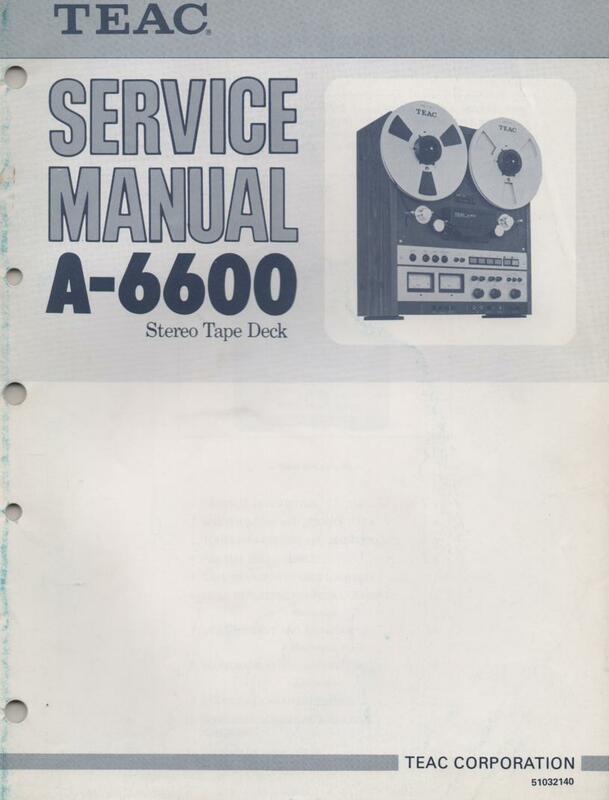 Manual TEACA-5500 A-5300 Reel to Reel Service Manual Set. PHOTO COPY! 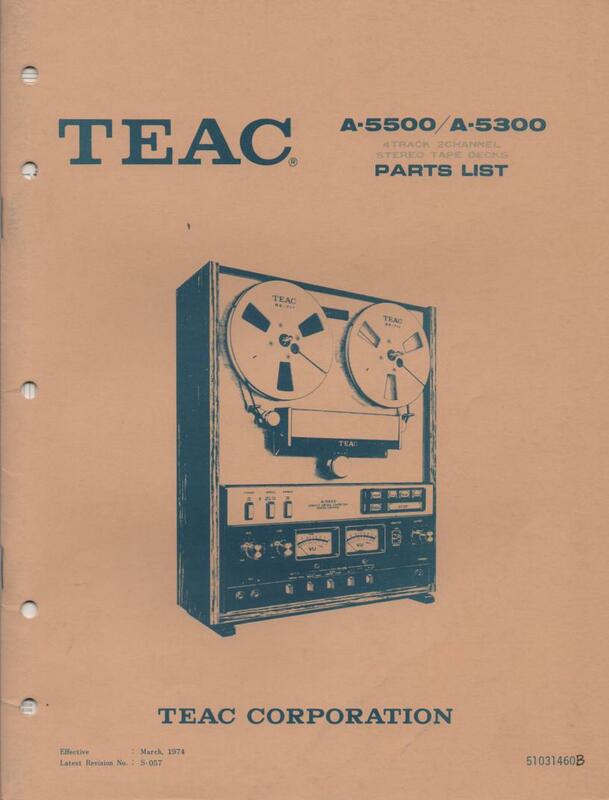 Manual TEACA-5500 A-5300 Reel to Reel Service Parts Manual Only. PHOTO COPY! 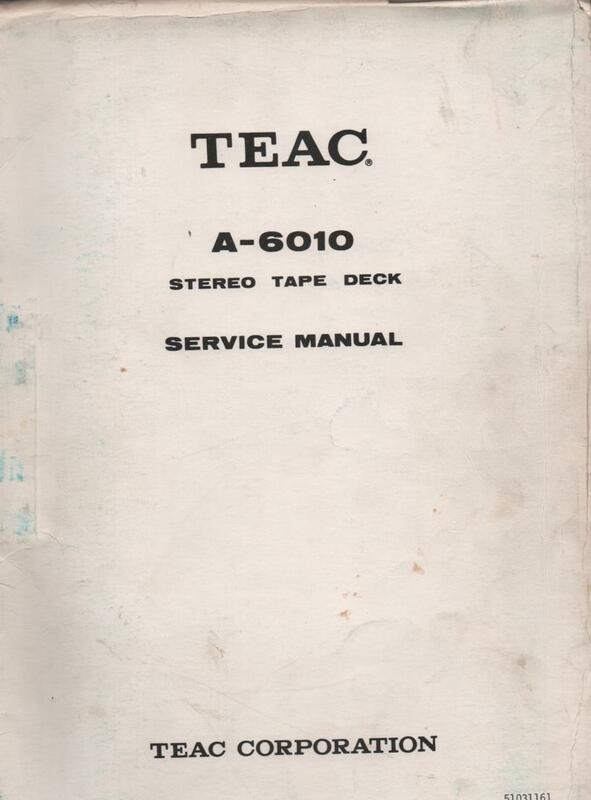 Manual TEACA-6010 Reel to Reel Service Manual PHOTO COPY! 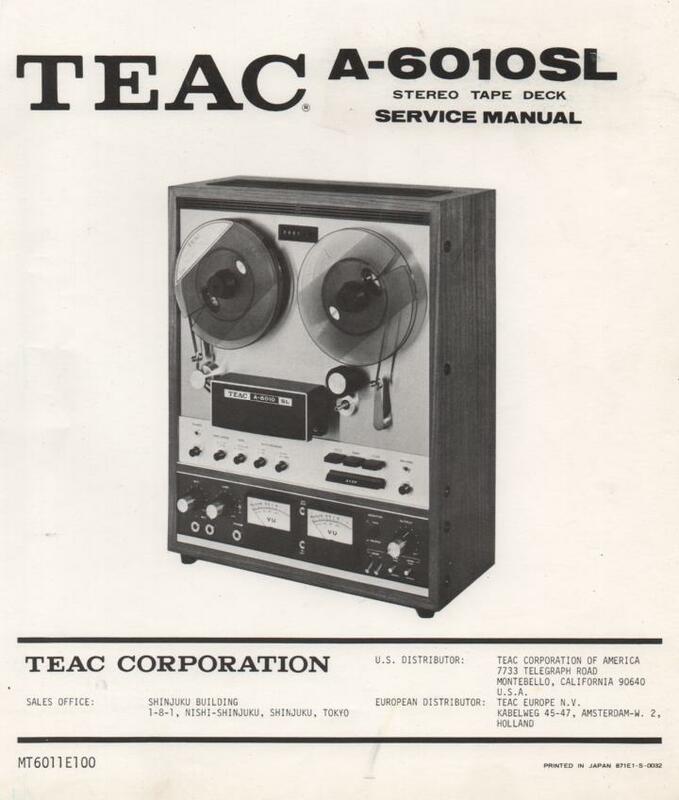 Manual TEACA-6010SL Reel to Reel Service Manual PHOTO COPY! 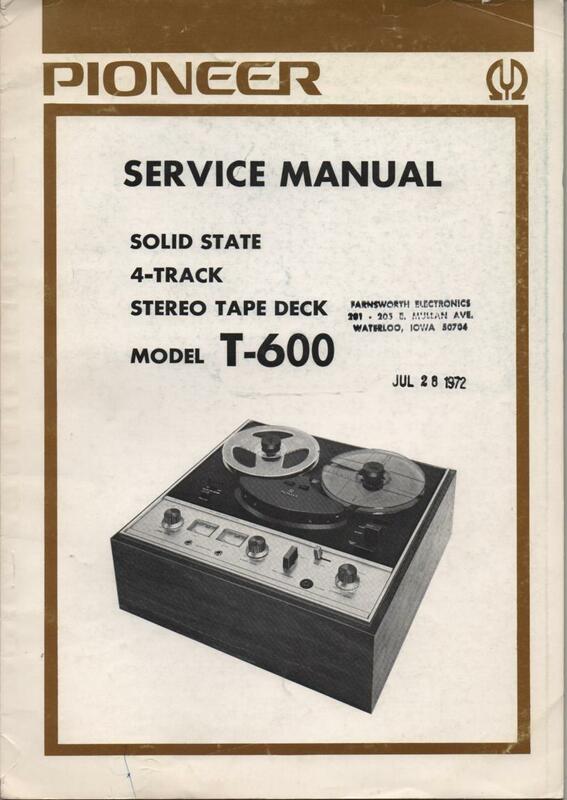 Manual TEACA-6010GSL Reel to Reel Service Manual PHOTO COPY! Manual TEACA-6100 A-6300 Reel to Reel Service Manual Set PHOTO COPY! Manual TEACA-6100 A-6300 Reel to Reel Service Parts Manual Only PHOTO COPY! Manual TEACA-6100mk II Reel to Reel Service Manual Set PHOTO COPY! 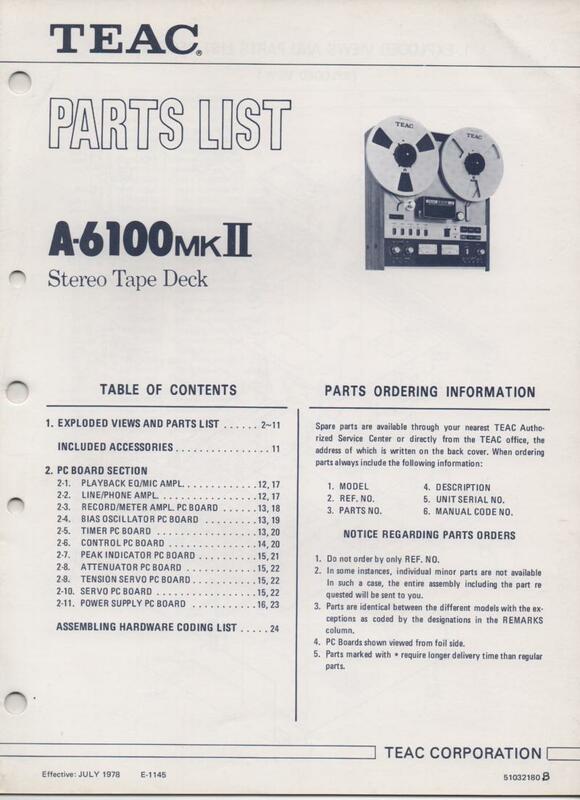 Manual TEACA-6100mk II Reel to Reel Service Parts Manual Only. PHOTO COPY! 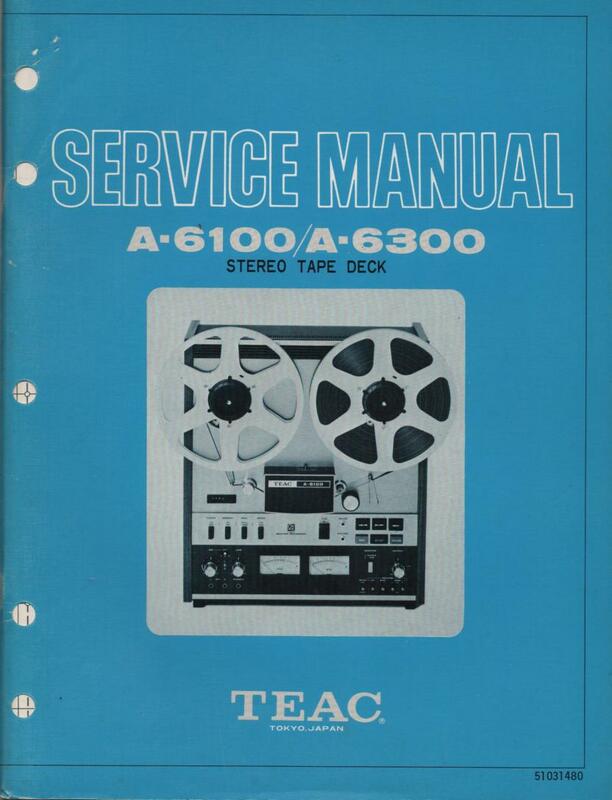 Manual TEACA-6300 A-6100 Reel to Reel Service Manual Set PHOTO COPY! 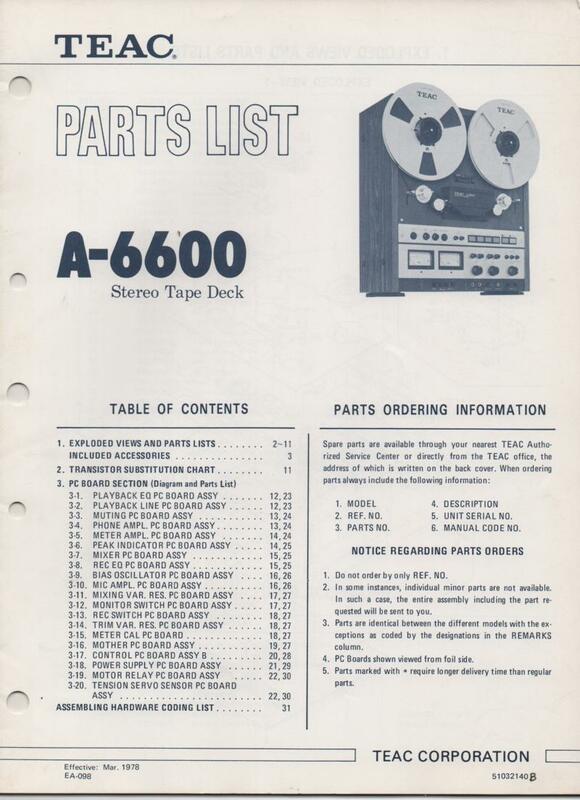 Manual TEACA-6300 A-6100 Reel to Reel Service Parts Manual PHOTO COPY! 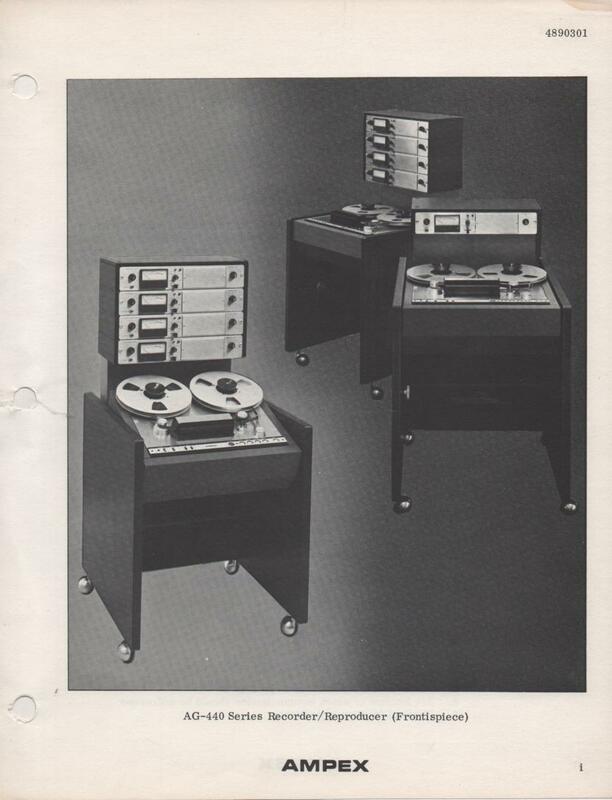 Manual TEACA-6600 Reel to Reel Service Manual Set PHOTO COPY! 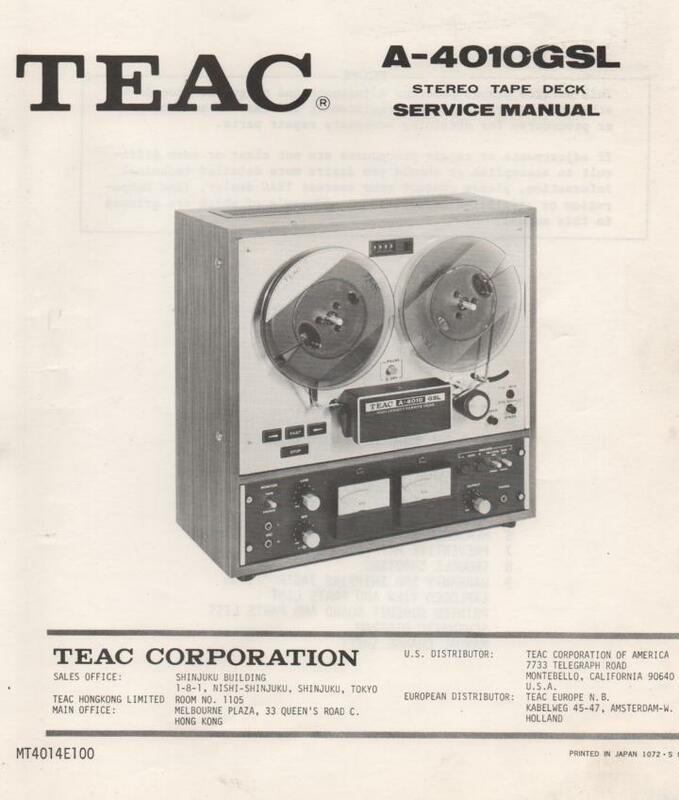 Manual TEACA-6600 Reel to Reel Service Parts Manual Only PHOTO COPY! 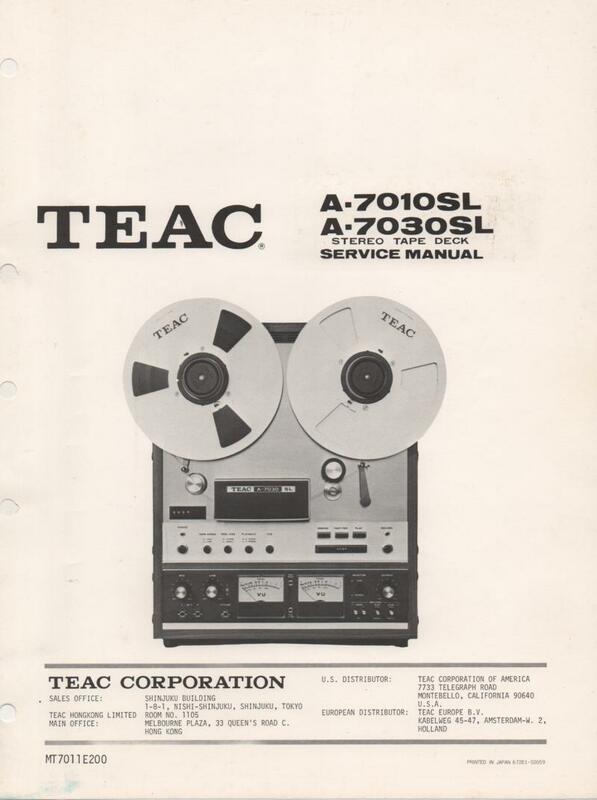 Manual TEACA-7010 Reel to Reel Service Manual PHOTO COPY! 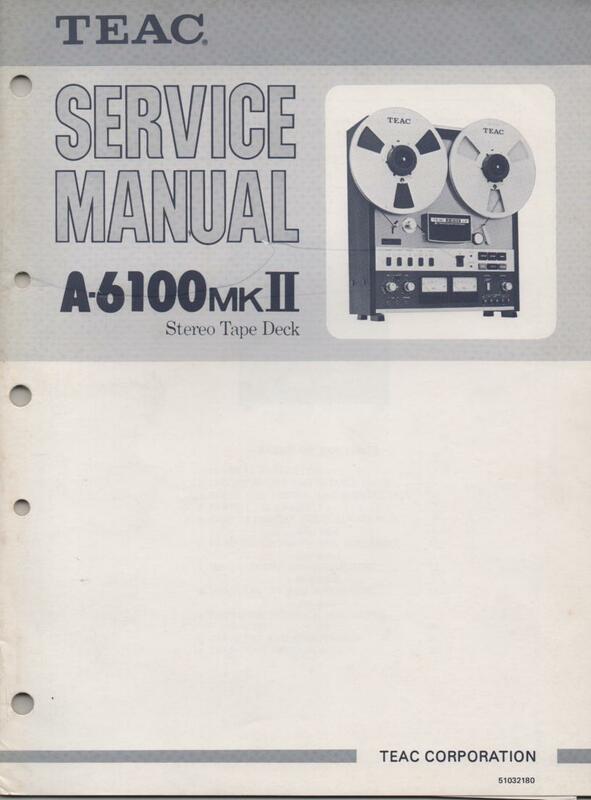 Manual TEACA-7010SL A-7030SL Reel to Reel Service Manual PHOTO COPY! 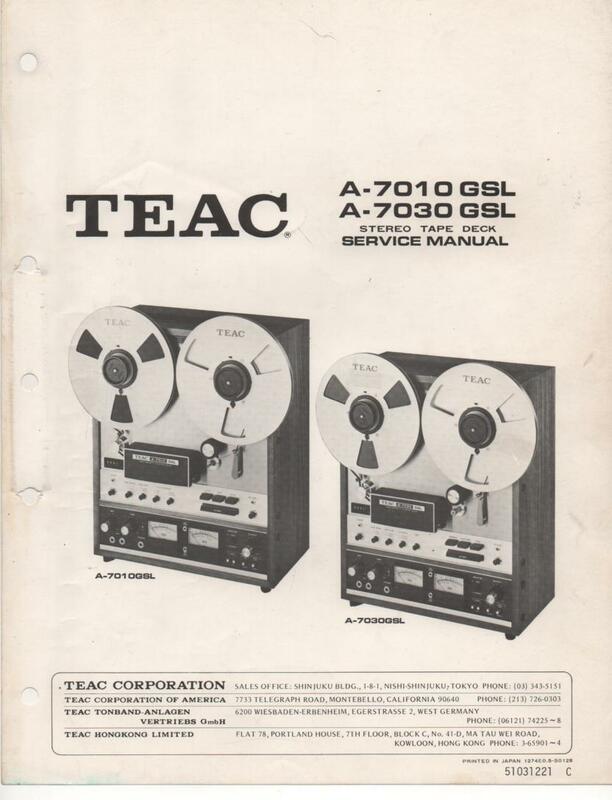 Manual TEACA-7010GSL A-7030GSL Reel to Reel Service Manual PHOTO COPY! 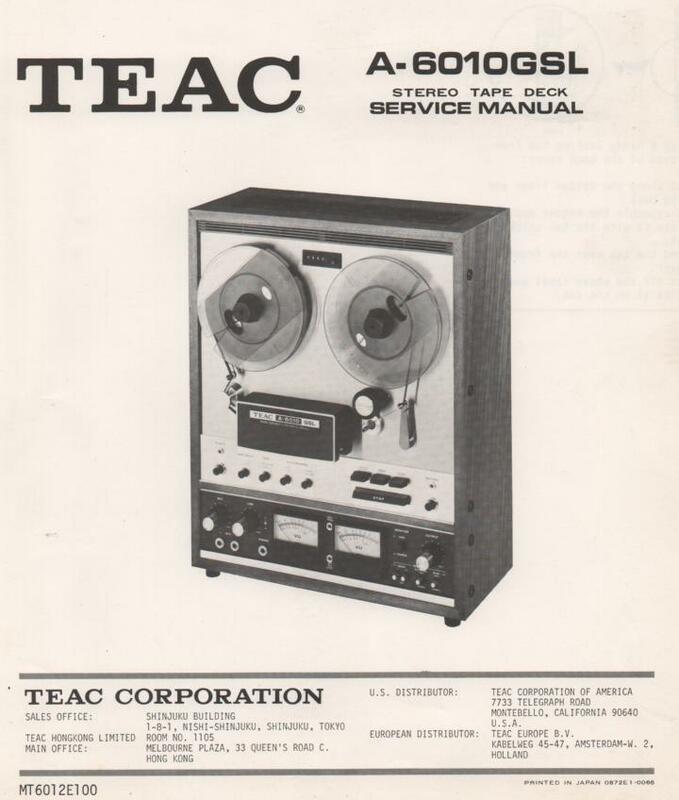 Manual TEACA-7030 Reel to Reel Service Manual PHOTO COPY! 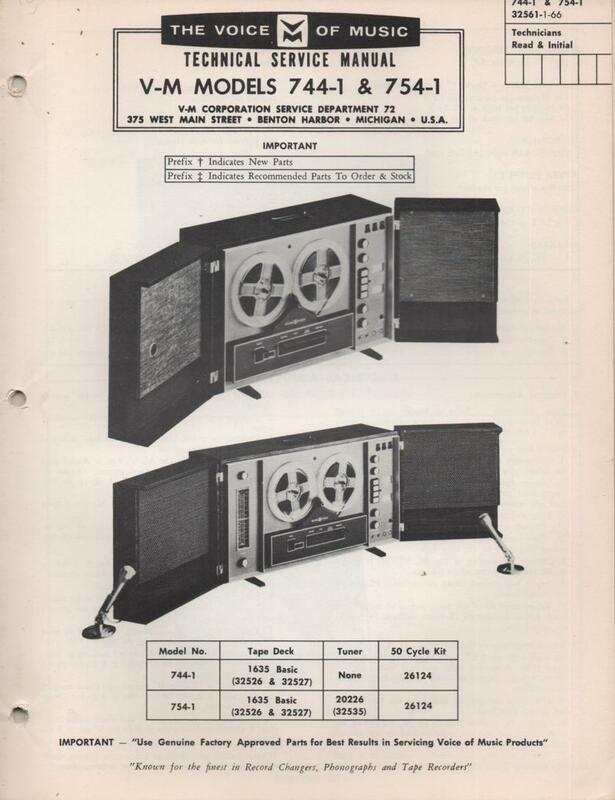 Manual TEACA-7030SL Reel to Reel Service Manual PHOTO COPY! 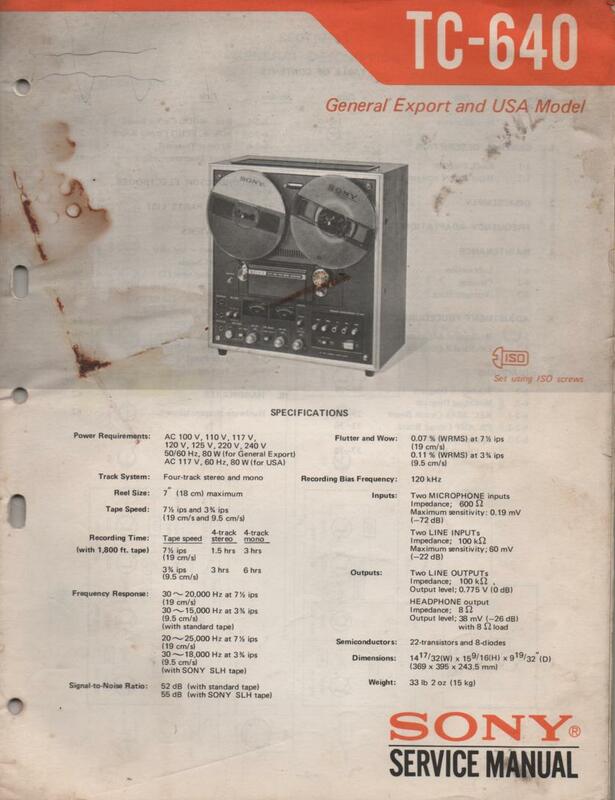 Manual TEACA-7030GSL Reel to Reel Service Manual PHOTO COPY! 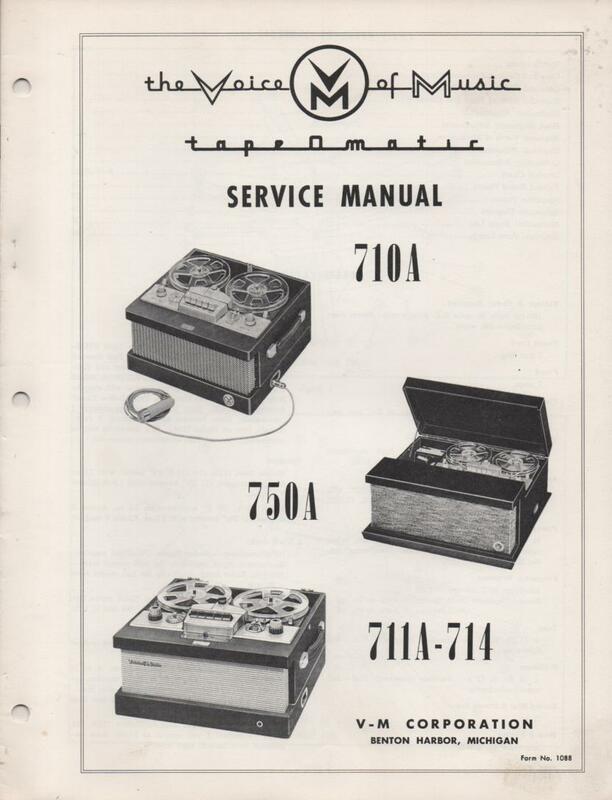 Manual TEACA-7300 A-7300 2T Reel to Reel Service Manual Set PHOTO COPY! 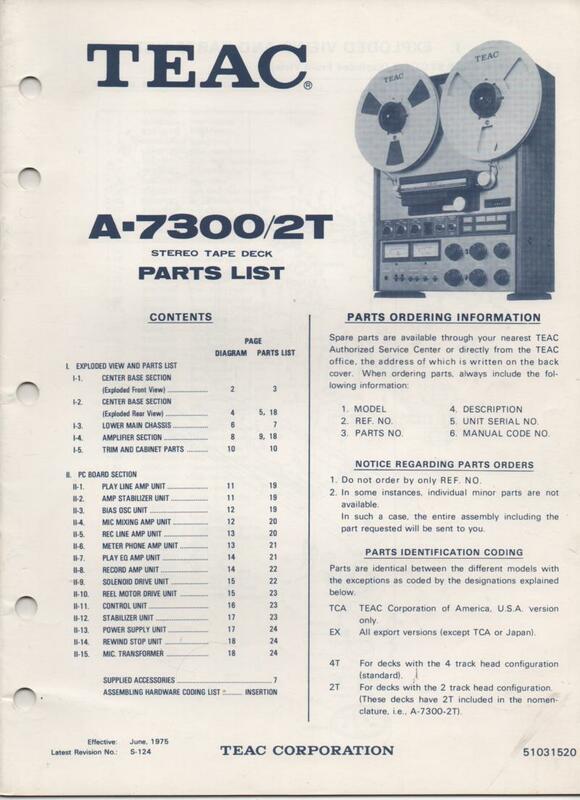 Manual TEACA-7300 A-7300 2T Reel to Reel Service Parts Manual Only PHOTO COPY! 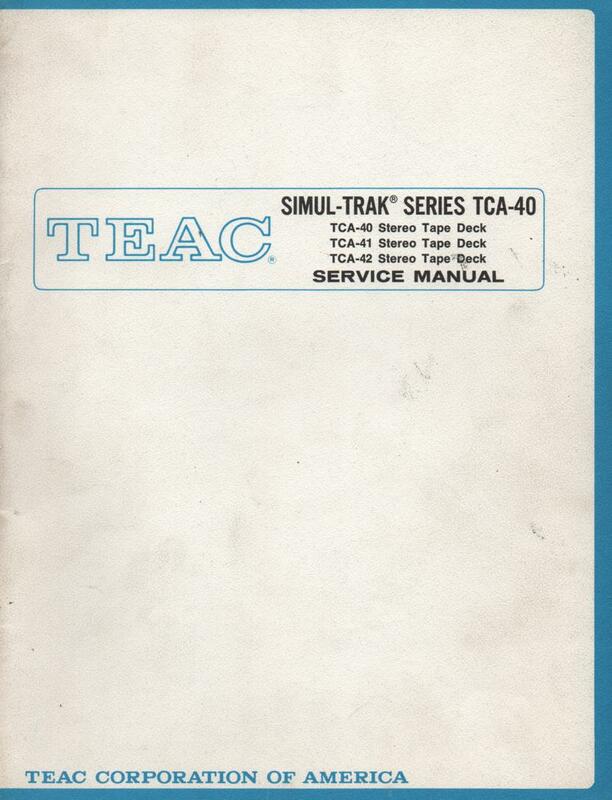 Manual TEACTCA-40 Reel to Reel Service Manual PHOTO COPY! 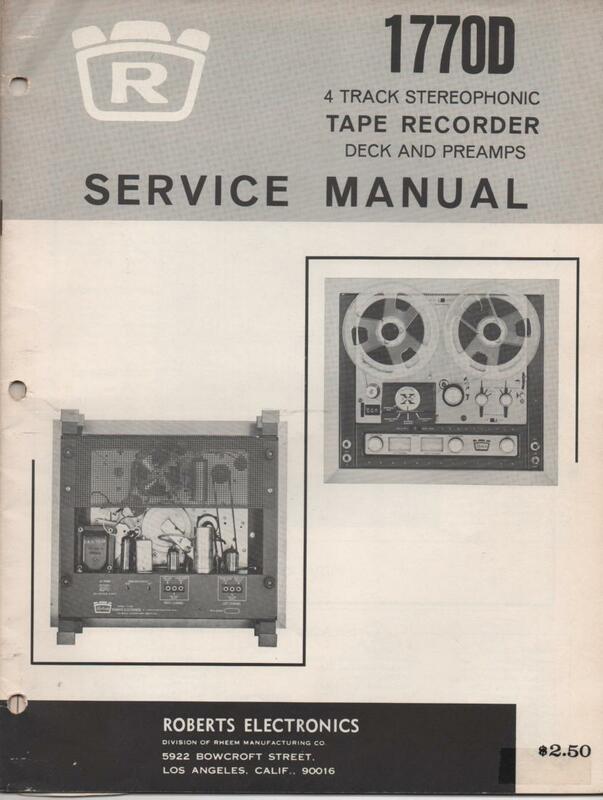 Manual TEACTCA-41 Reel to Reel Service Manual PHOTO COPY! 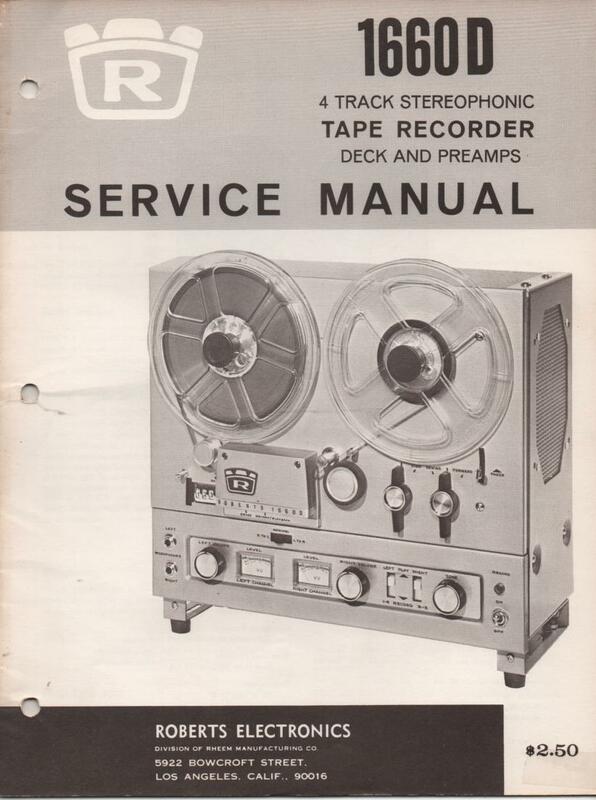 Manual TEACTCA-42 Reel to Reel Service Manual PHOTO COPY! 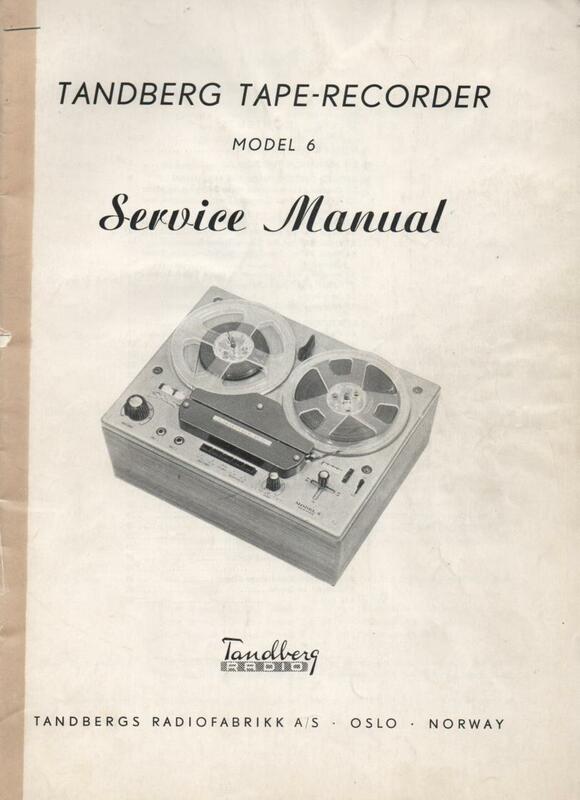 Manual TEACX-3 Reel to Reel Service Manual PHOTO COPY! 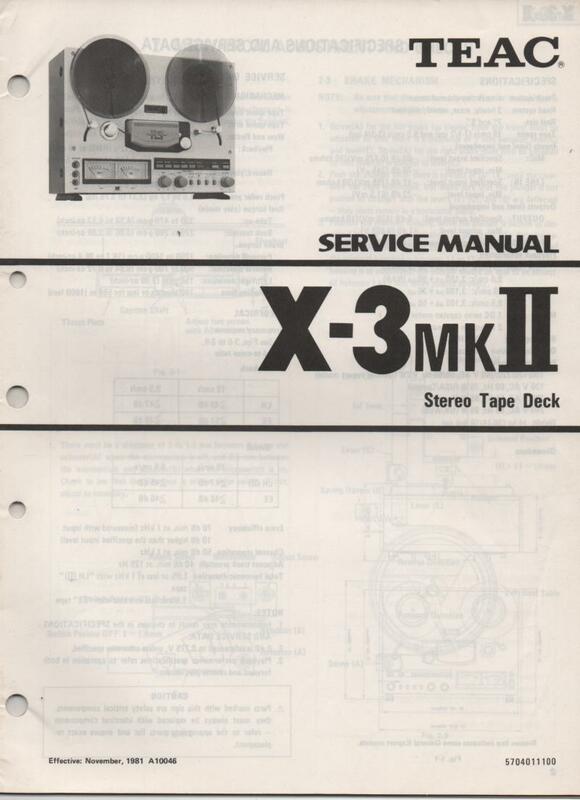 Manual TEACX-3MK II Reel to Reel Service Manual PHOTO COPY! 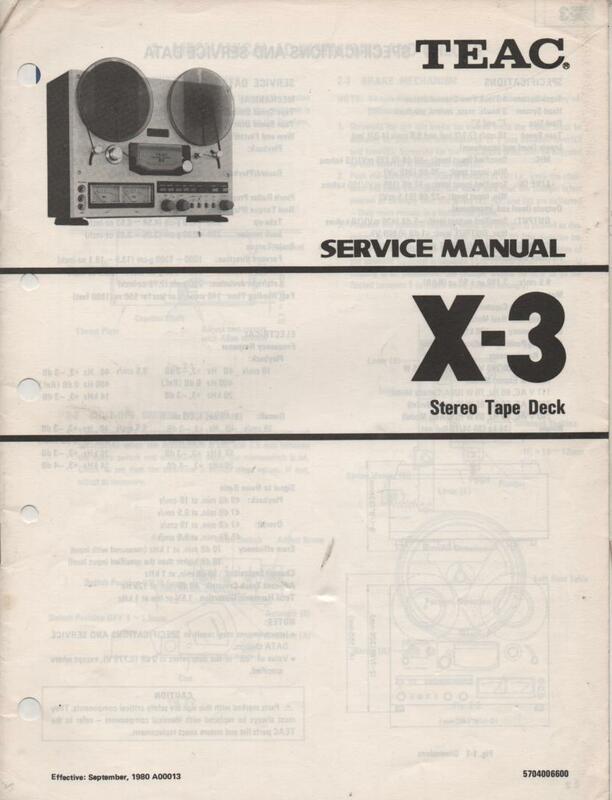 Manual TEACX-3R Reel to Reel Service Manual PHOTO COPY! 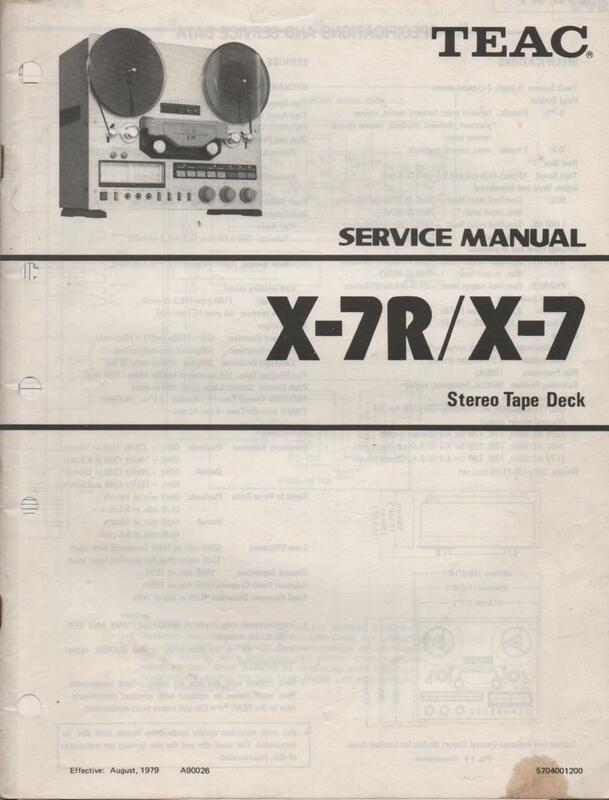 Manual TEACX-7 X-7R Reel to Reel Service Manual PHOTO COPY! Manual TEACX-7R X-10R Reel to Reel Circuit Description Service Manual PHOTO COPY! 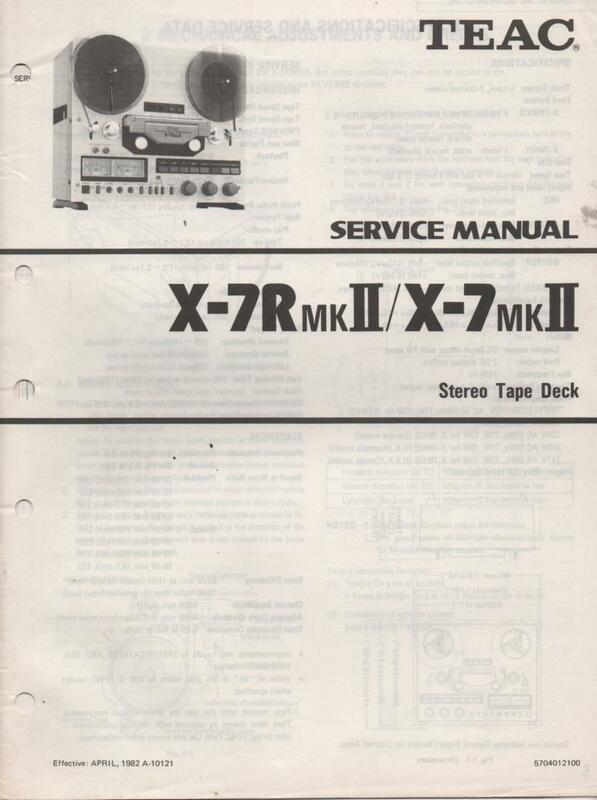 Manual TEACX-7MK II X-7RMK II Reel to Reel Service Manual PHOTO COPY! 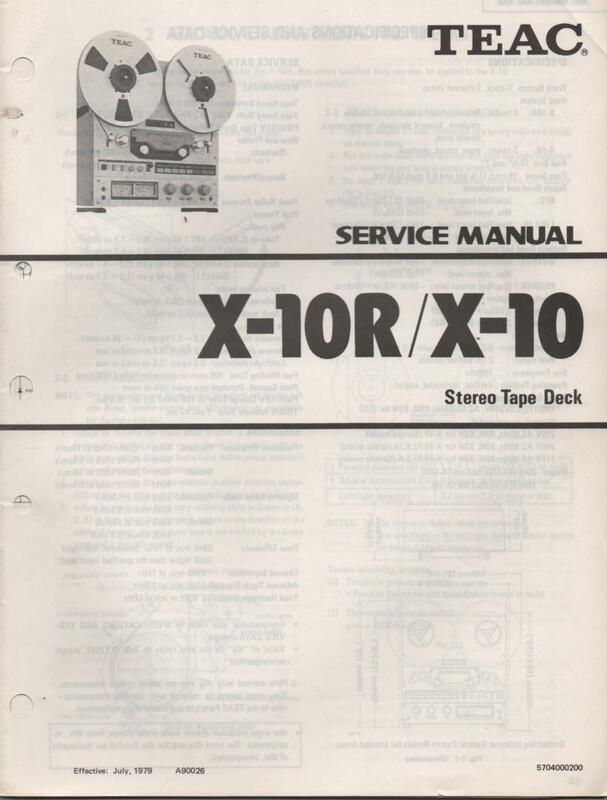 Manual TEACX-10 X-10R Reel to Reel Service Manual PHOTO COPY! 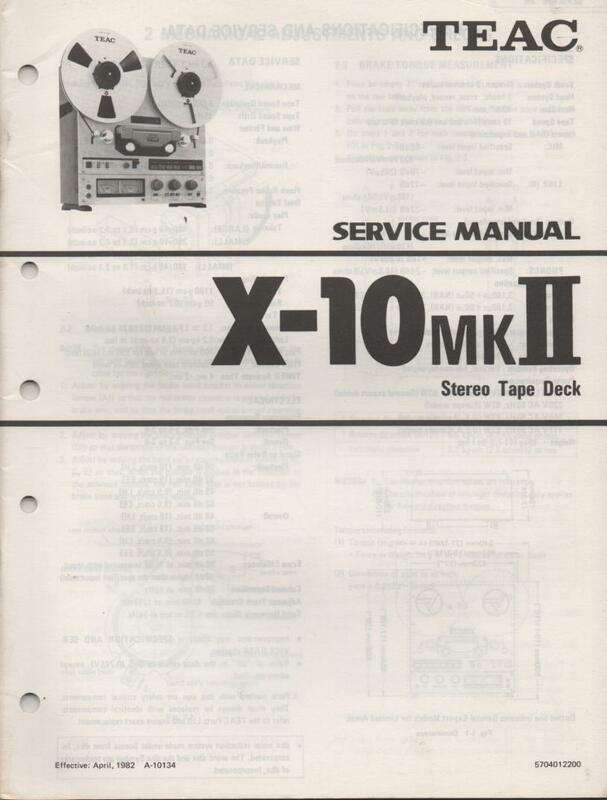 Manual TEACX-10MK II Reel to Reel Service Manual PHOTO COPY! 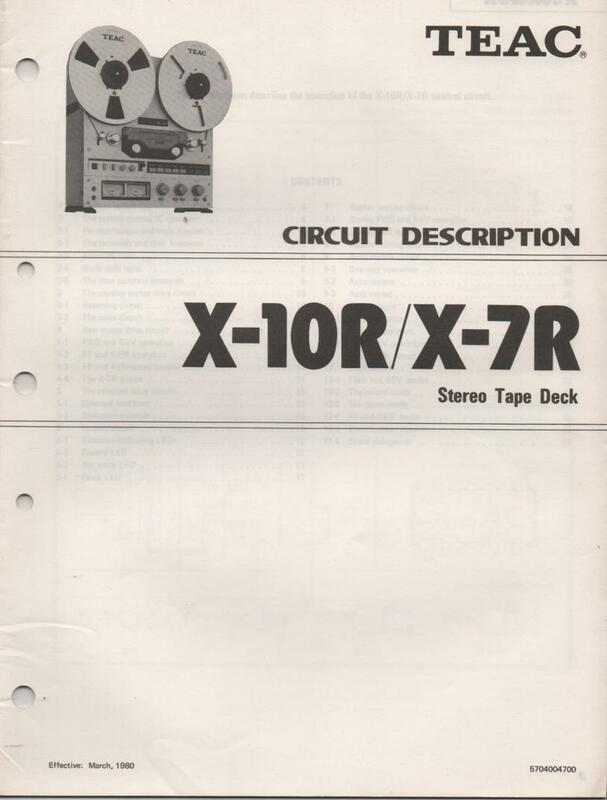 Manual TEACX-10R X-7R Reel to Reel Circuit Description Service Manual PHOTO COPY! 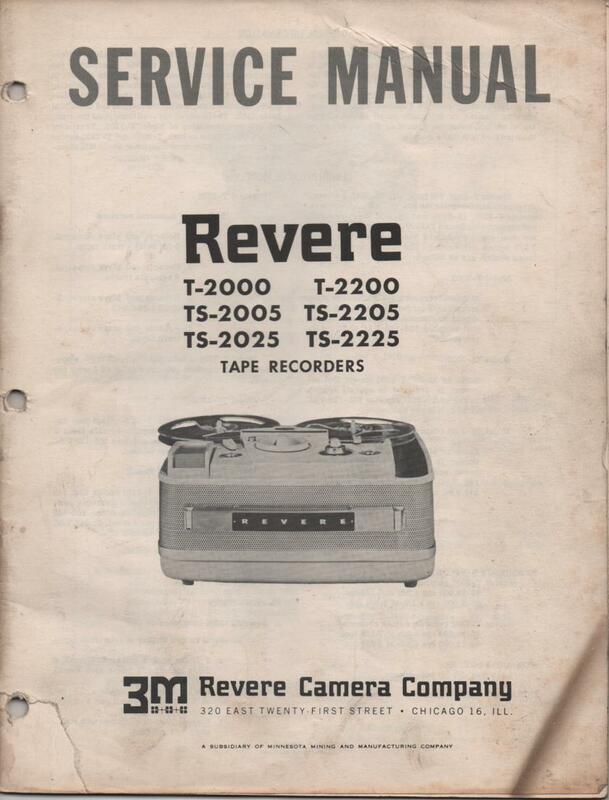 Manual TEACX-300 X-300R Reel to Reel Service Manual PHOTO COPY! 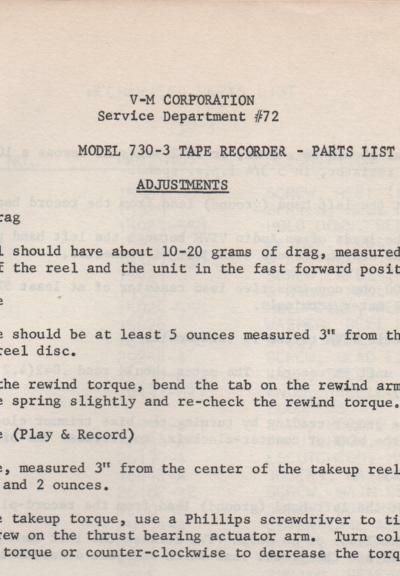 Manual TEACX-700R Reel to Reel Service Manual PHOTO COPY! 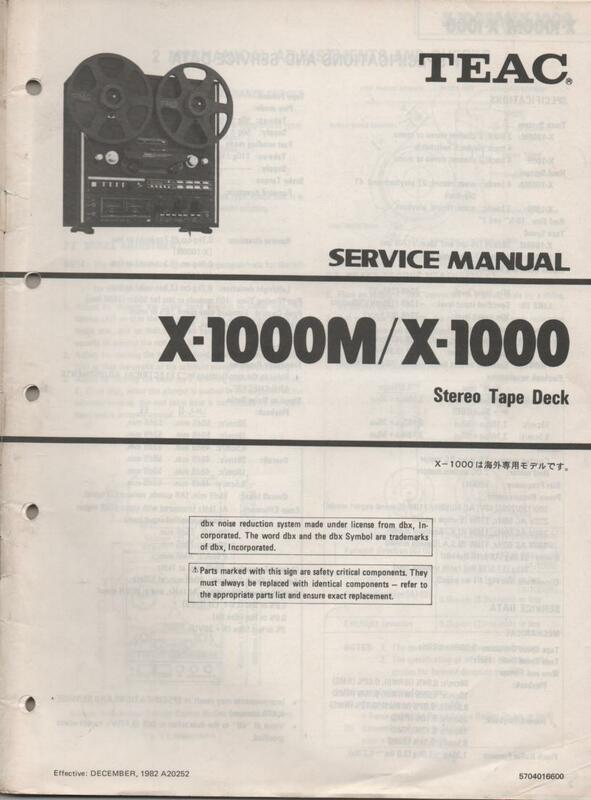 Manual TEACX-1000 X-1000M Reel to Reel Service Manual PHOTO COPY! 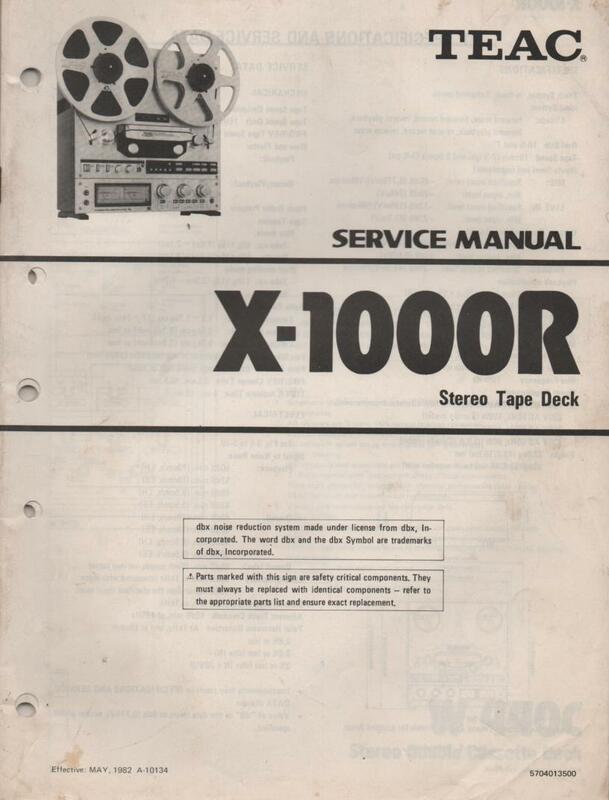 Manual TEACX-1000R Reel to Reel Service Manual PHOTO COPY! 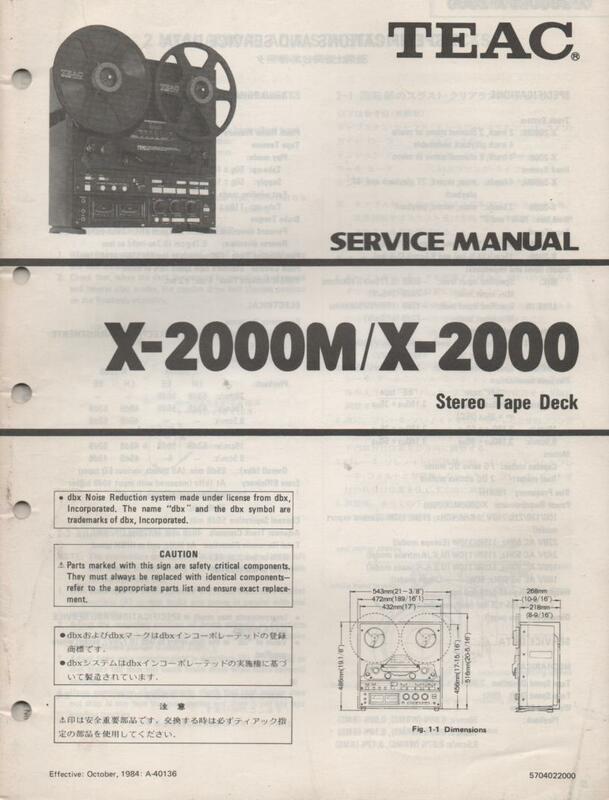 Manual TEACX-2000 X-2000M Reel to Reel Service Manual PHOTO COPY! 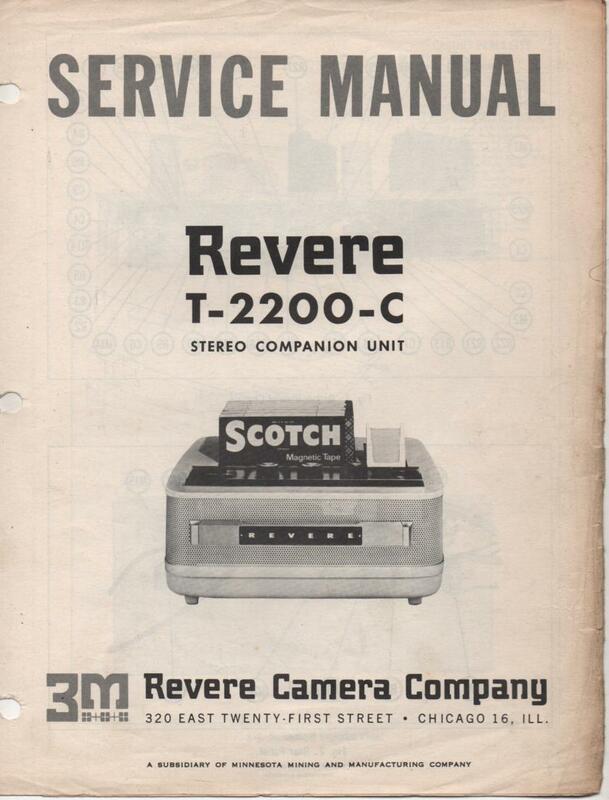 Manual TEACX-2000R Reel to Reel Service Manual PHOTO COPY! 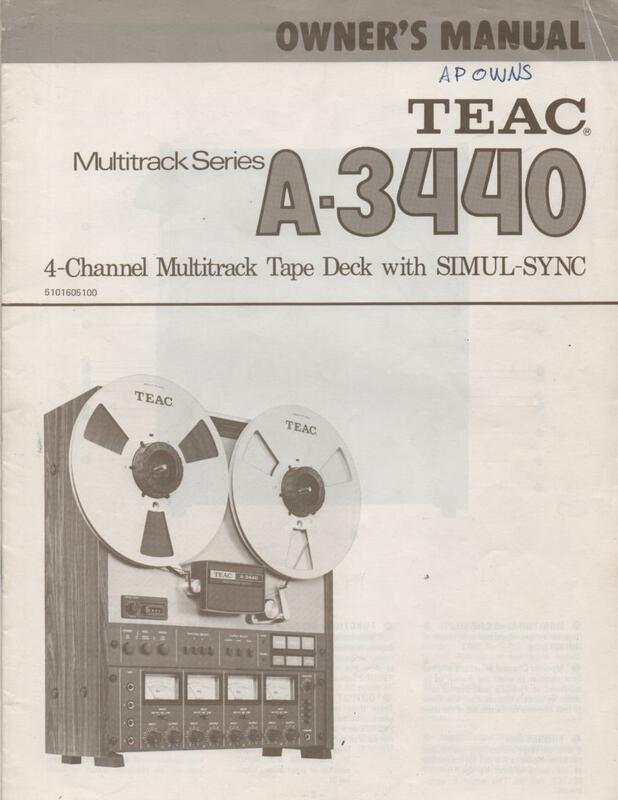 Manual TEACA-3440 Reel to Reel Owners Manual PHOTO COPY! Manual TECHNICSRS-1506US Reel to Reel Owners Operating Insruction Maual PHOTO COPY! 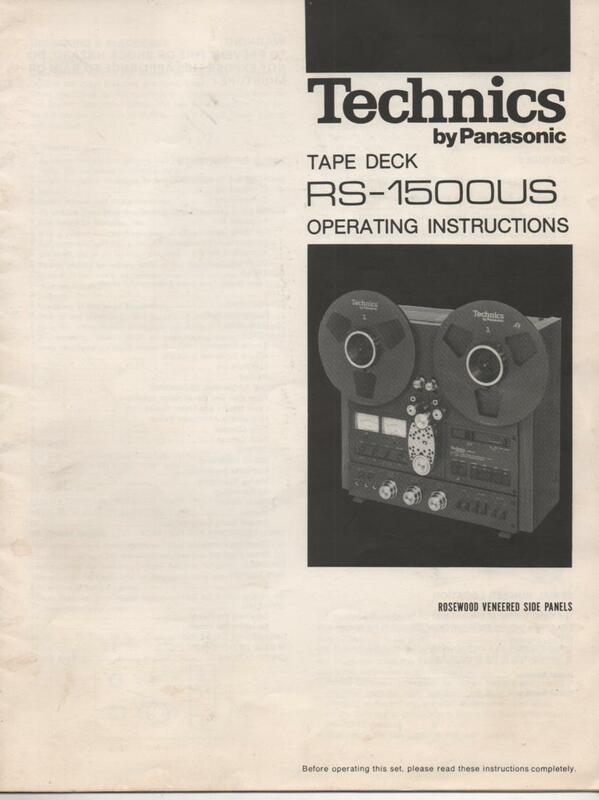 Manual Technics RS-1500US Reel to Reel Owners Manual PHOTO COPY! 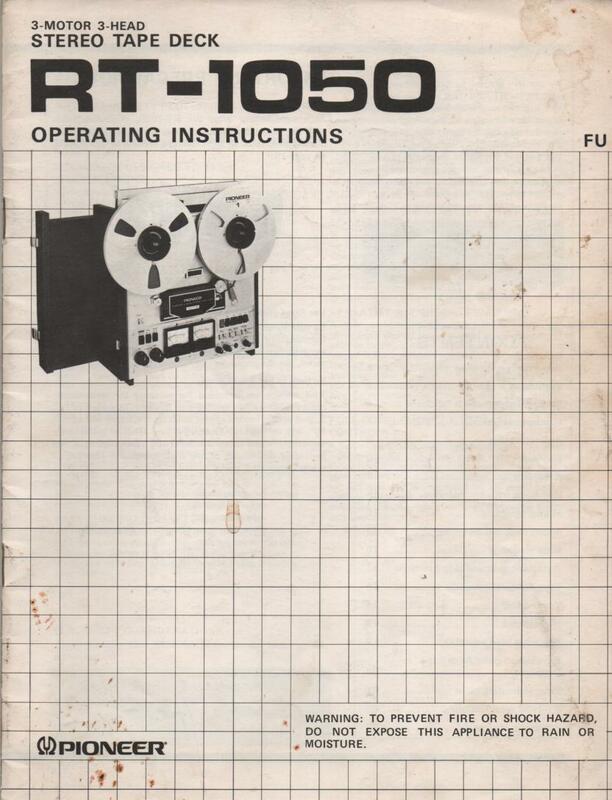 Manual TECHNICSRS-1030US Reel to Reel Service Manual. Comes with 2 manuals.. service manual and parts manual.. PHOTO COPY! 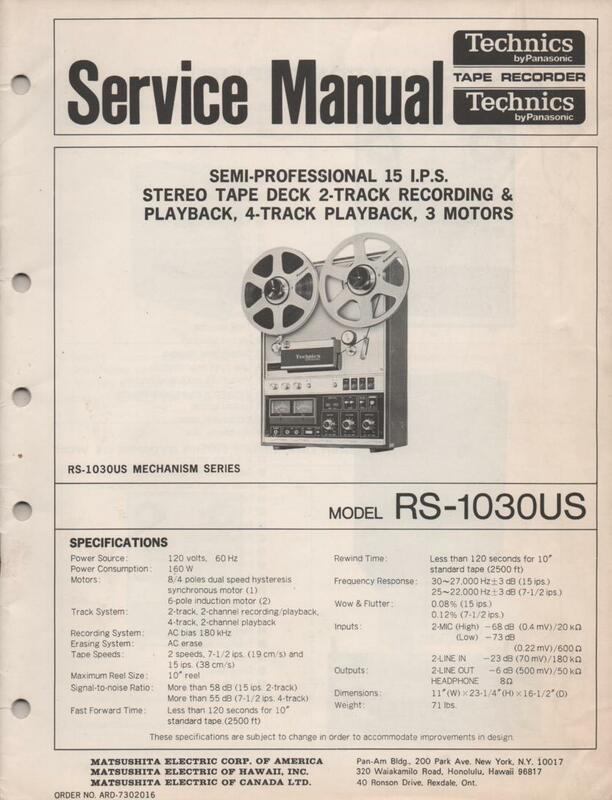 Manual TECHNICSRS-1030US Reel to Reel Parts Service Manual. PHOTO COPY! 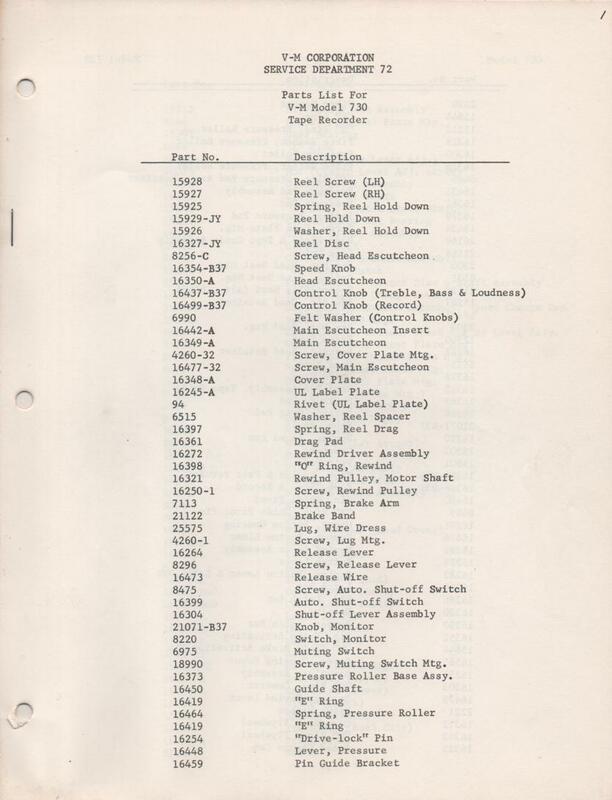 Manual Viking 35 36 37 Head Specification Data Sheet PHOTO COPY! Manual Viking RP61 Record Playback Amplifier Operating Instruction Manual PHOTO COPY! 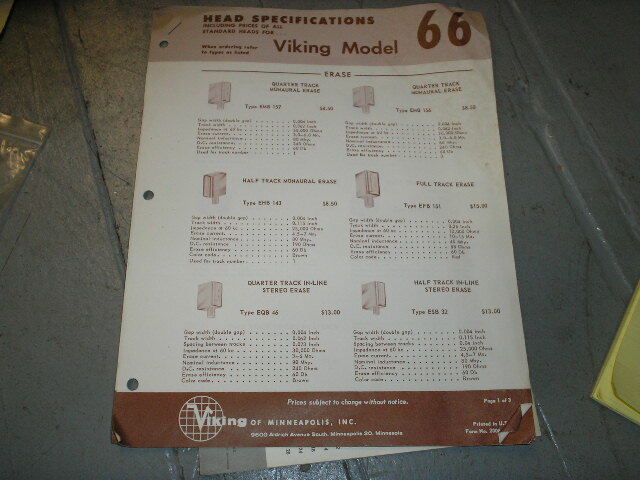 Manual Viking 66 Head Specification Data Sheet PHOTO COPY! Manual Viking FF75 Reel to Reel Operating Service Instruction Manual PHOTO COPY! 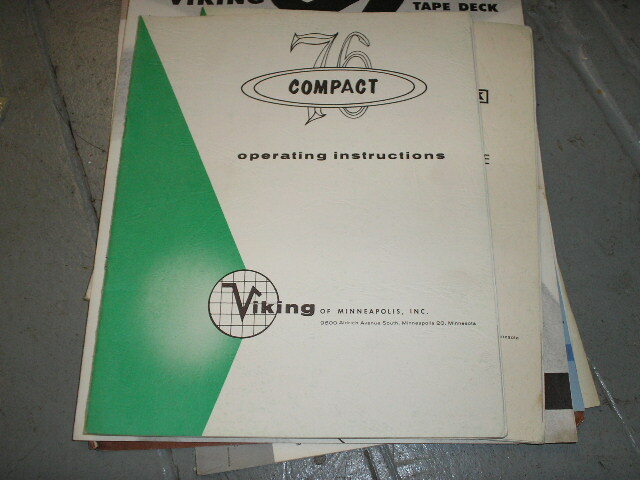 Manual Viking 76 Compact Operating Instruction Manual.. with adjustment information, schematic and parts list.. PHOTO COPY! 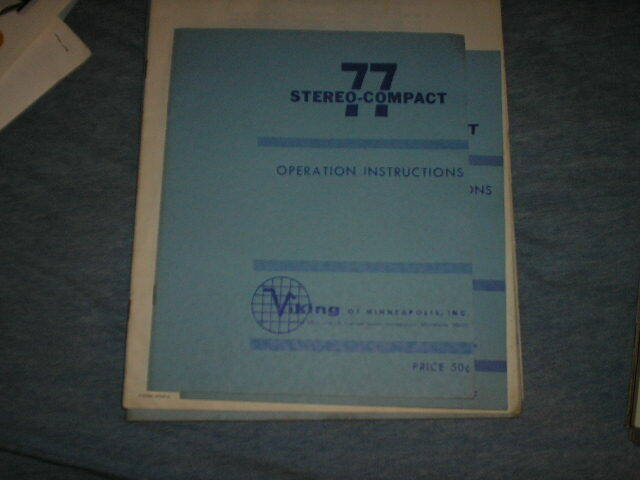 Manual Viking77 Stereo Compact Operating Instruction Manual.. with adjustment information, schematic and troubleshooting tips PHOTO COPY! 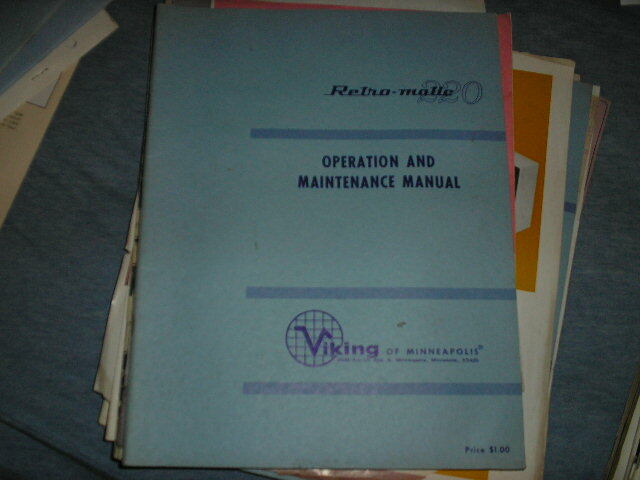 Manual Viking78 Tape Transport Operating Instruction and Maintenance Manual PHOTO COPY! Manual Viking85 Reel to Reel Operating Service Instruction Manual PHOTO COPY! Manual Viking85 Tape Deck Technical Information Sheet PHOTO COPY! 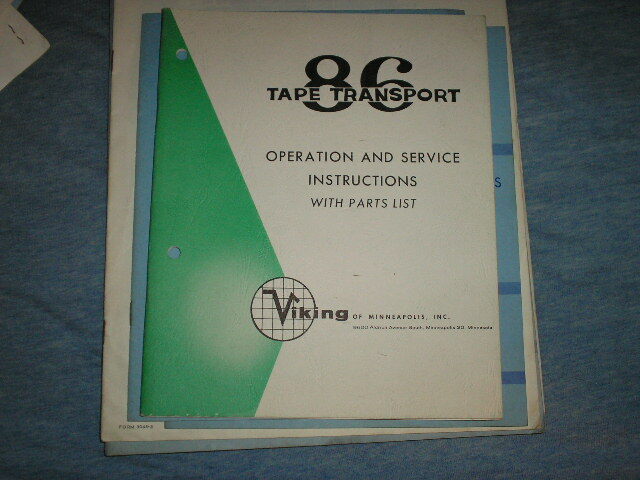 Manual Viking85 Tape Transport Operation and Service Instruction Manual PHOTO COPY! 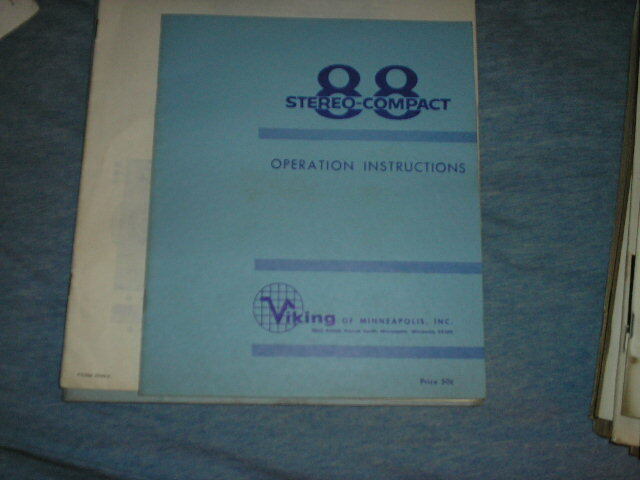 Manual Viking86 Tape Transport Operation and Service Instruction Manual PHOTO COPY! Manual Viking86 Tape Transport Head Specification Sheets PHOTO COPY! 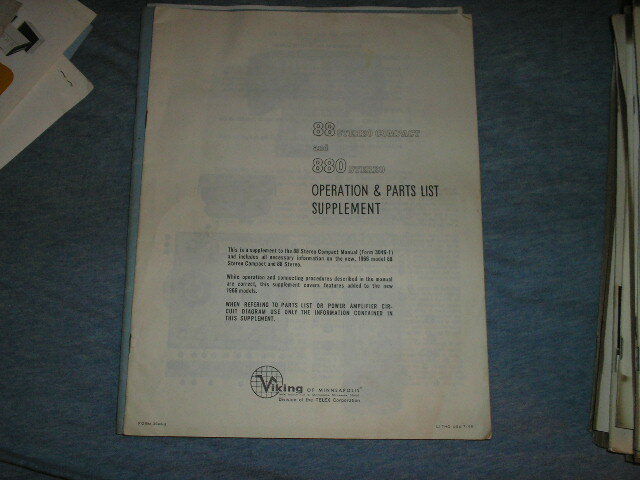 Manual Viking87 Tape Transport Parts List Supplement PHOTO COPY! 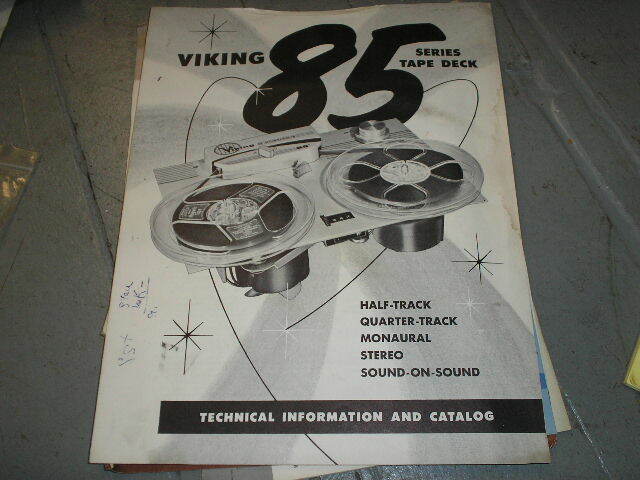 Manual Viking88 Tape Transport Operating Instruction Manual. with PA-9A Schematic and 88 Schematic PHOTO COPY! 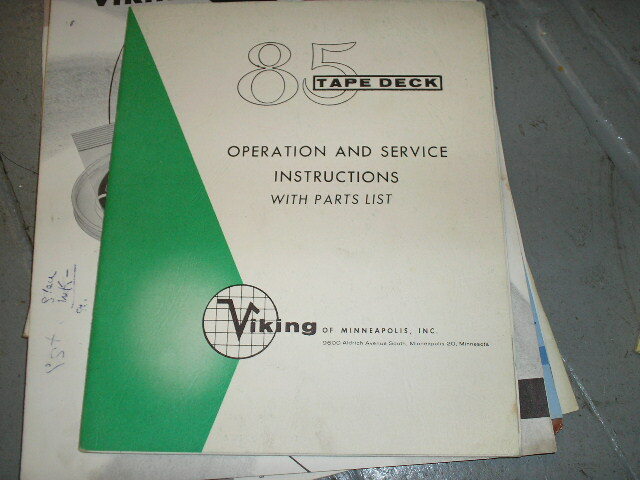 Manual Viking88 Tape Transport Operating Instruction Manual and Parts List Supplement. With PA-22 Schematic PHOTO COPY! 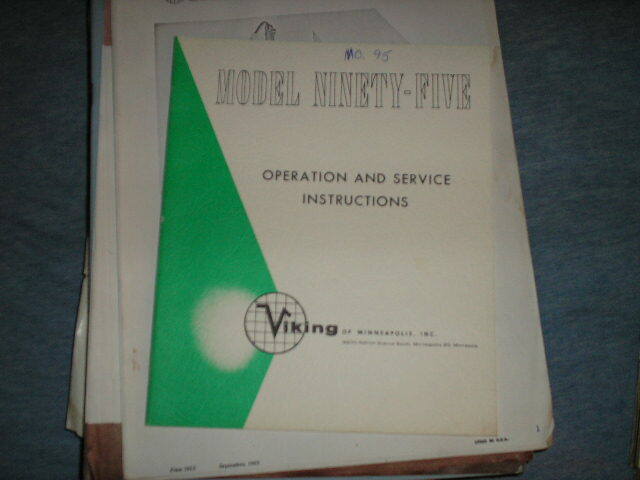 Manual Viking88 880 Tape Transport Operating and Service Instruction Manual PHOTO COPY! 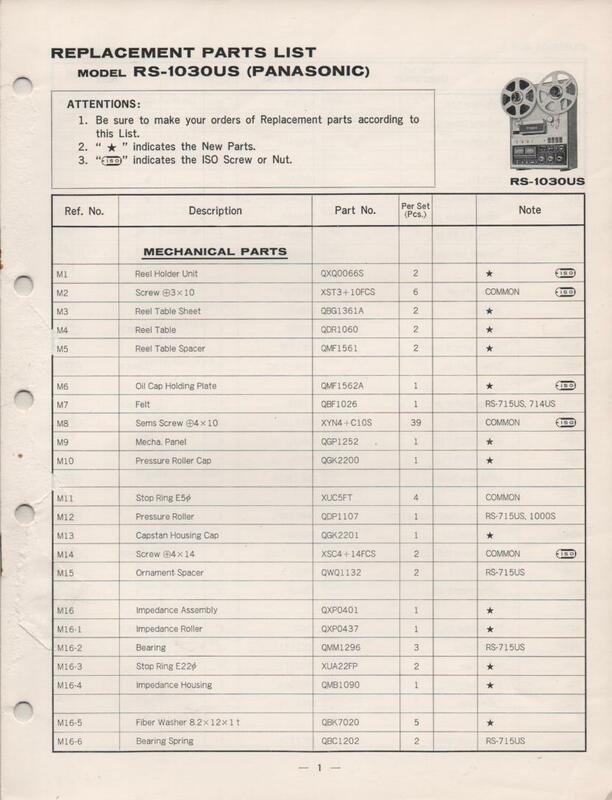 Manual Viking95 Head Specification Data Sheet PHOTO COPY! 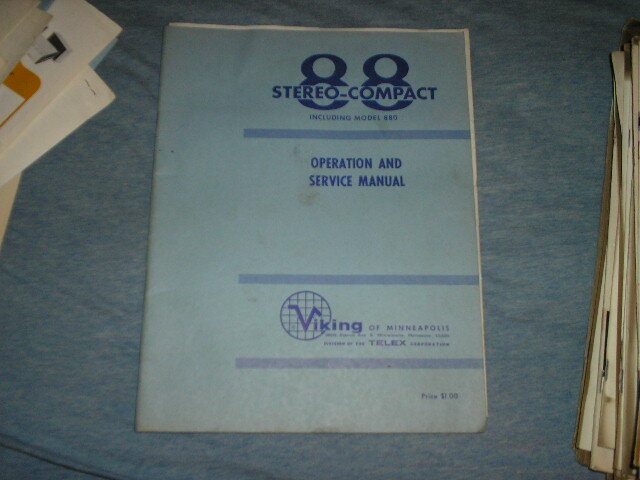 Manual Viking95 Tape Transport Operation and Service Instruction Manual PHOTO COPY! 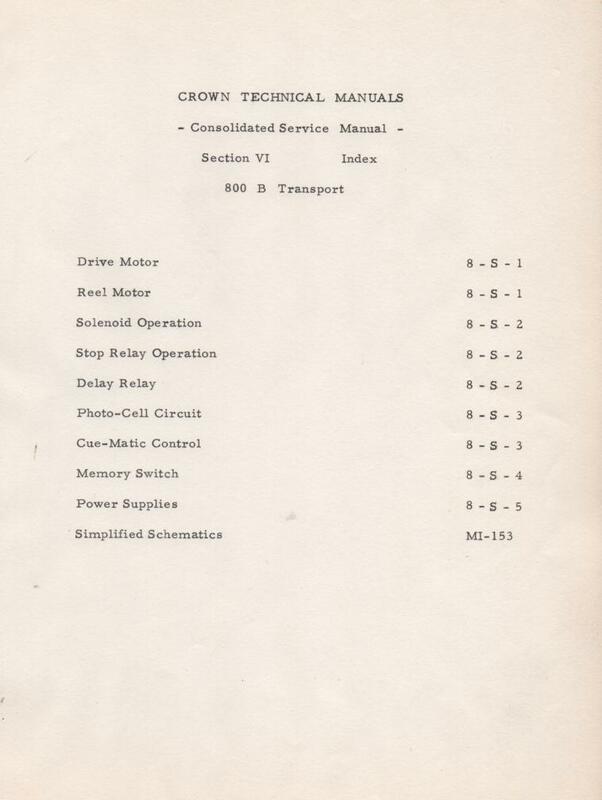 Manual Viking95 Series Tape Transport Technical Data Sheet PHOTO COPY! 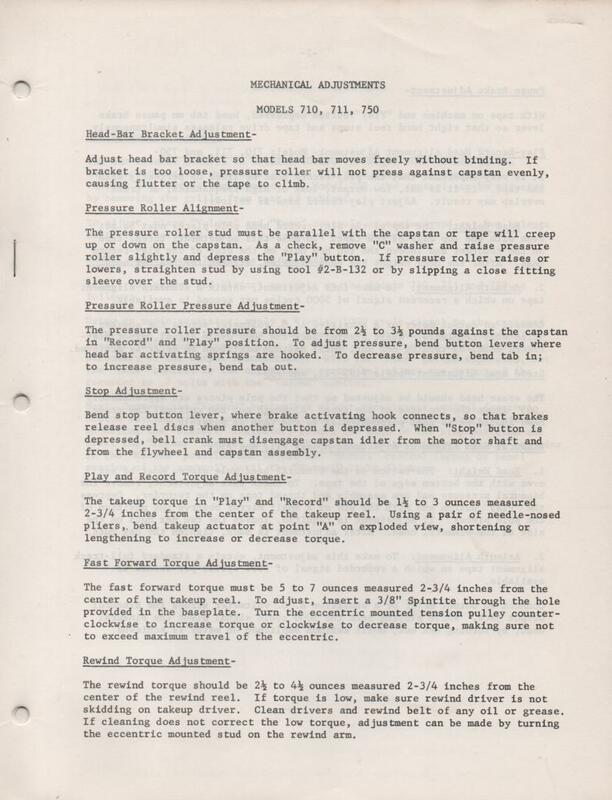 Manual Viking96 Head Specification Data Sheet PHOTO COPY! Manual VikingRetro-Matic 220 Operating Instruction Service Manual PHOTO COPY! 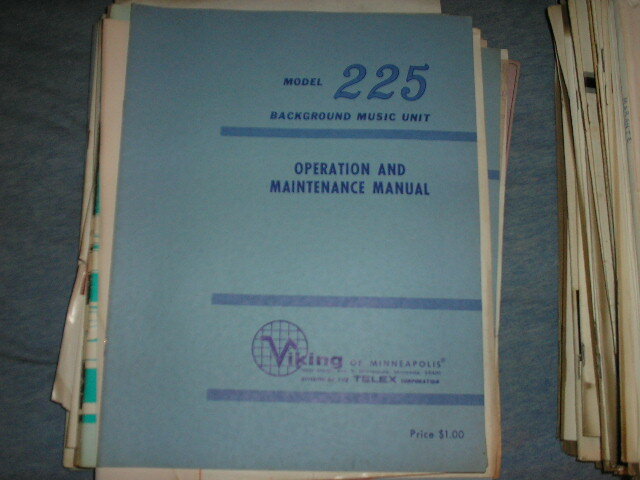 Manual Viking225 Background Music Unit Operating Instruction Service Manual PHOTO COPY! 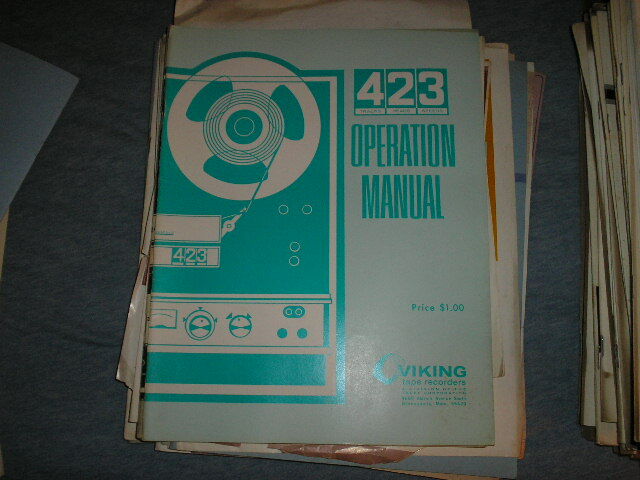 Manual Viking423 Operating Instruction Manual with Schematic PHOTO COPY! 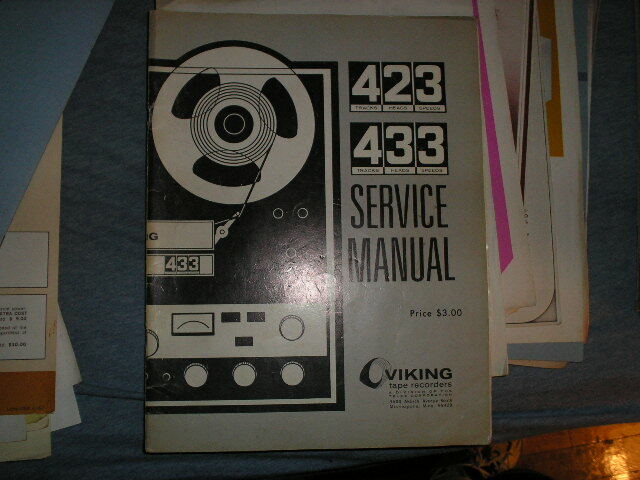 Manual Viking423 433 Service Manual with Schematic PHOTO COPY! 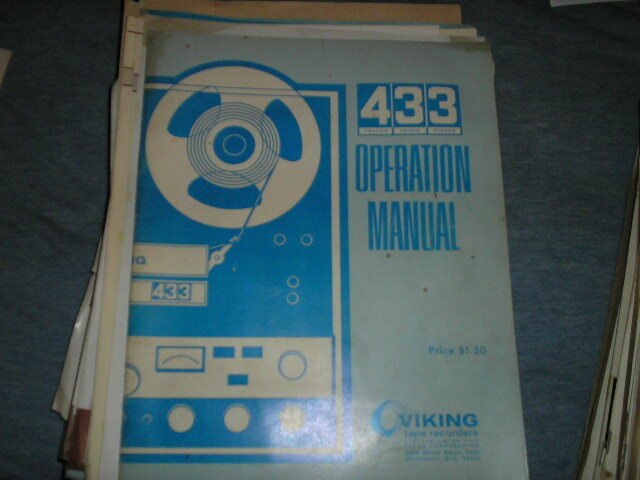 Manual Viking433 Operating Instruction Manual with Schematic PHOTO COPY! Manual Viking 807 Reel to Reel Operating Instruction Manual PHOTO COPY! 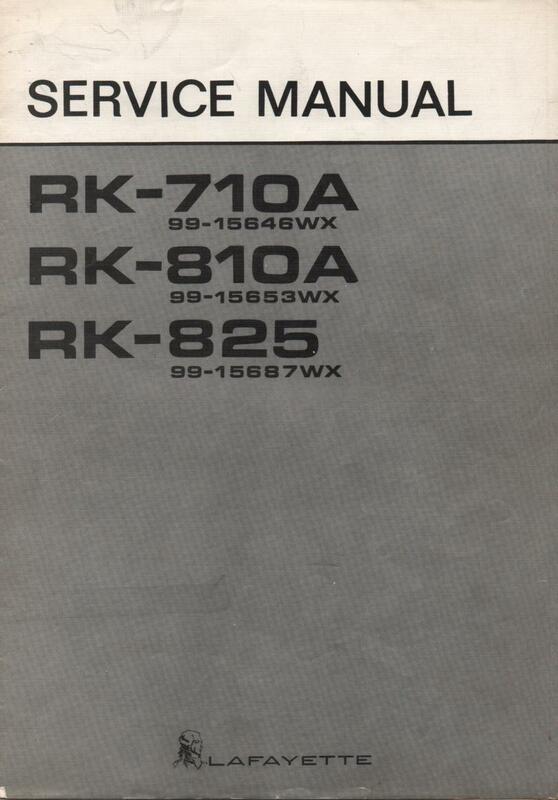 Manual Viking 88 880 Tape Transport Operating Instruction Manual and Parts List Supplement. With PA-22 Schematic PHOTO COPY! 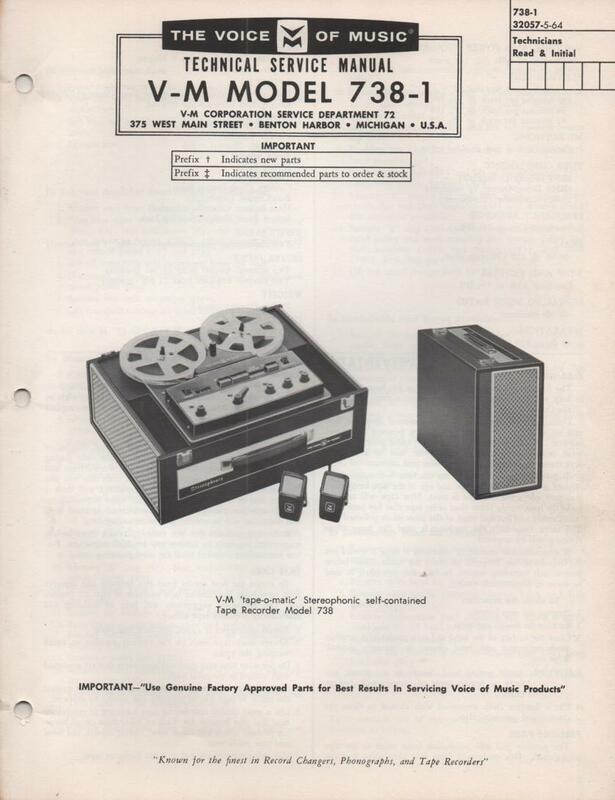 Manual VOICE OF MUSIC726 Reel to Reel Service Manual PHOTO COPY! 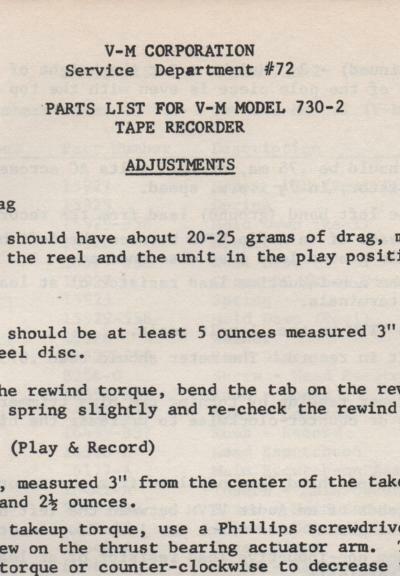 Manual VOICE OF MUSIC732-1 Reel to Reel Service Manual . comes with 740-1 manual... PHOTO COPY! 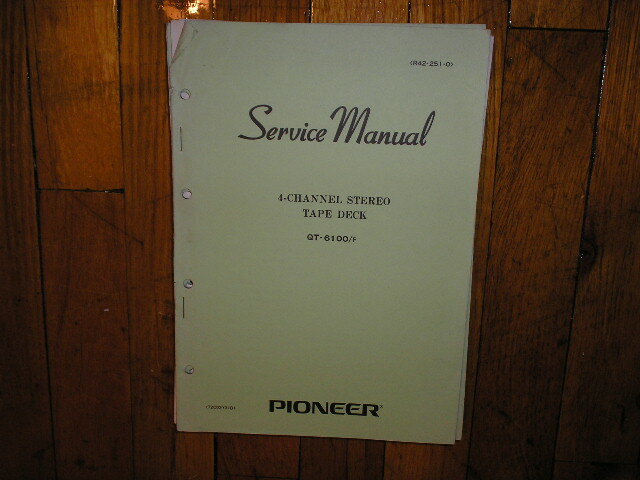 Manual VOICE OF MUSIC733-1 Reel to Reel Service Manual. comes with 1635 manual... PHOTO COPY! Manual VOICE OF MUSIC738-1 Reel to Reel Service Manual PHOTO COPY! 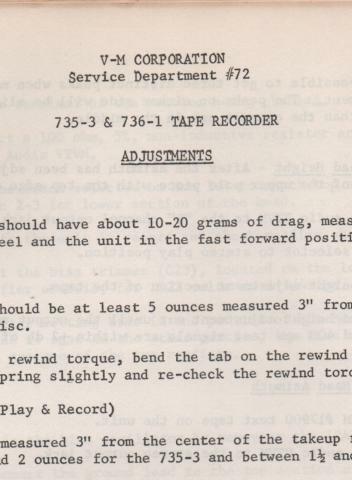 Manual VOICE OF MUSIC739-1 Reel to Reel Service Manual. comes with 1635 basic transport manual. PHOTO COPY! 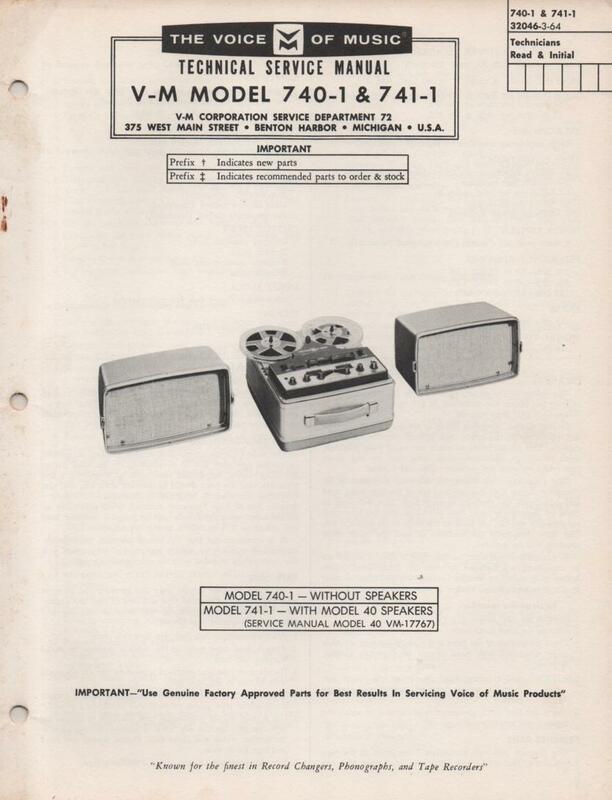 Manual VOICE OF MUSIC744-1 Reel to Reel Service Manual. Comes with 1635 tape transport manual. PHOTO COPY! 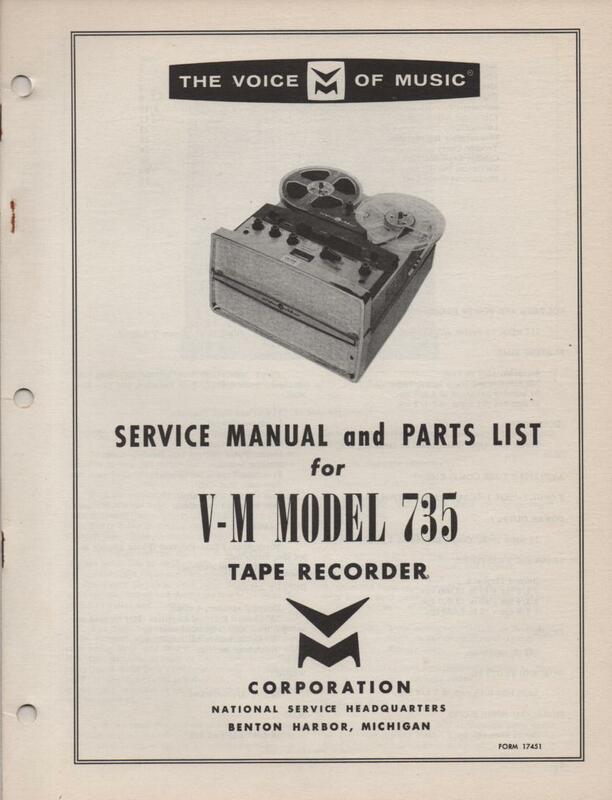 Manual VOICE OF MUSIC754-1 Reel to Reel Service Manual. 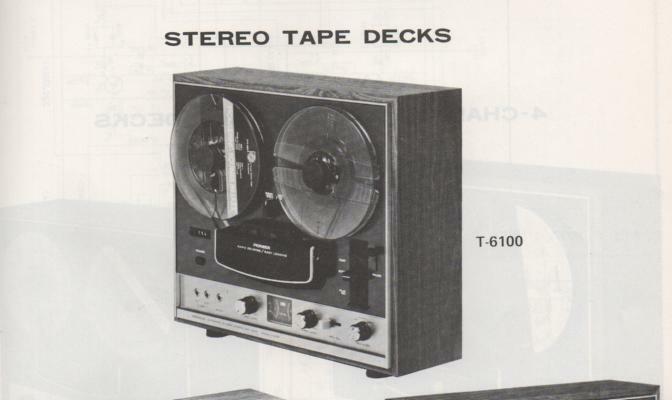 Comes with 1635 tape transport manual.. no tuner manual PHOTO COPY! 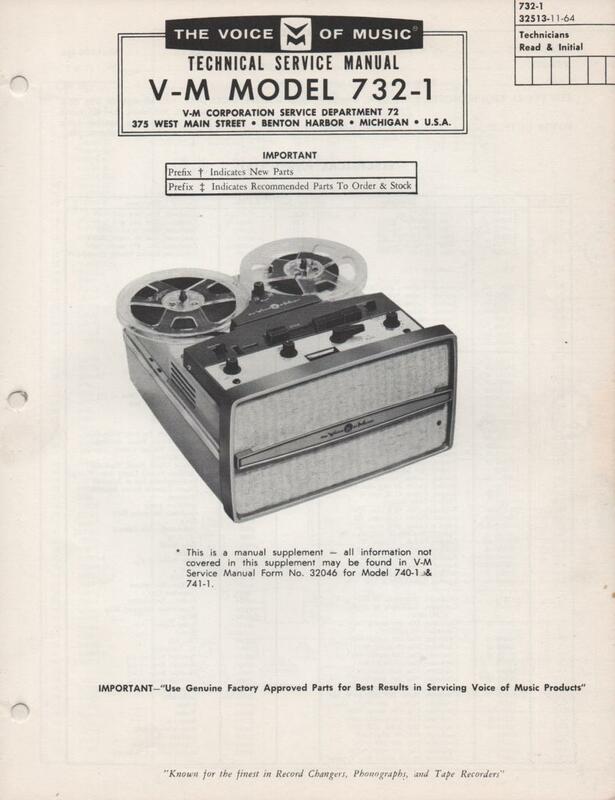 Manual VOICE OF MUSIC760-1 Reel to Reel Service Manual PHOTO COPY! Manual VOICE OF MUSIC710 711 750 Reel to Reel Service Manual PHOTO COPY! Manual VOICE OF MUSIC710A 711A 714 750A Reel to Reel Service Manual PHOTO COPY! 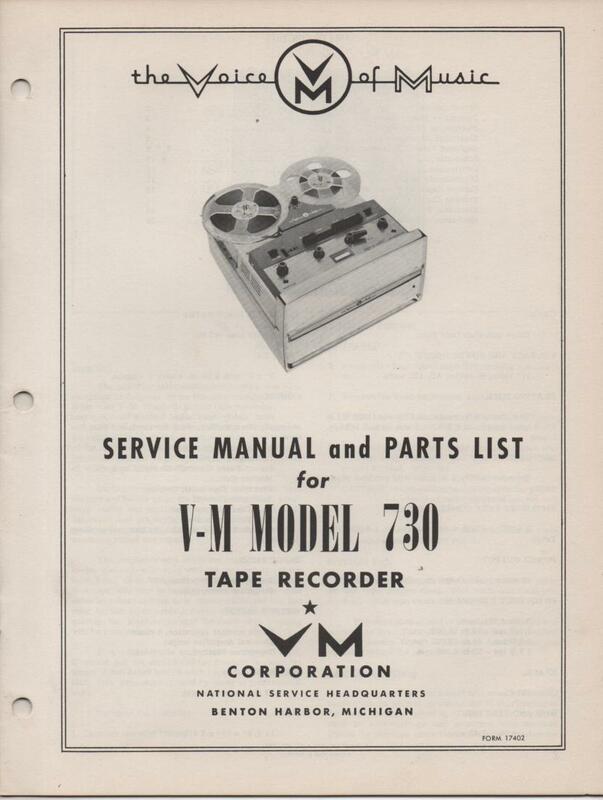 Manual VOICE OF MUSIC720 755 Reel to Reel Service Manual PHOTO COPY! 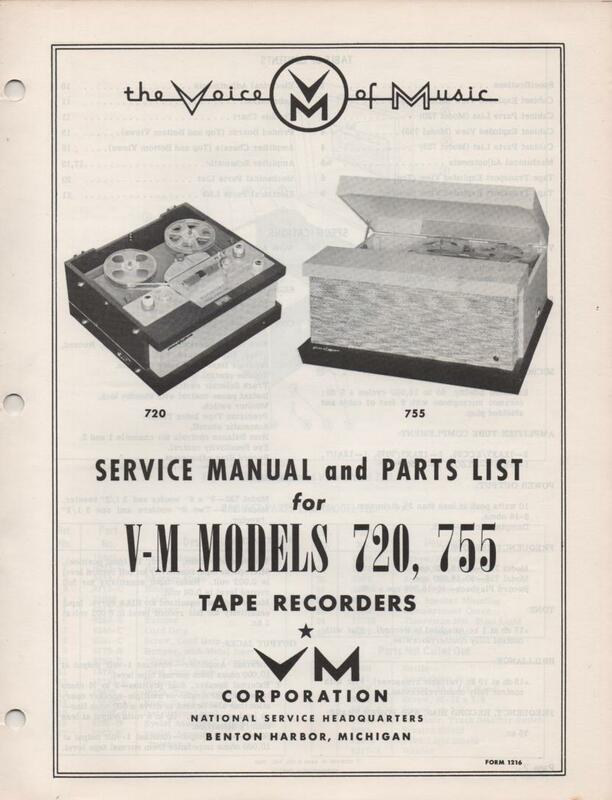 Manual VOICE OF MUSIC730 Reel to Reel Service Manual. 2 manuals PHOTO COPY! 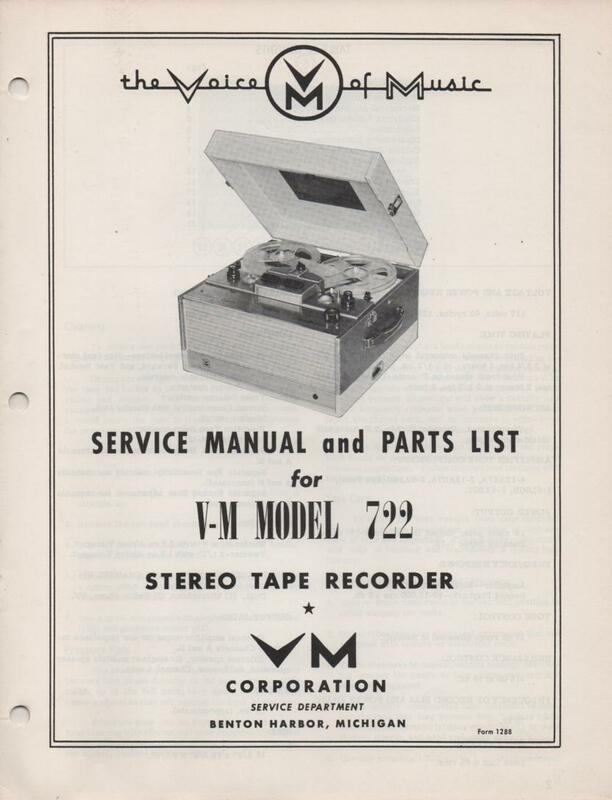 Manual VOICE OF MUSIC722 Reel to Reel Service Manual PHOTO COPY! 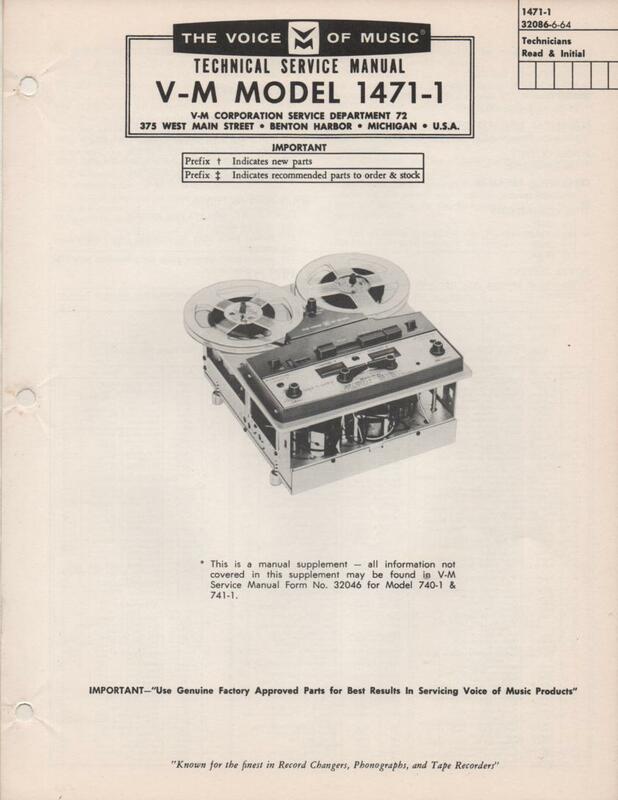 Manual VOICE OF MUSIC1471-1 Reel to Reel Service Manual. also comes woth 740-1 manual PHOTO COPY! 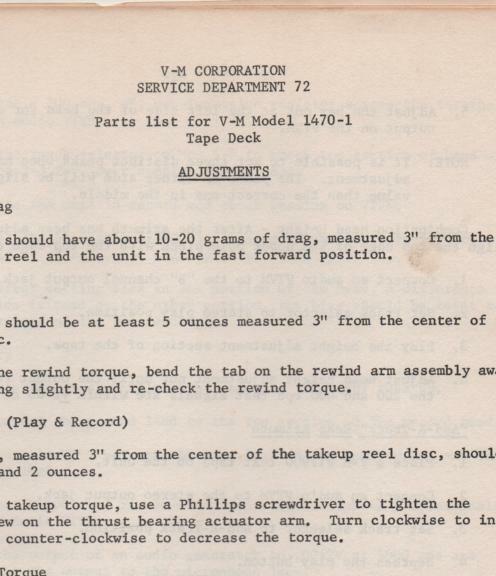 Manual VOICE OF MUSIC1481-1 Reel to Reel Service Manual. Comes with 740-1 741-1 manual PHOTO COPY! 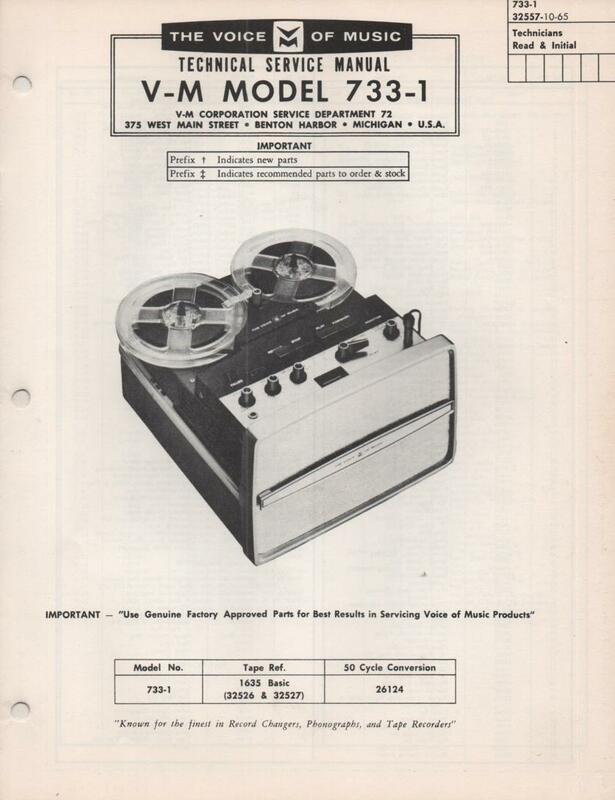 Manual VOICE OF MUSIC725 Reel to Reel Service Manual PHOTO COPY! Manual VOICE OF MUSIC730 Reel to Reel Service Manual PHOTO COPY! Manual VOICE OF MUSIC730-2 Reel to Reel Service Manual PHOTO COPY! Manual VOICE OF MUSIC730-3 Reel to Reel Service Manual PHOTO COPY! Manual VOICE OF MUSIC735 Reel to Reel Service Manual PHOTO COPY! Manual VOICE OF MUSIC735-1 736-1 Reel to Reel Service Manual PHOTO COPY! Manual VOICE OF MUSIC740-1 741-1 Reel to Reel Service Manual PHOTO COPY! 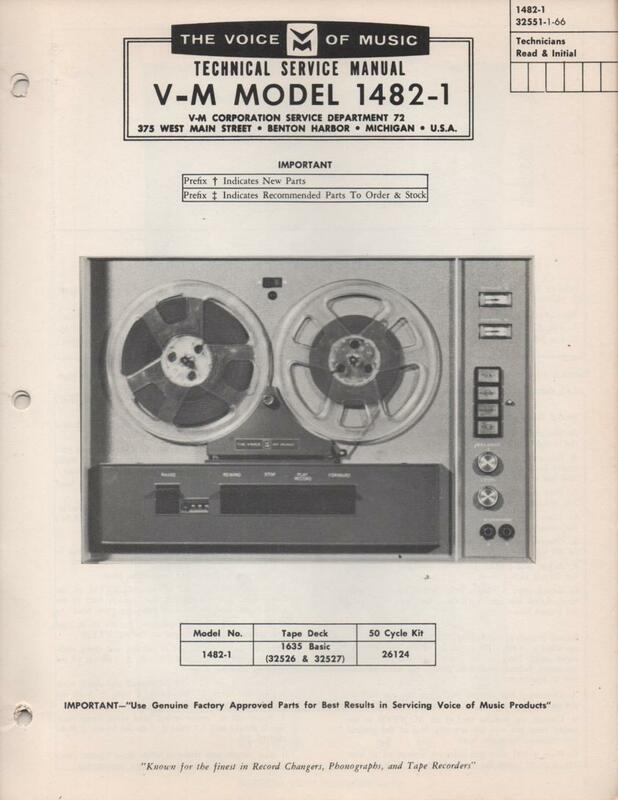 Manual VOICE OF MUSIC1470-1 Tuner Service Manual.. Use 735 Reel to Reel for complete manual PHOTO COPY! 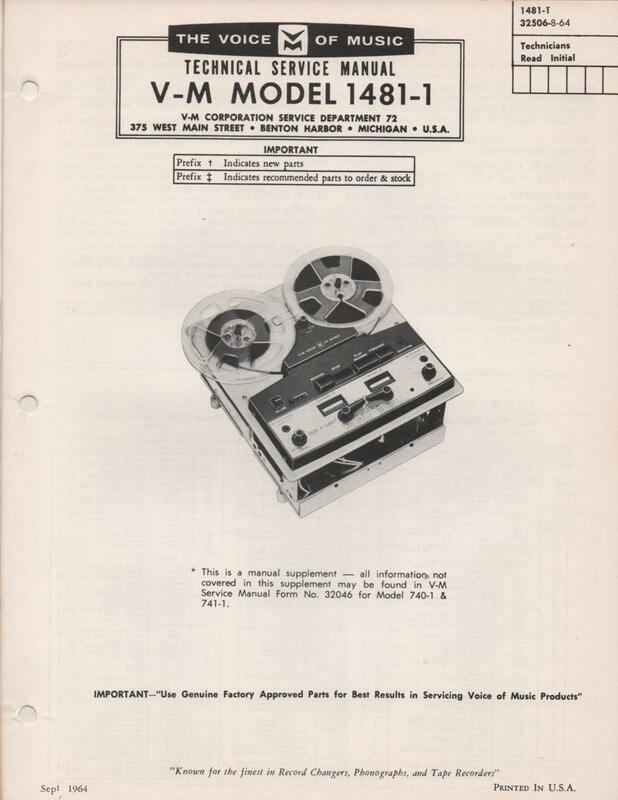 Manual VOICE OF MUSIC1482-1 Reel to Reel Service Manual. Comes with 1635 Basic manual PHOTO COPY! 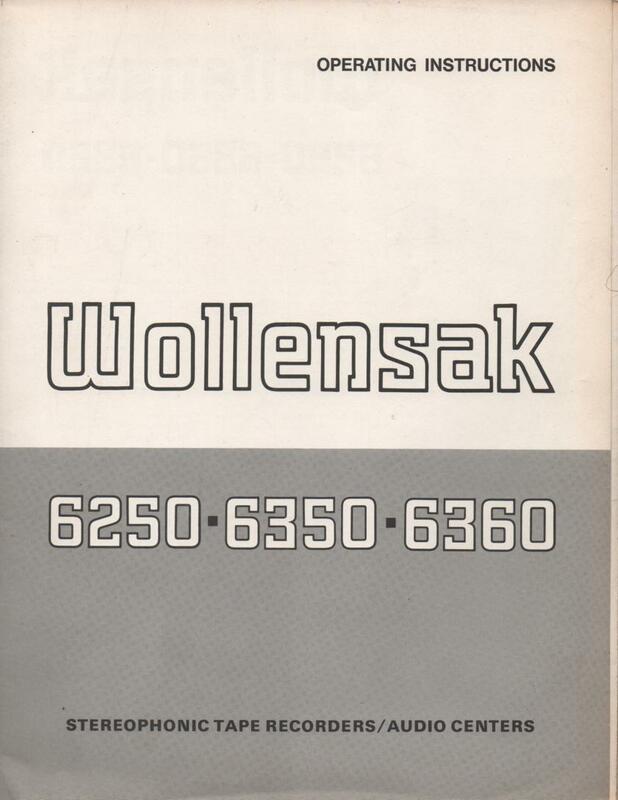 Manual WOLLENSAK5150 Cassette Tape Recorder Service Manual PHOTO COPY! 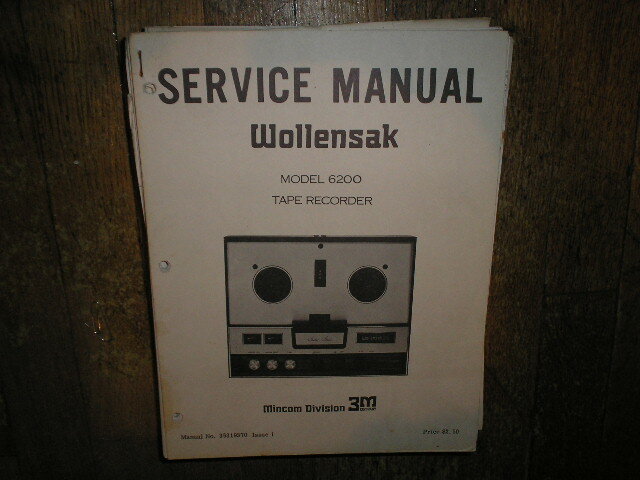 Manual WOLLENSAK5200 5250 5280 5300 Reel to Reel Service Manual PHOTO COPY! 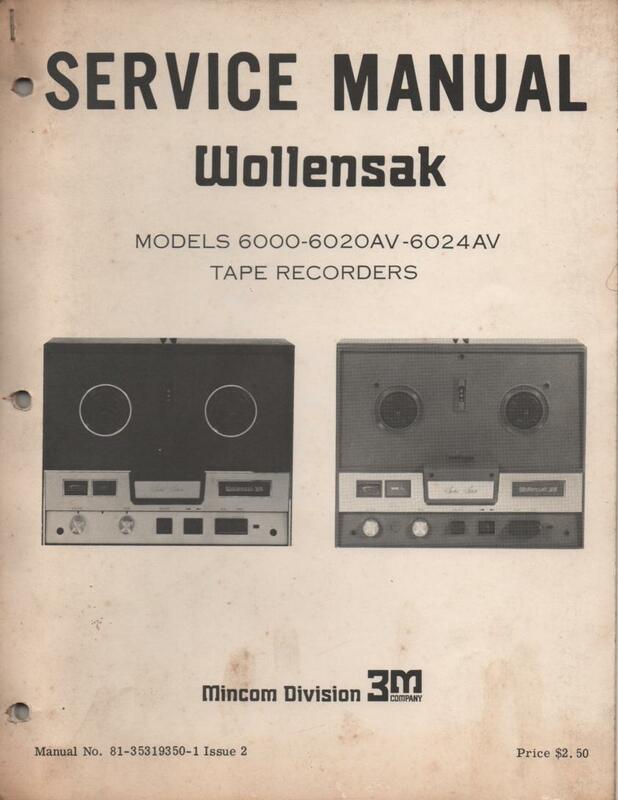 Manual WOLLENSAK6000 6020 Reel to Reel Service Manual PHOTO COPY! 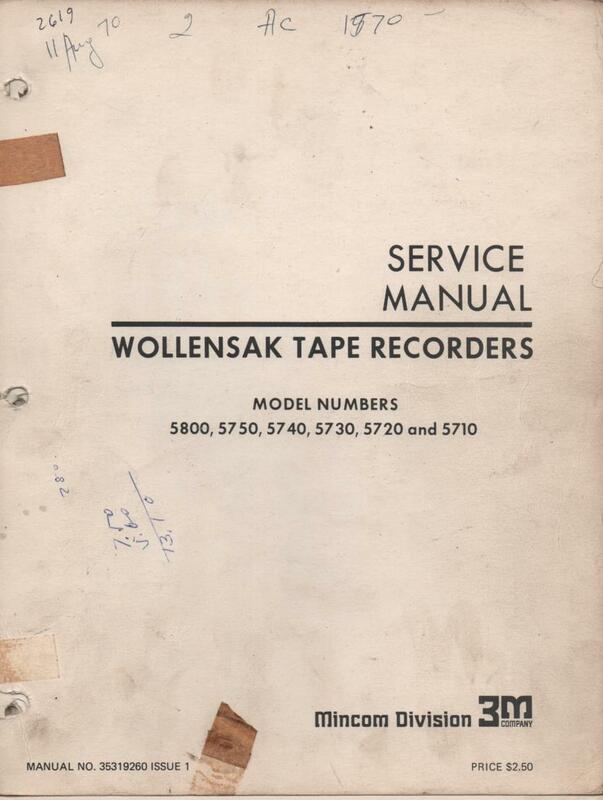 Manual WOLLENSAK6100 6120 Reel to Reel Service Manual PHOTO COPY! 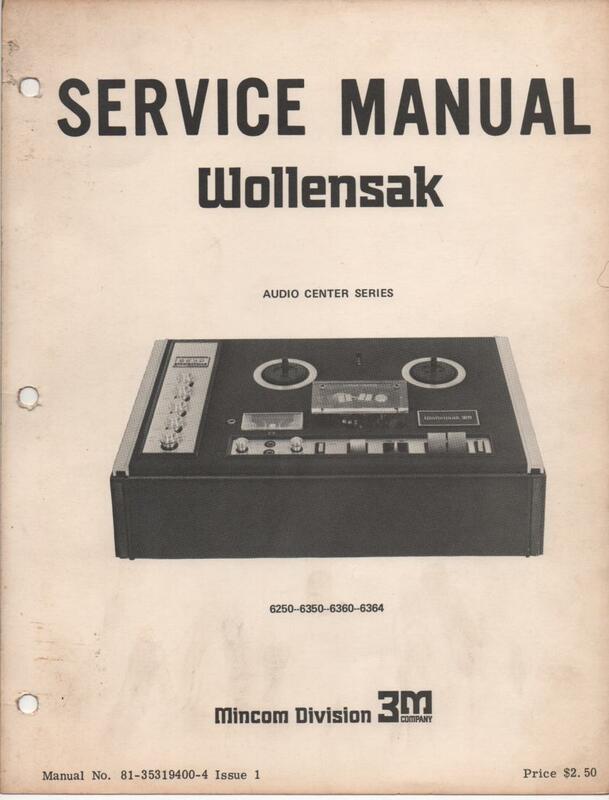 Manual WOLLENSAK6200 Reel to Reel Service Manual PHOTO COPY! 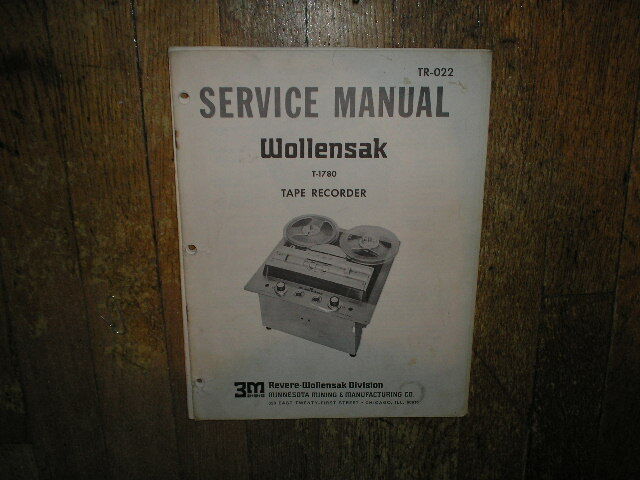 Manual WOLLENSAK1780 Reel to Reel Service Manual PHOTO COPY! 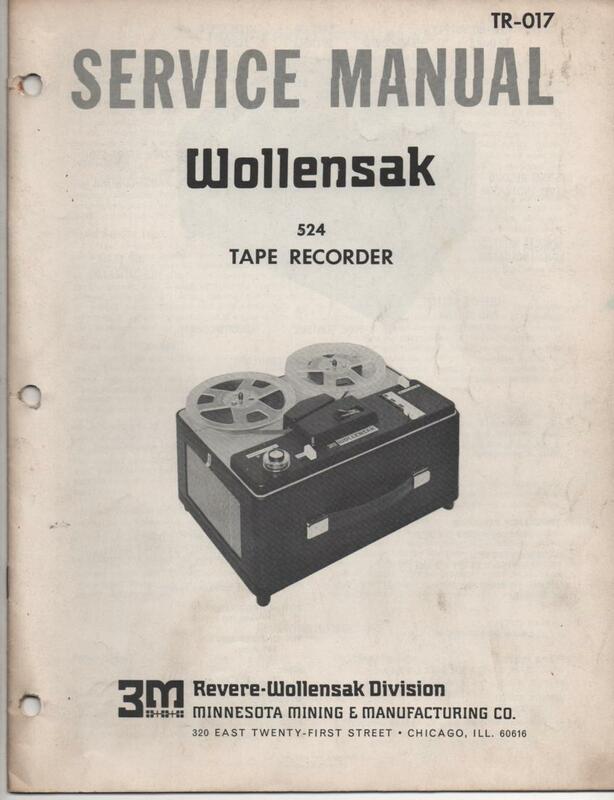 Manual WOLLENSAK524 Reel to Reel Tape Recorder Service Manual PHOTO COPY! Manual WOLLENSAK1220 Reel to Reel Tape Recorder Service Manual PHOTO COPY! 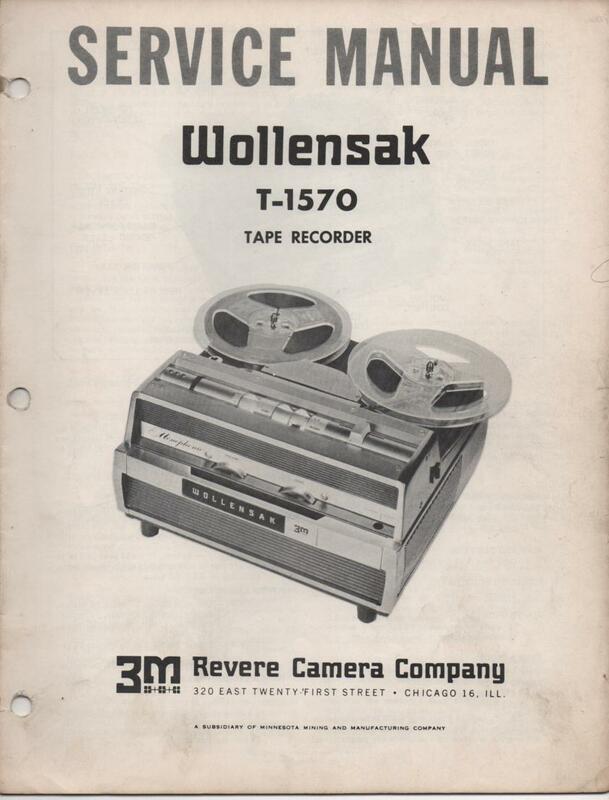 Manual WOLLENSAK1500AV Reel to Reel Tape Recorder Service Manual PHOTO COPY! 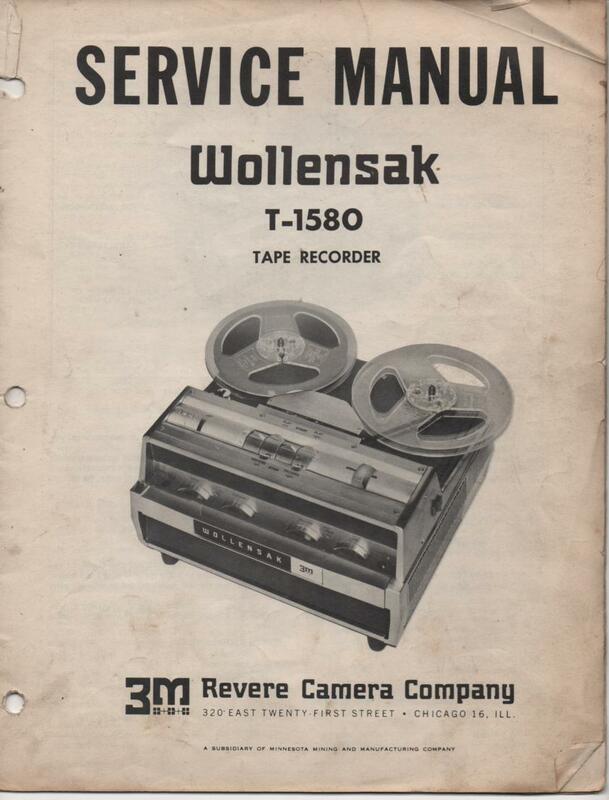 Manual WOLLENSAK1500SS 9503 9509 Reel to Reel Tape Recorder Service Manual PHOTO COPY! 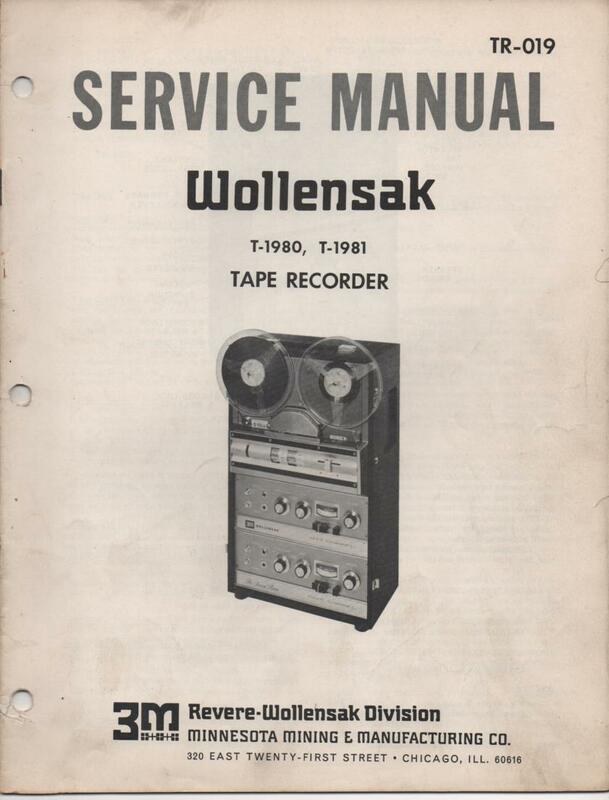 Manual WOLLENSAK5710 5720 5730 5740 5750 5800 Reel to Reel Tape Recorder Service Manual PHOTO COPY! 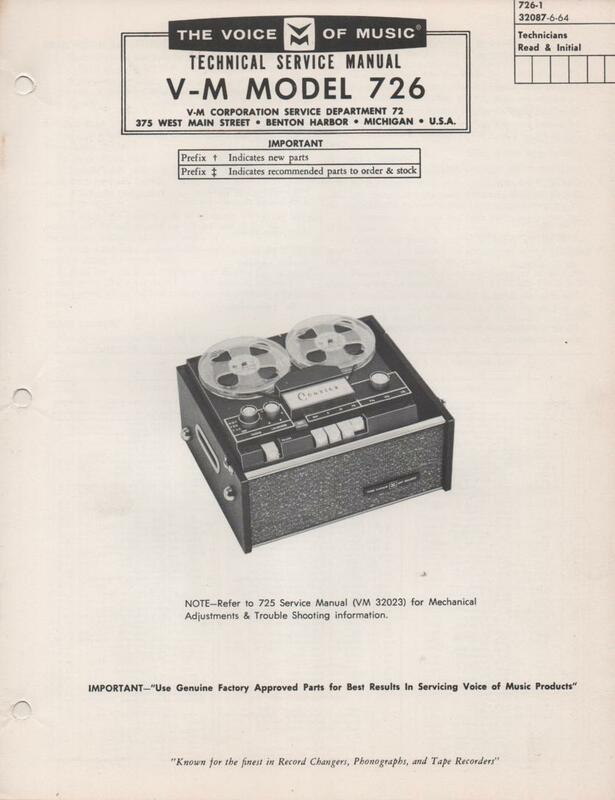 Manual WOLLENSAK6000 6020AV 6024AV Reel to Reel Tape Recorder Service Manual PHOTO COPY! 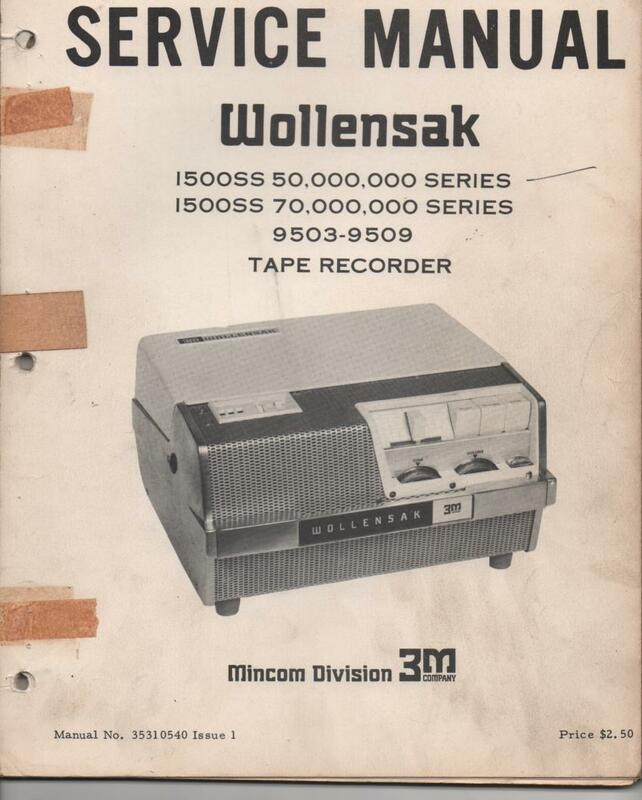 Manual WOLLENSAK6250 6350 6360 Reel to Reel Tape Recorder Owners Operating Instruction Manual PHOTO COPY! 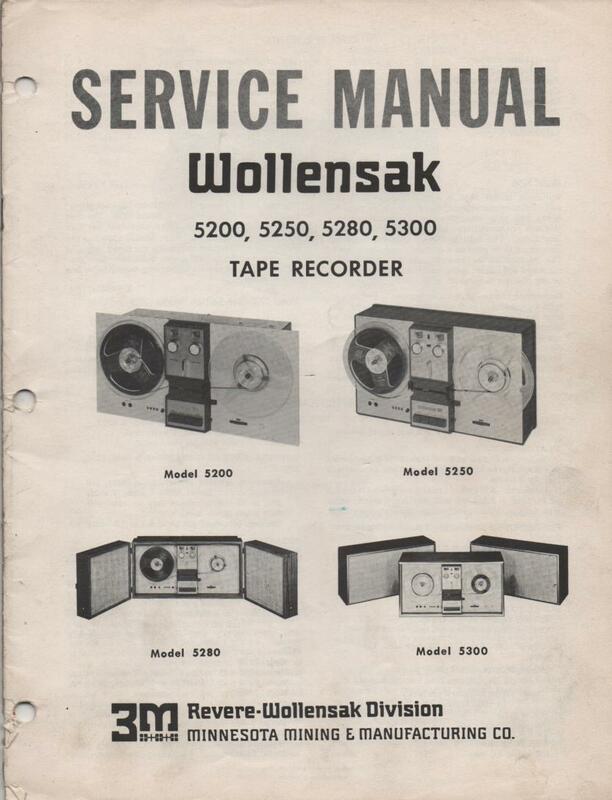 Manual WOLLENSAK6250 6350 6360 Reel to Reel Tape Recorder Service Manual PHOTO COPY! 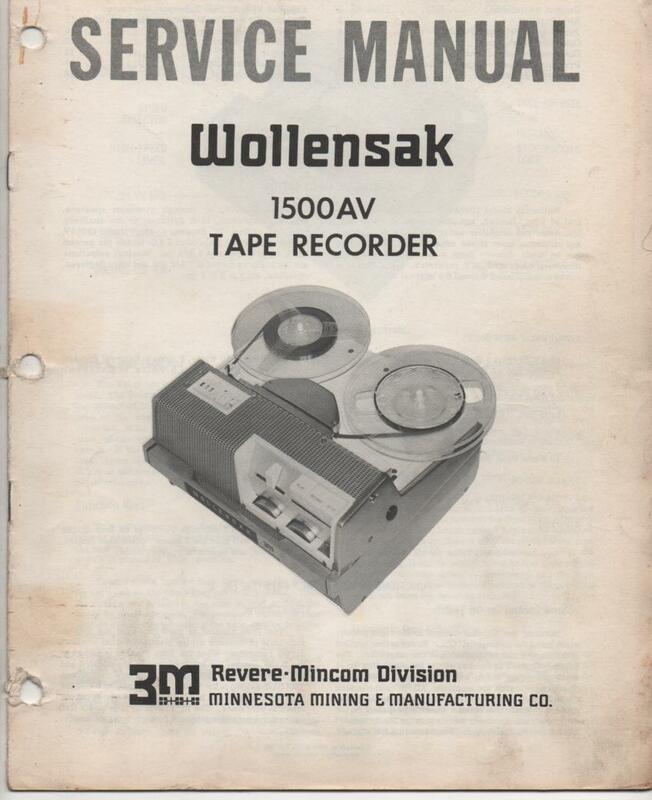 Manual WOLLENSAKT-1500 T-1500U T-1515-4 TS-1520 T-1700 Reel to Reel Tape Recorder Service Manual PHOTO COPY! 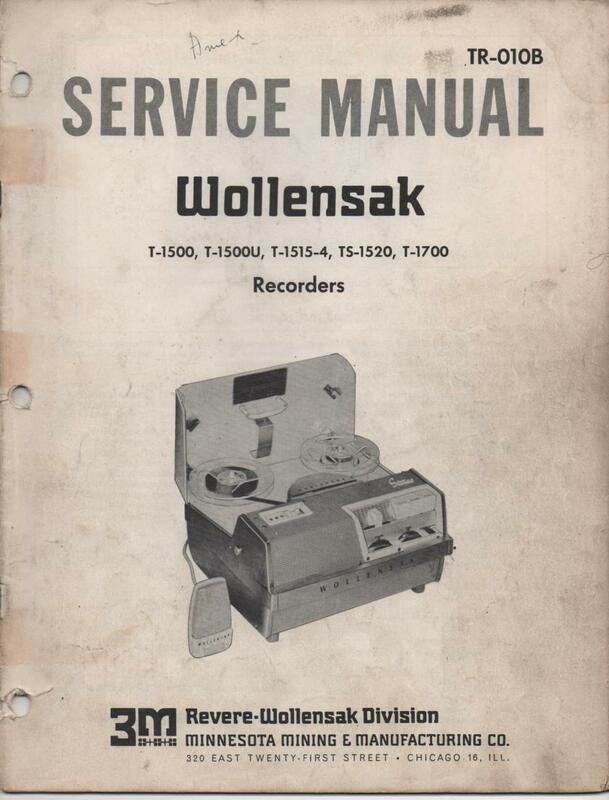 Manual WOLLENSAKT-1570 Reel to Reel Tape Recorder Service Manual PHOTO COPY! 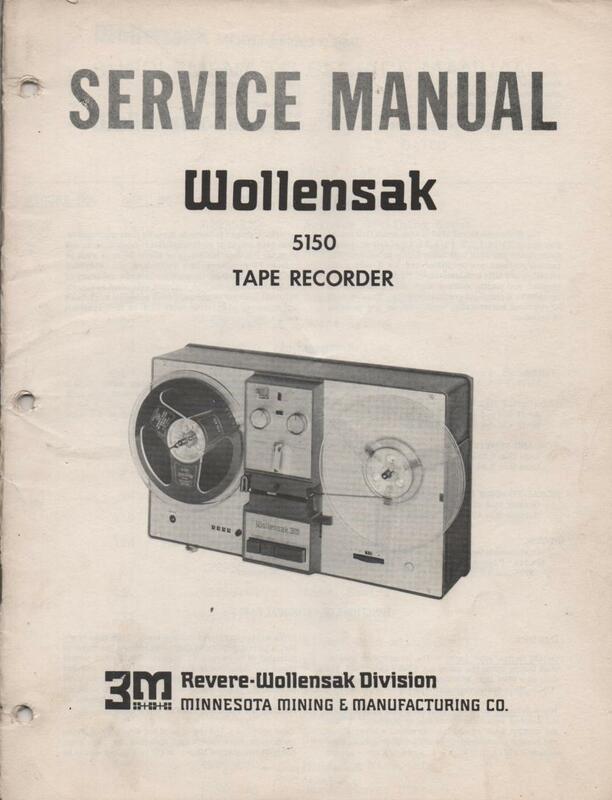 Manual WOLLENSAKT-1580 Reel to Reel Tape Recorder Service Manual PHOTO COPY! Manual WOLLENSAKT-1980 T-1981 Reel to Reel Tape Recorder Service Manual PHOTO COPY! 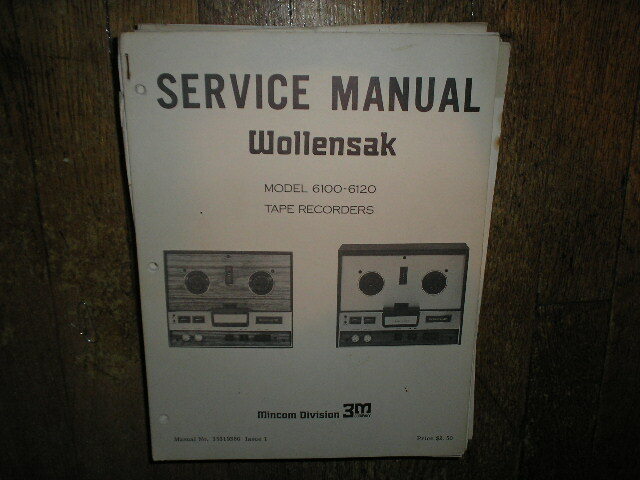 Manual WOLLENSAKT-2000 T-2005 T-2025 T-2200 T-2205 T-2225 Reel to Reel Tape Recorder Service Manual PHOTO COPY! 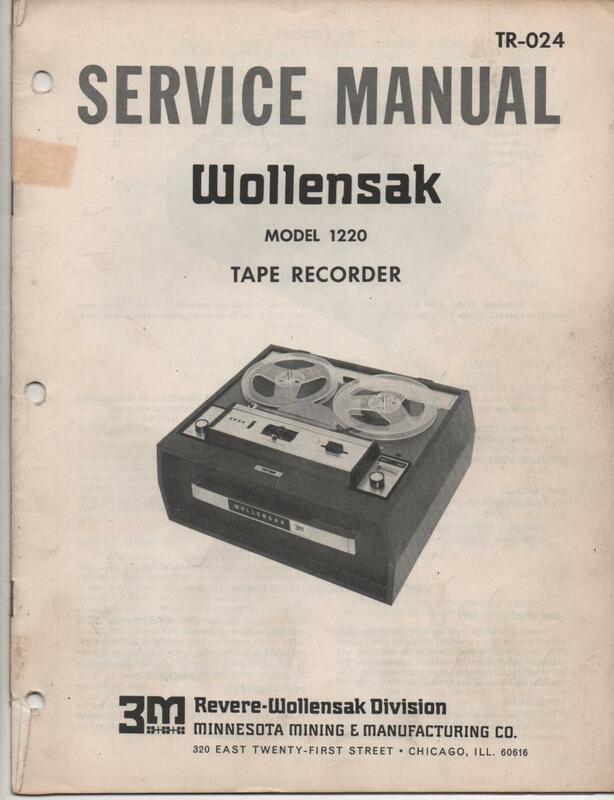 Manual WOLLENSAKT-2200-C Reel to Reel Tape Recorder Service Manual PHOTO COPY! 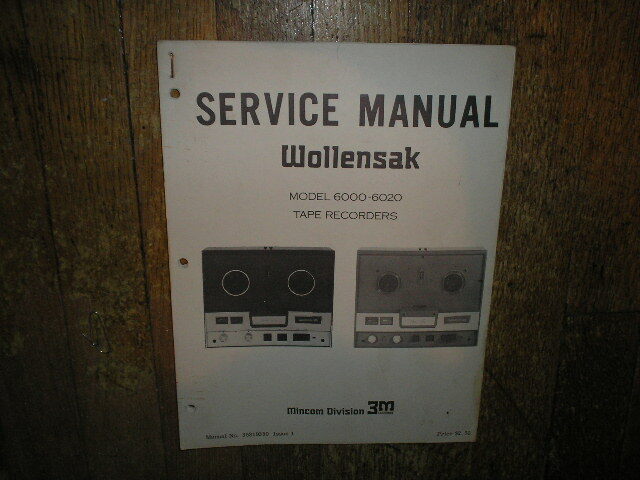 Manual WOLLENSAKT-3000 Reel to Reel Tape Recorder Service Manual PHOTO COPY!